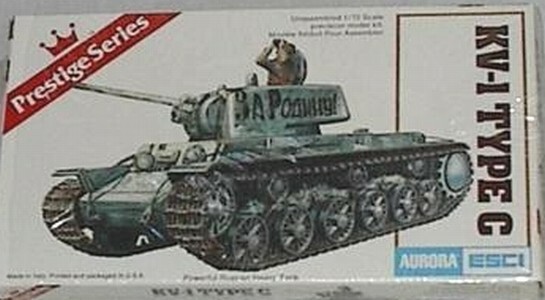 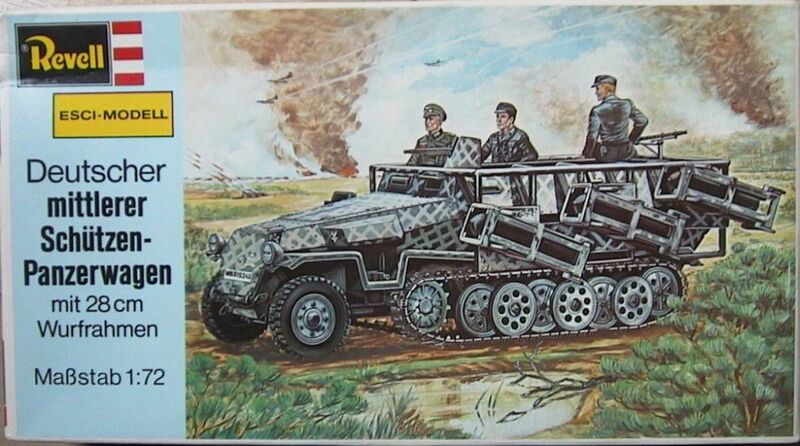 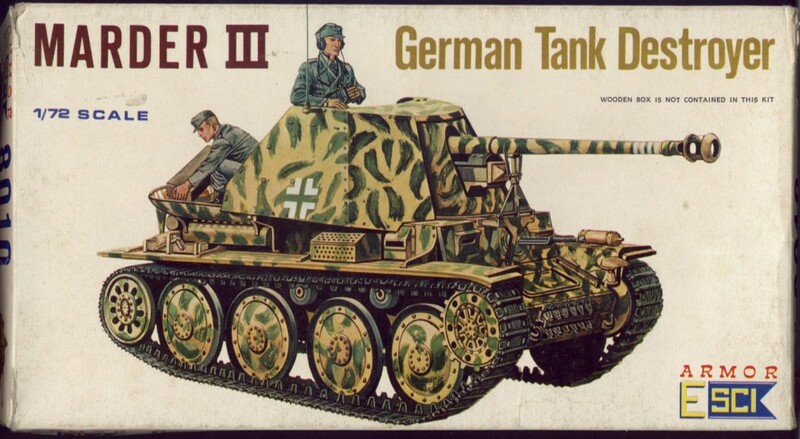 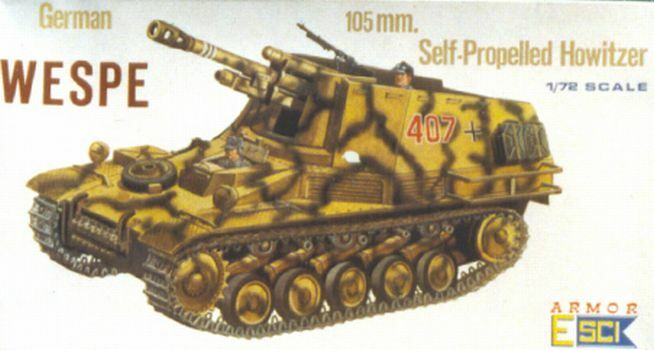 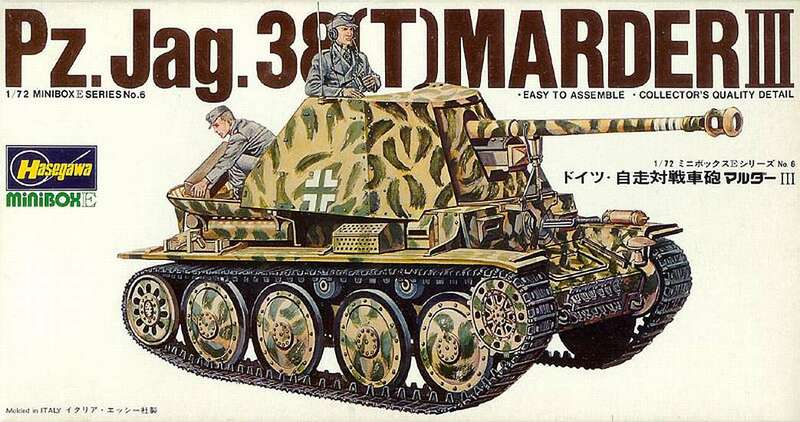 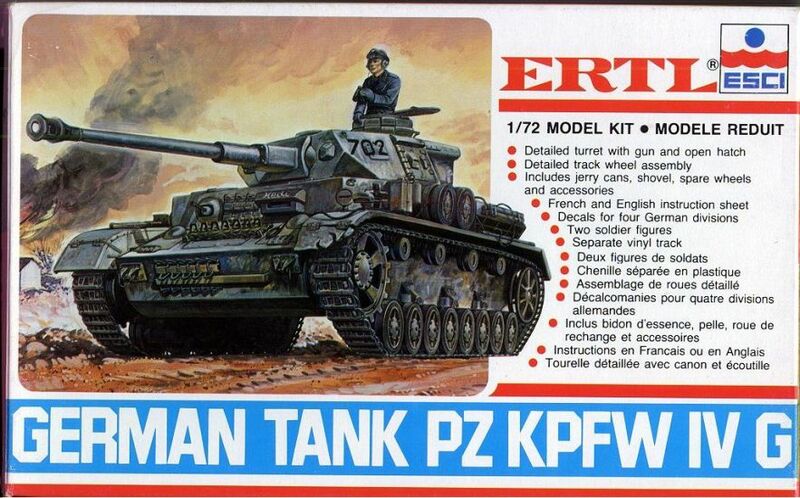 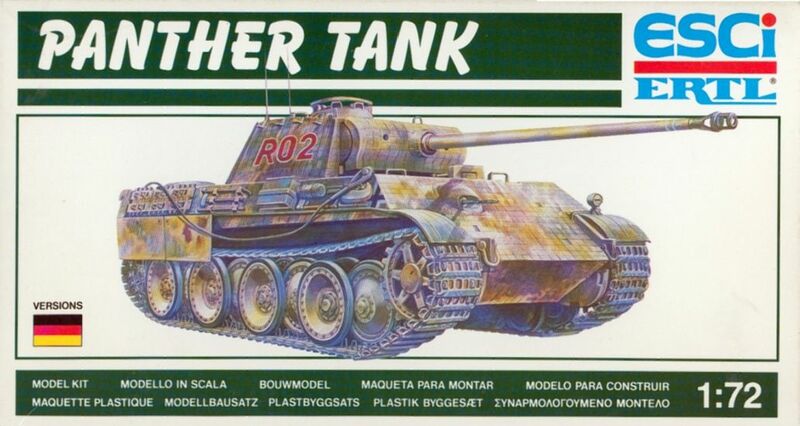 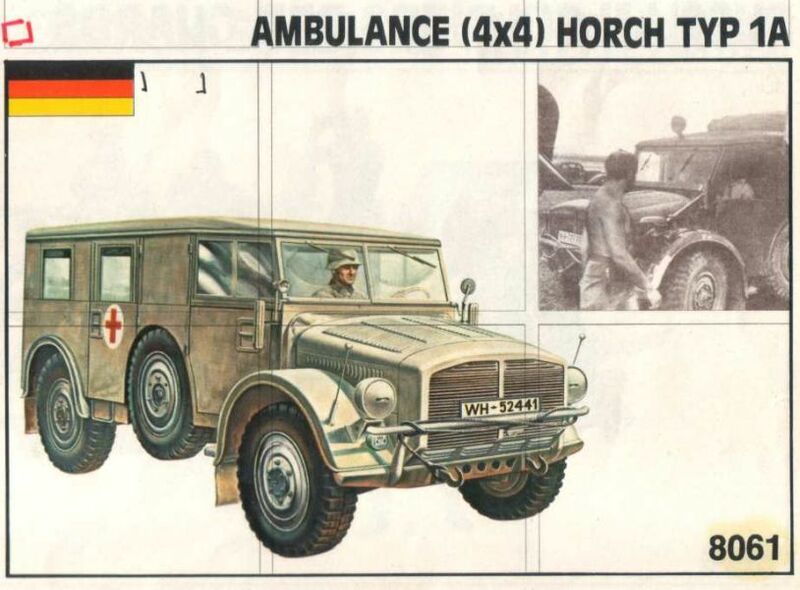 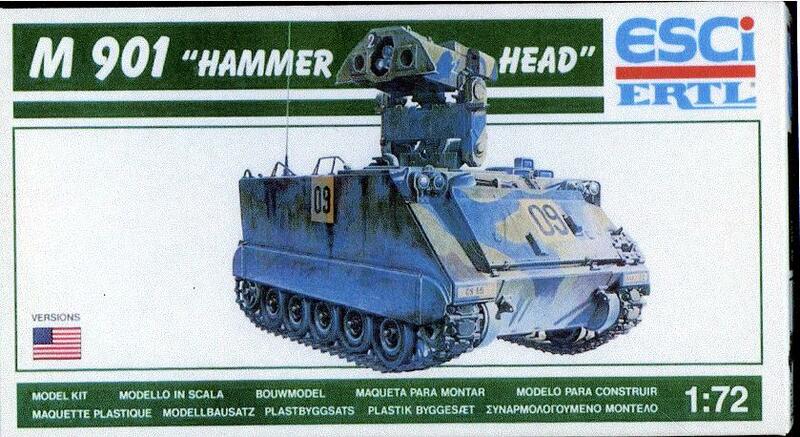 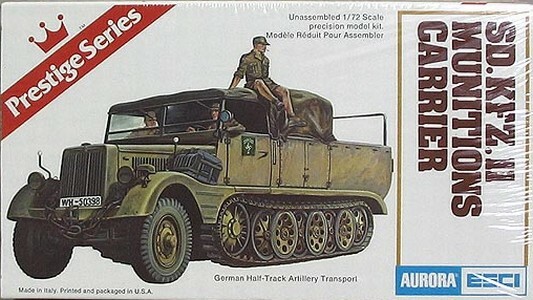 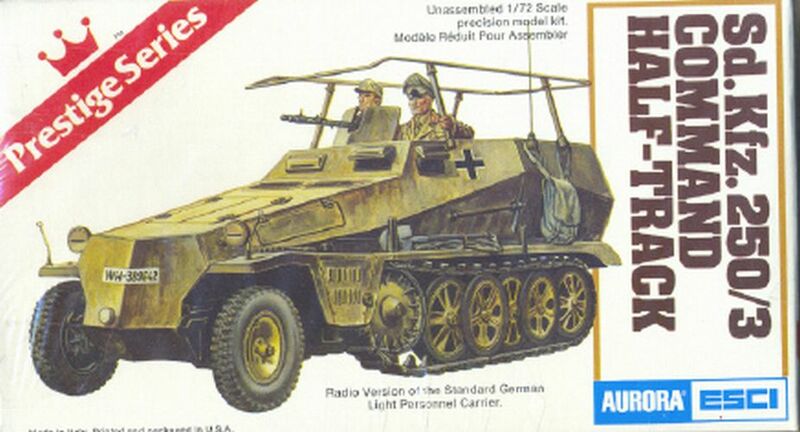 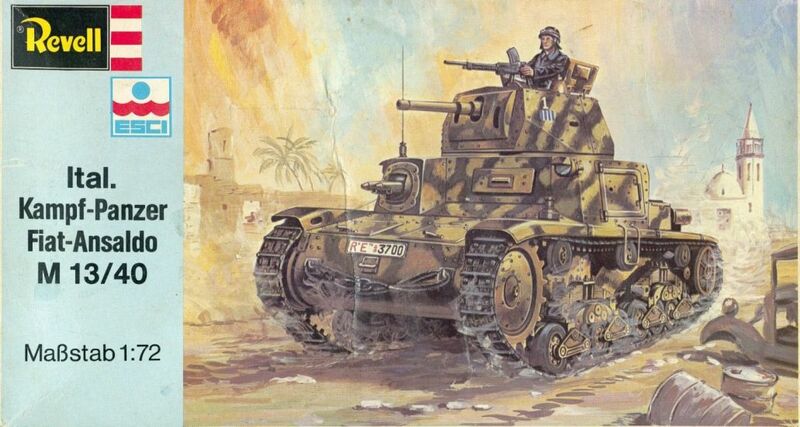 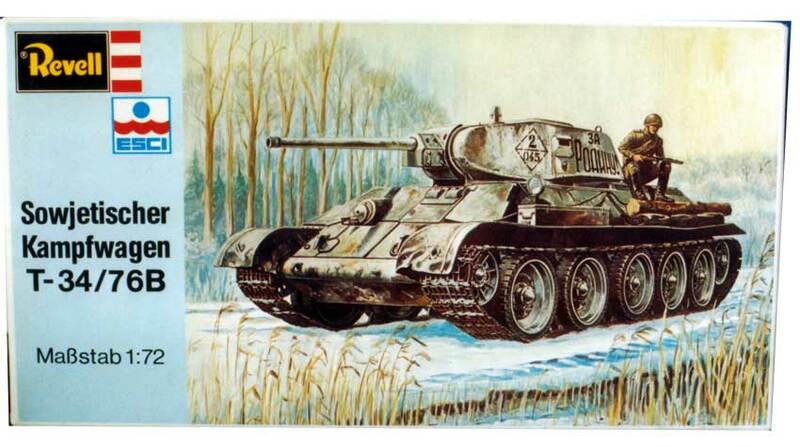 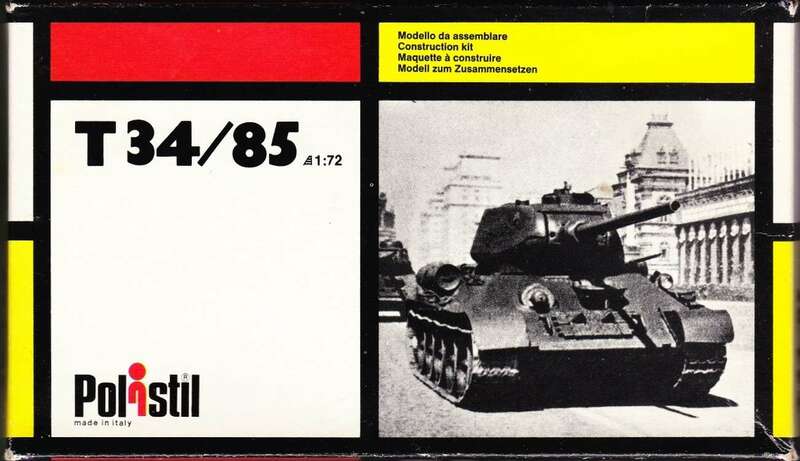 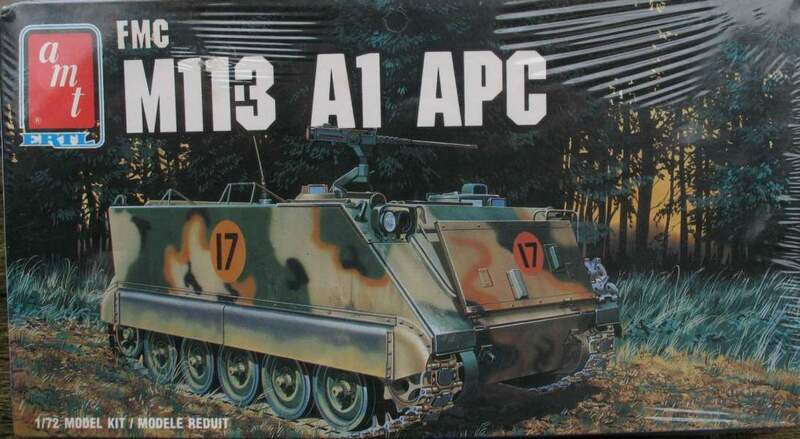 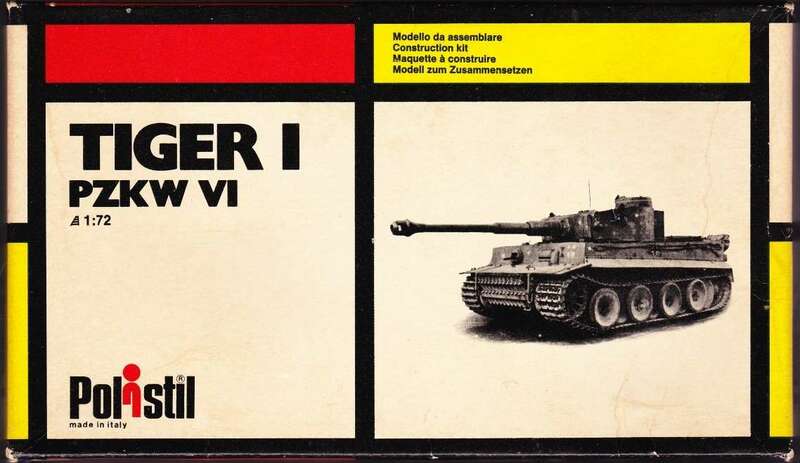 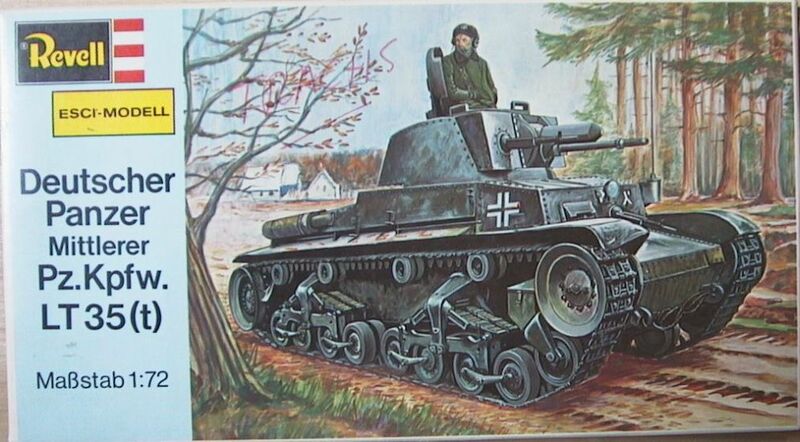 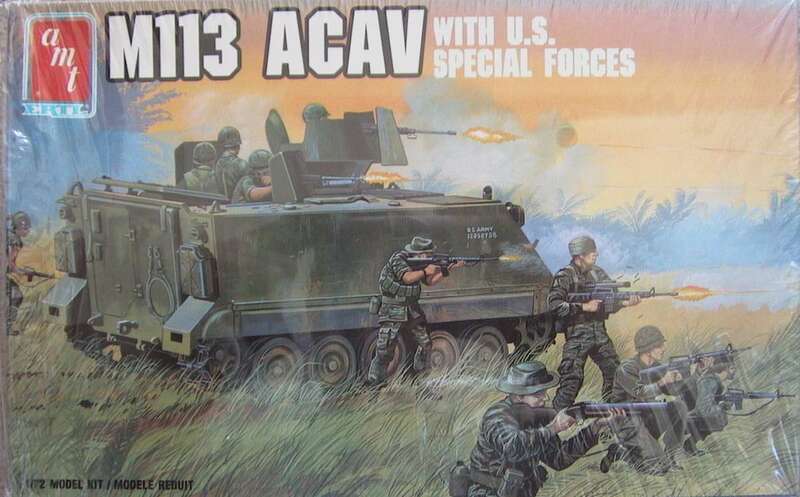 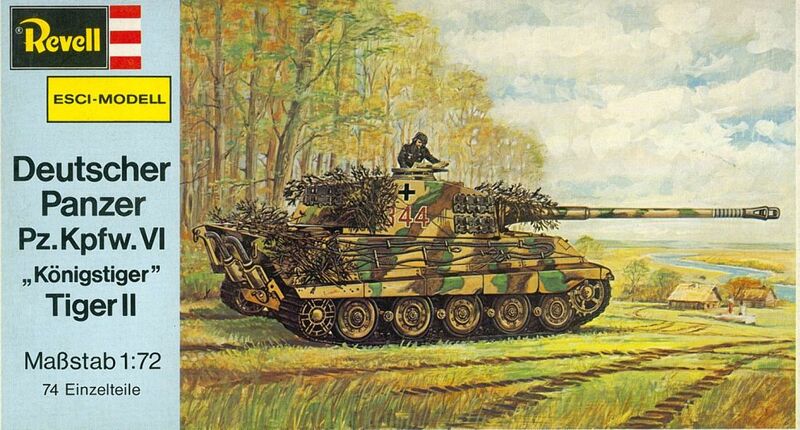 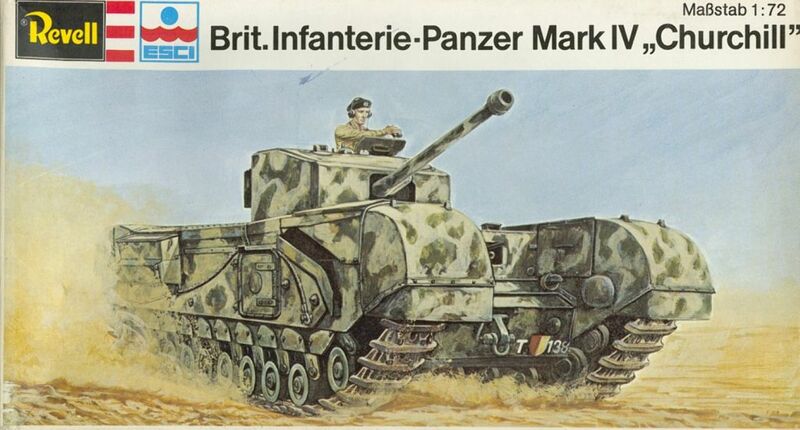 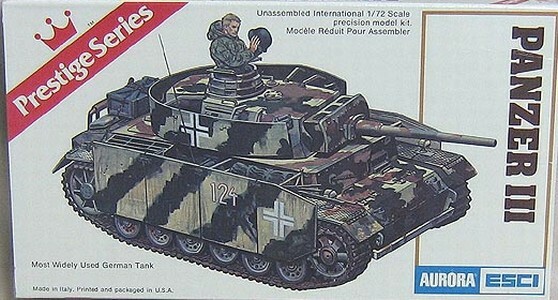 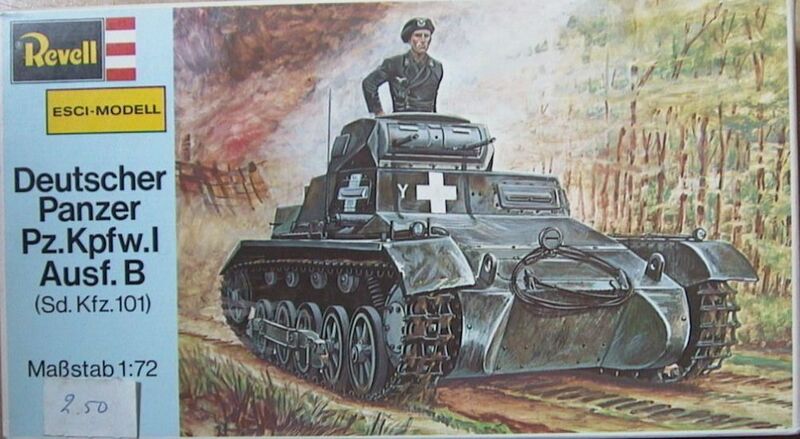 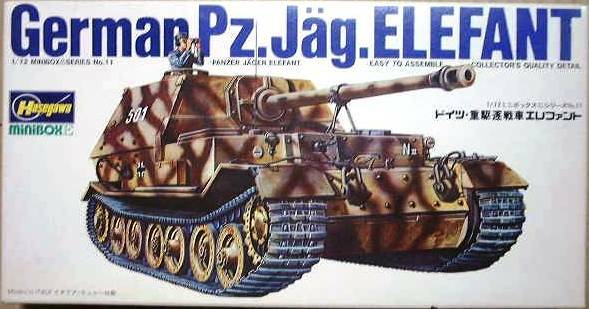 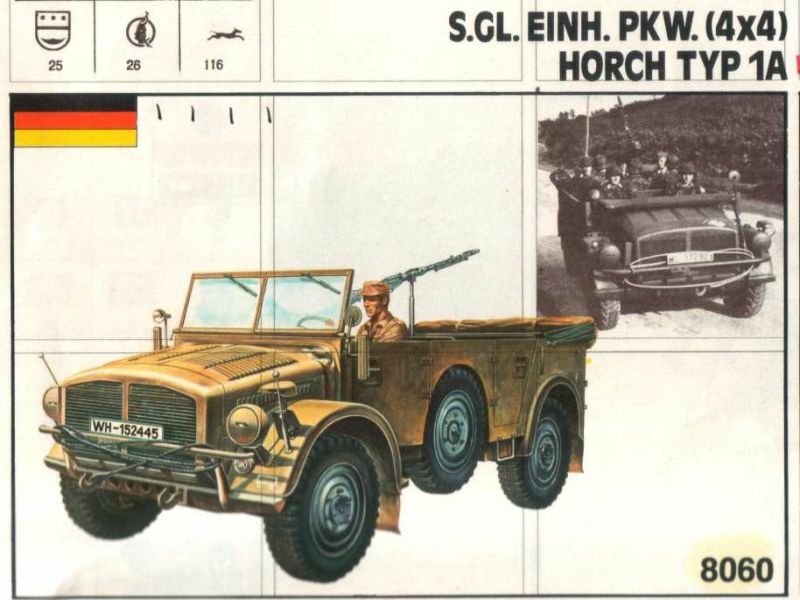 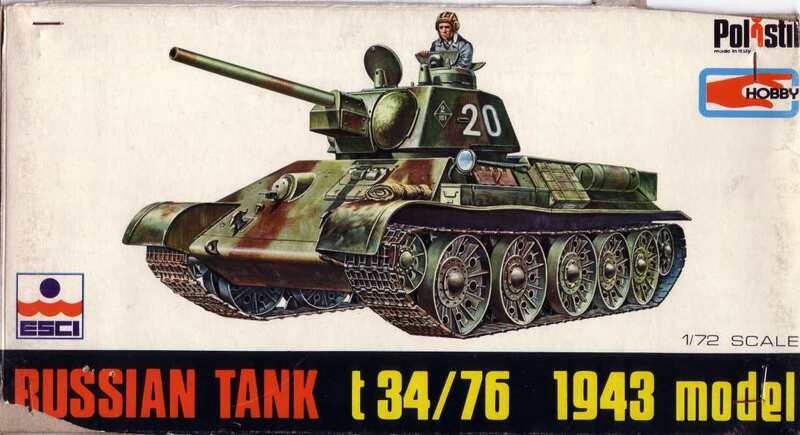 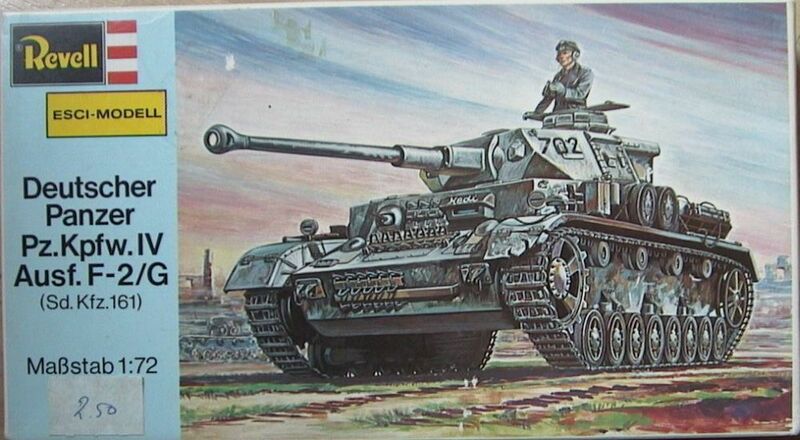 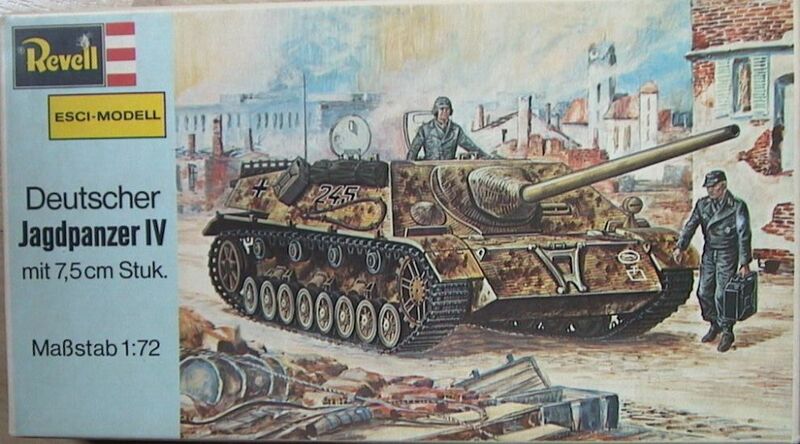 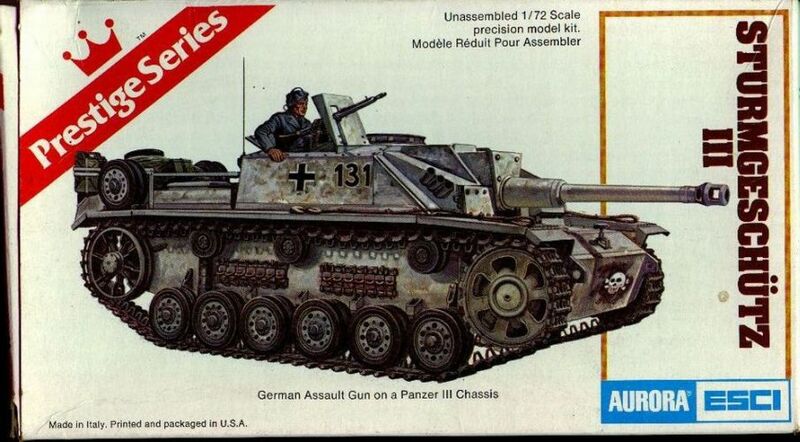 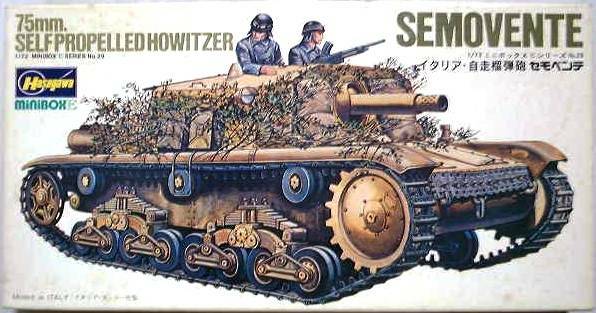 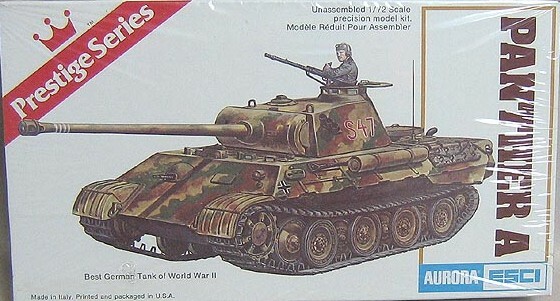 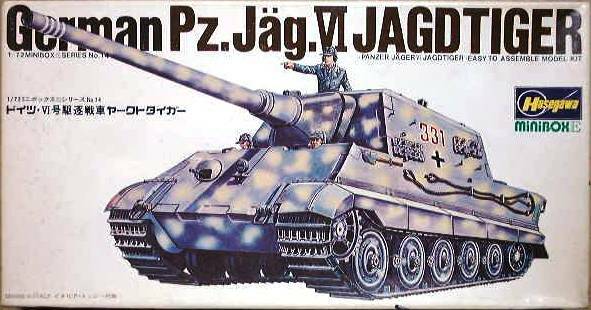 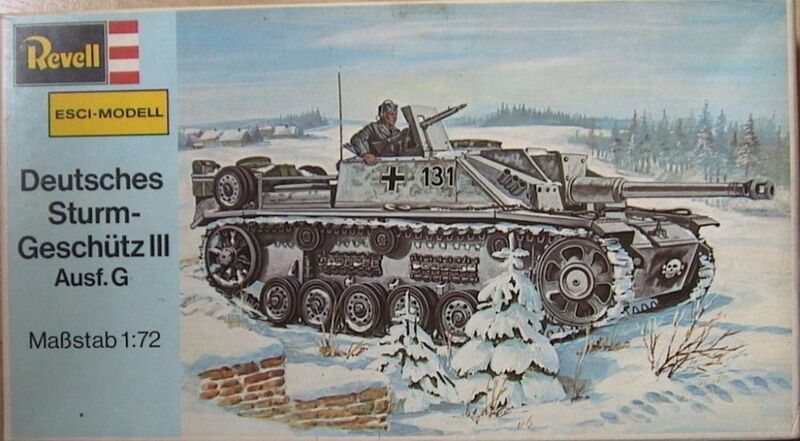 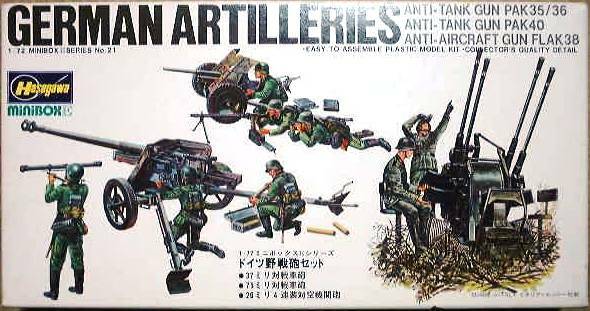 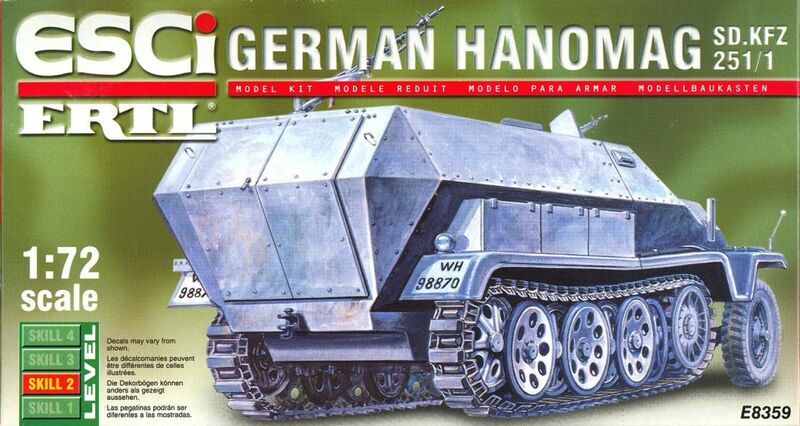 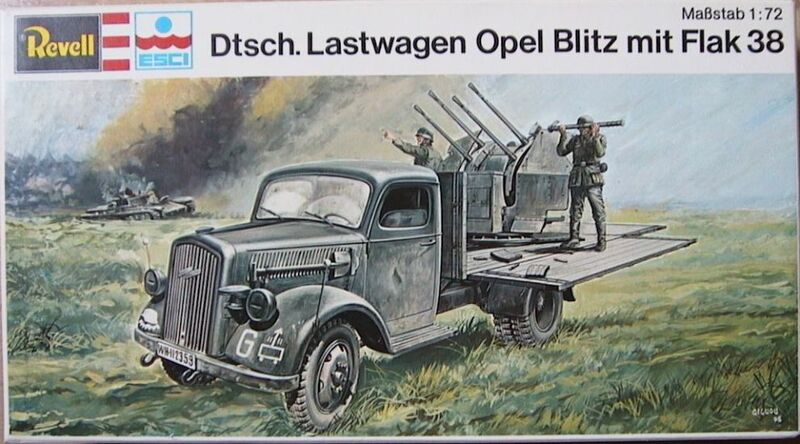 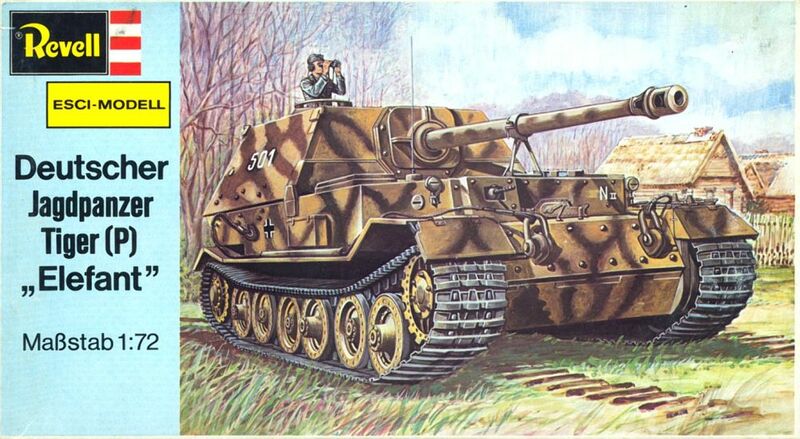 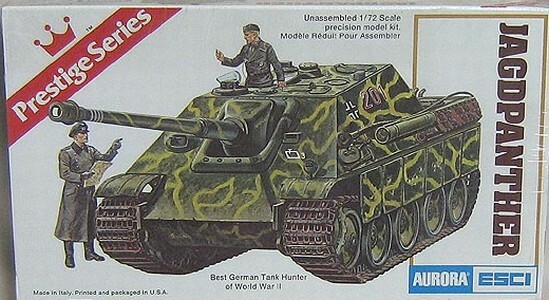 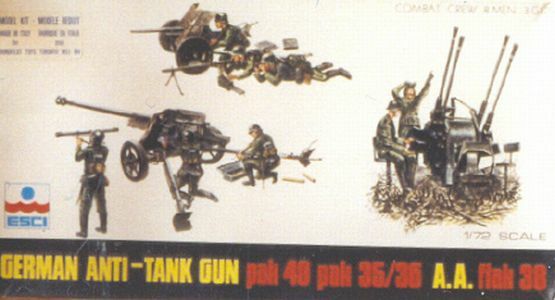 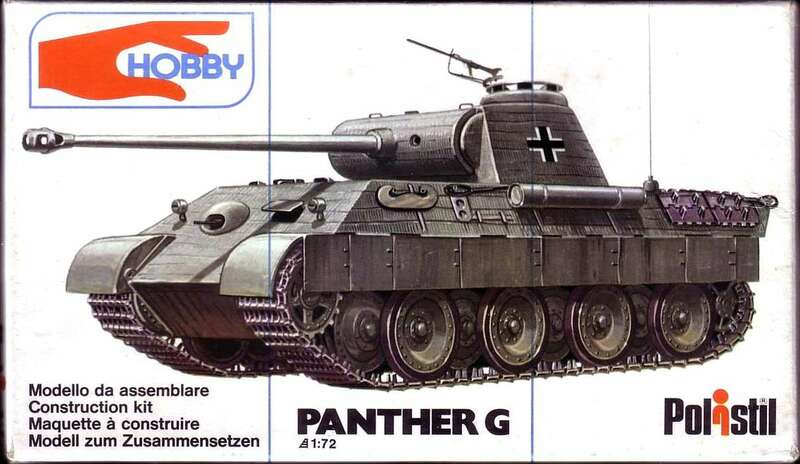 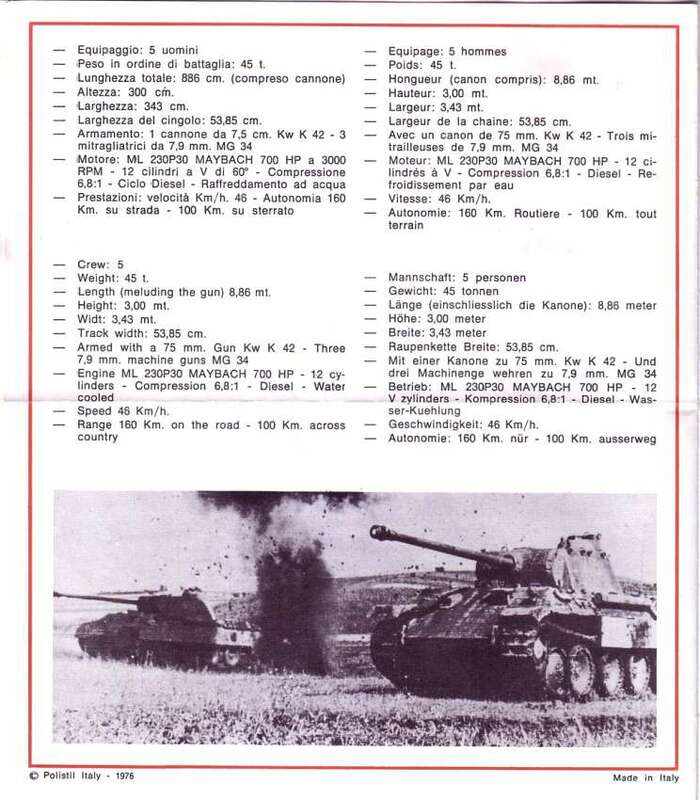 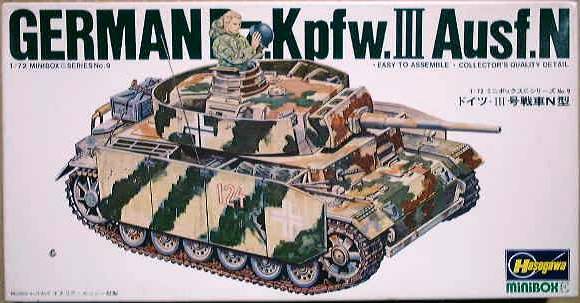 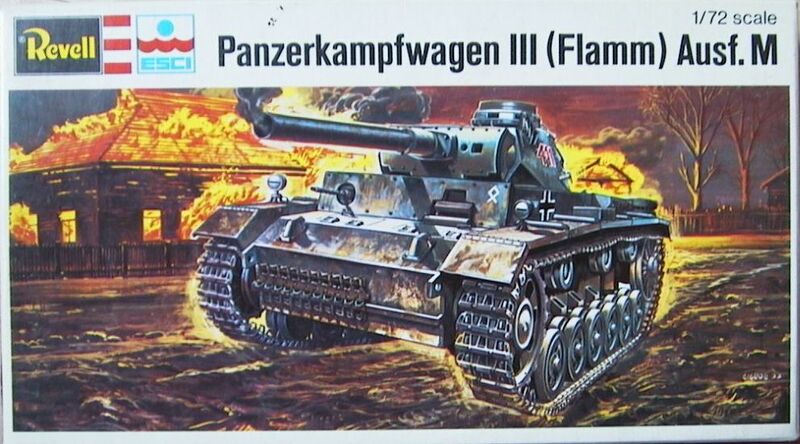 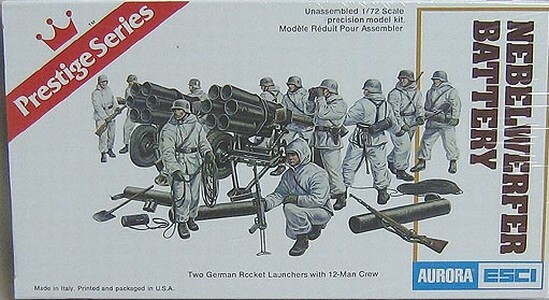 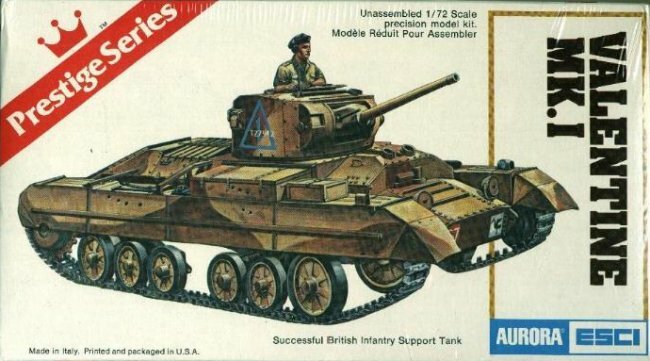 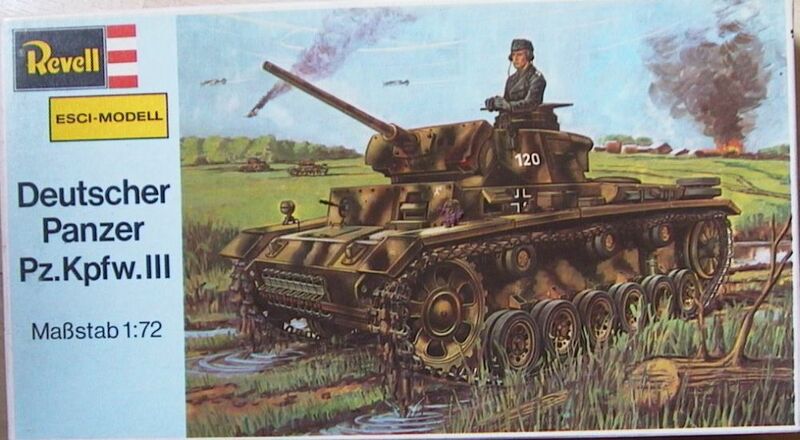 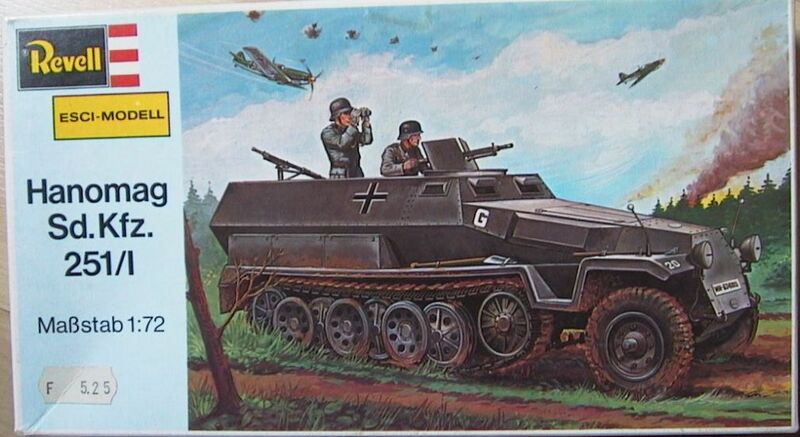 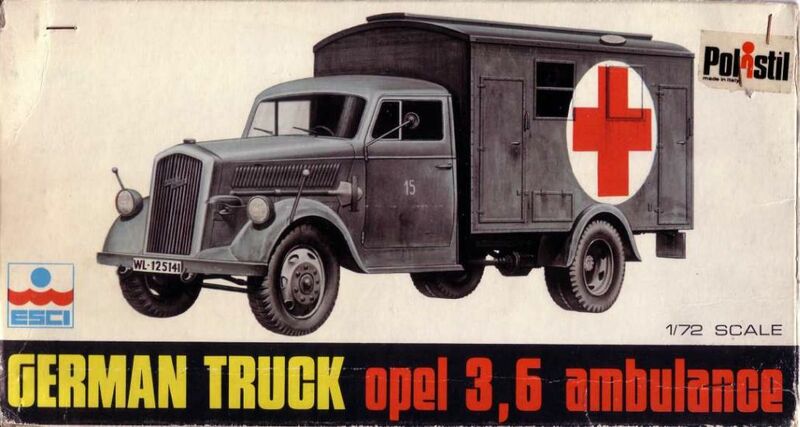 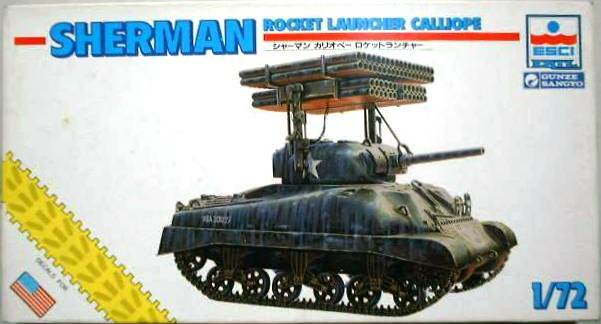 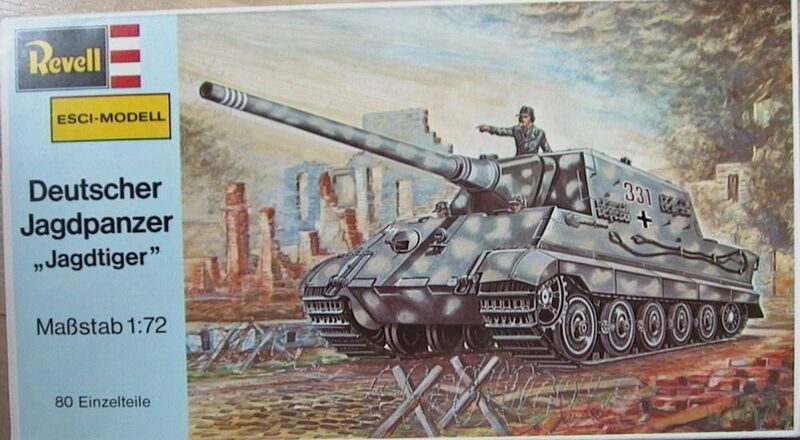 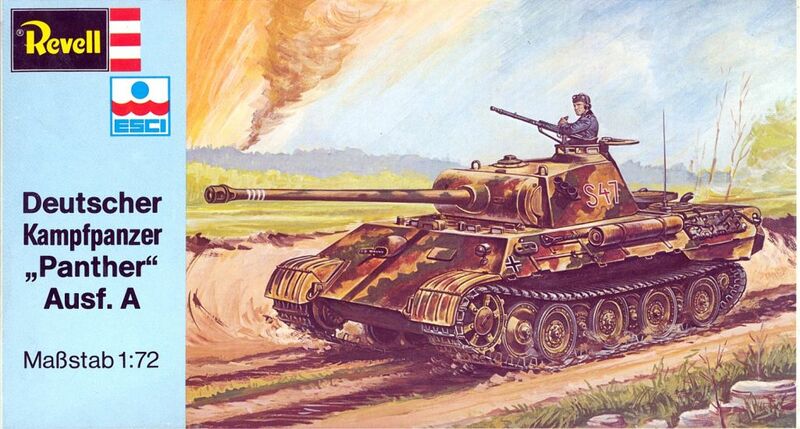 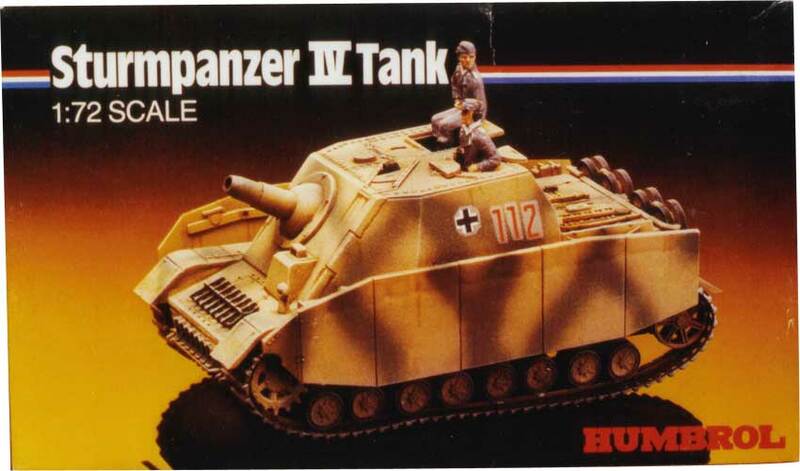 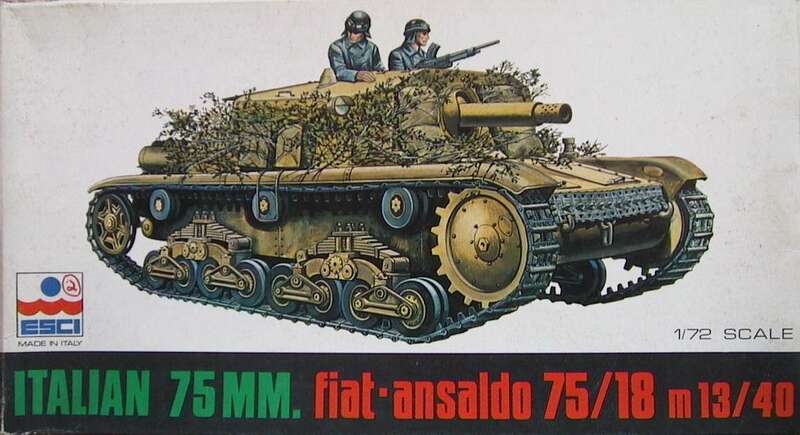 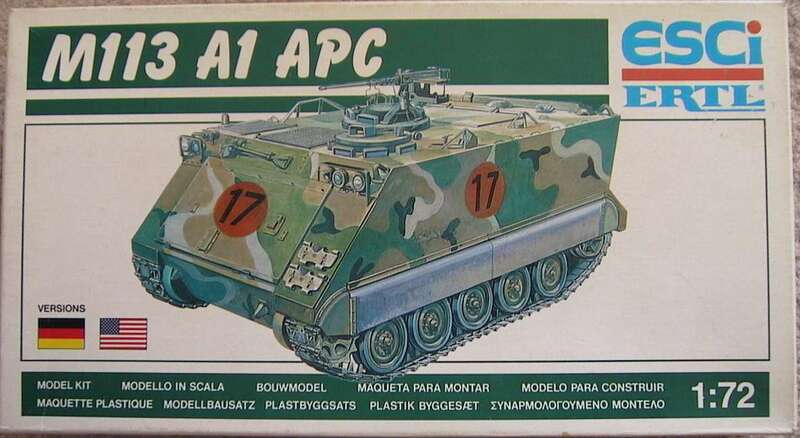 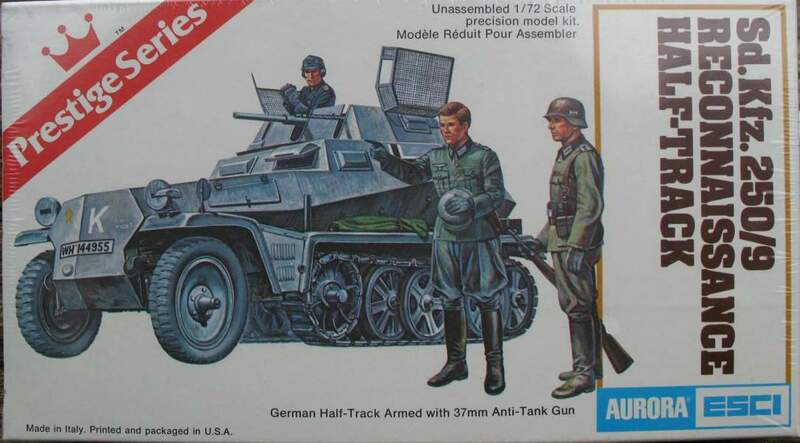 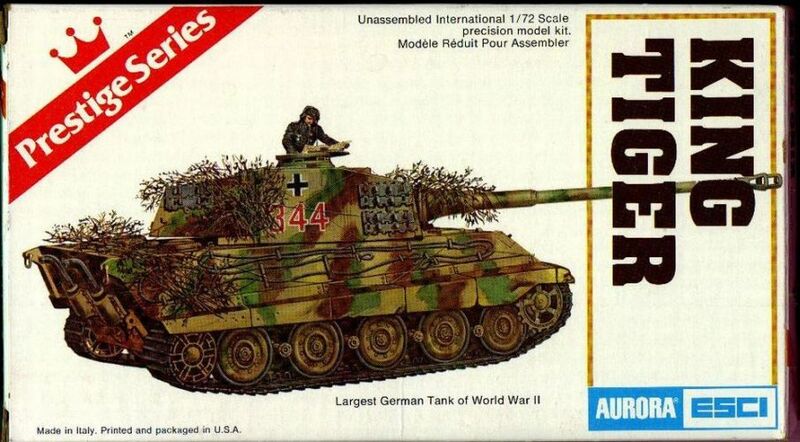 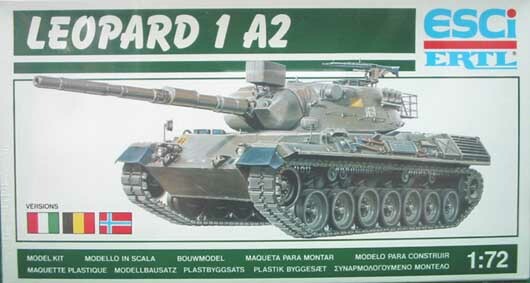 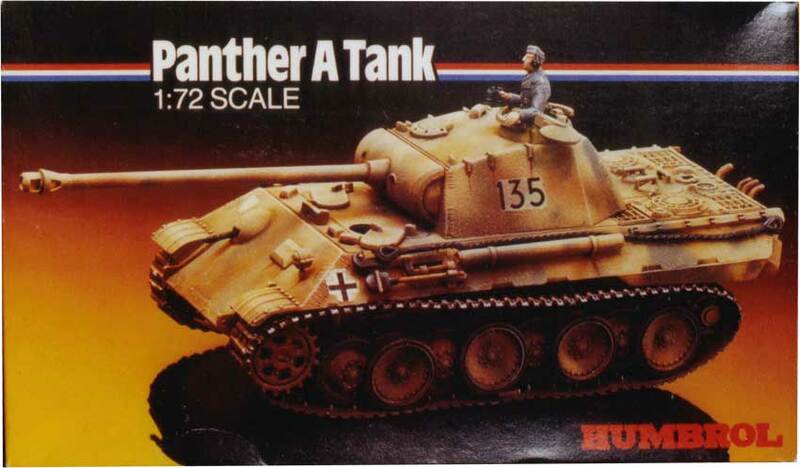 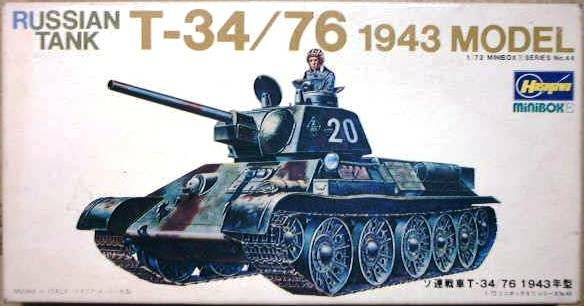 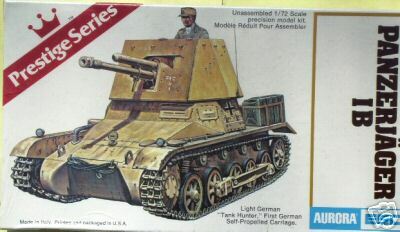 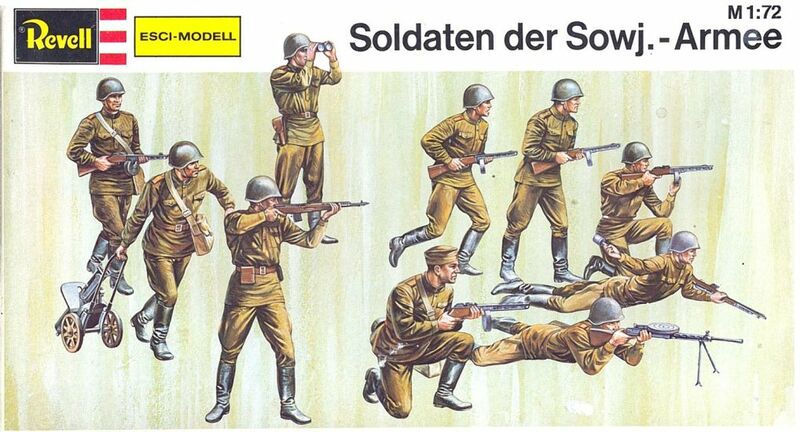 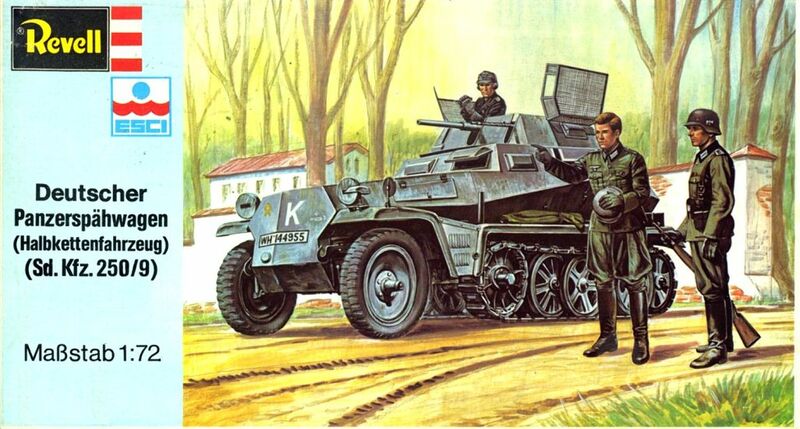 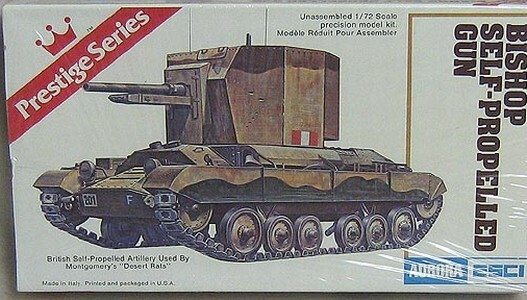 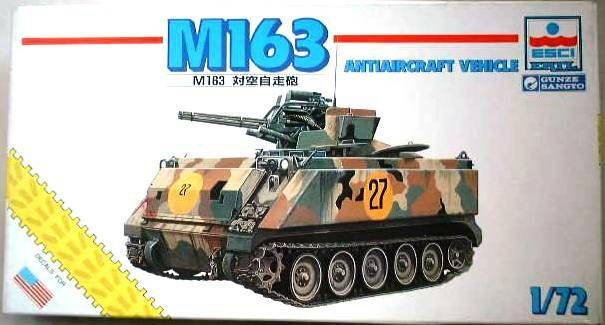 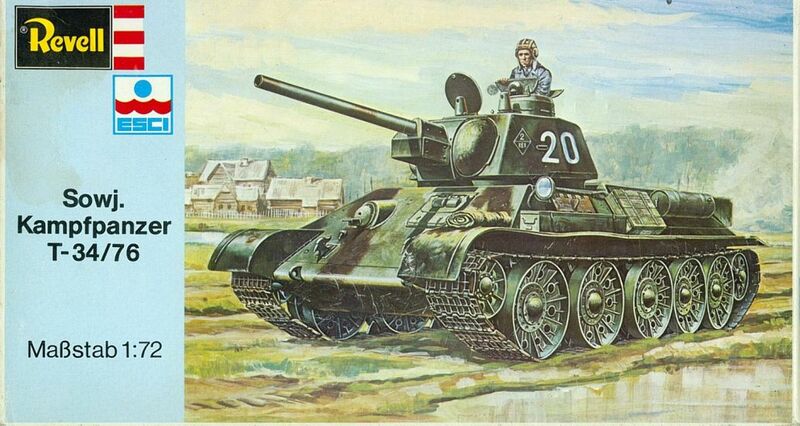 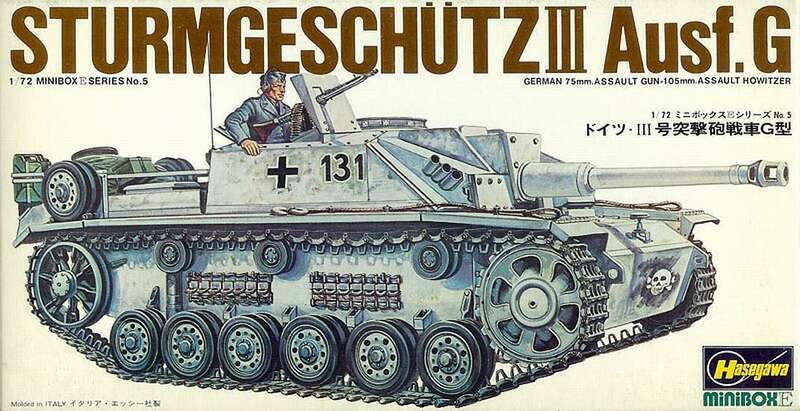 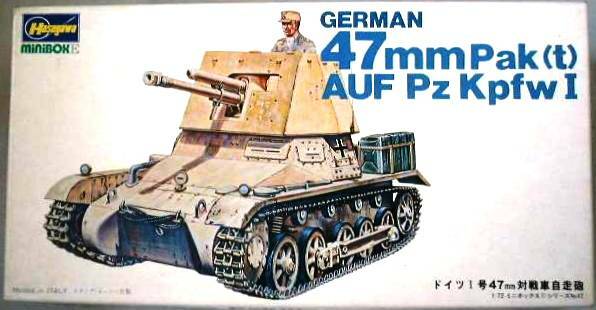 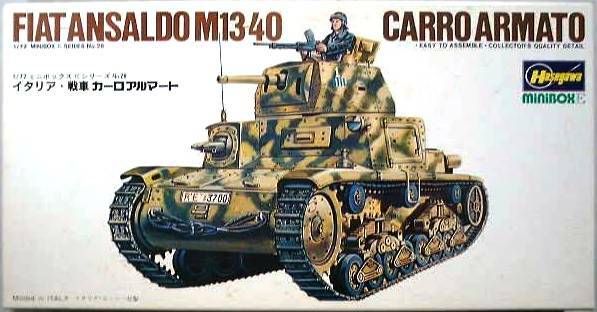 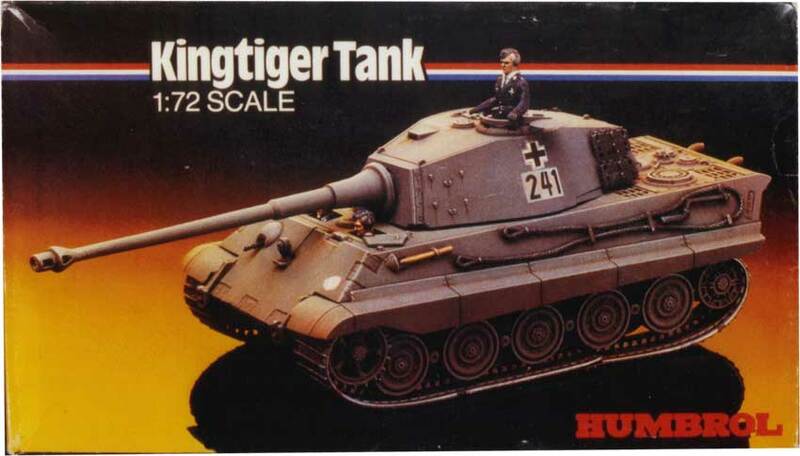 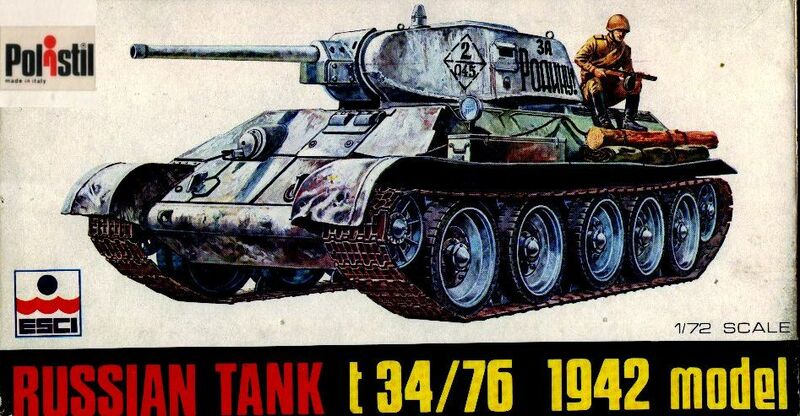 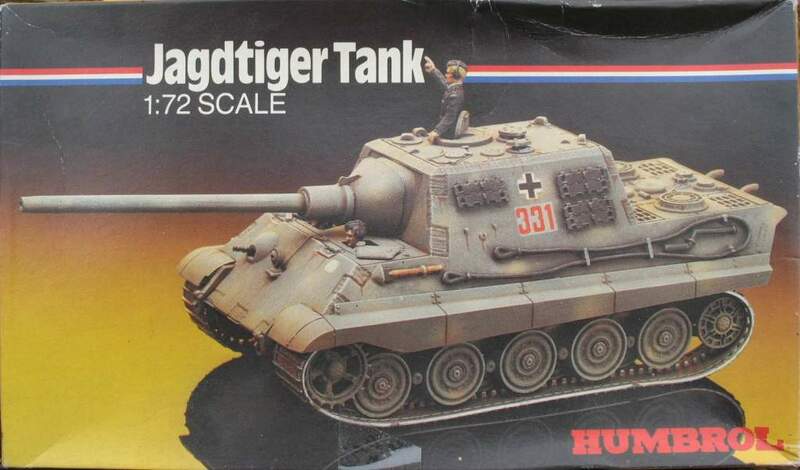 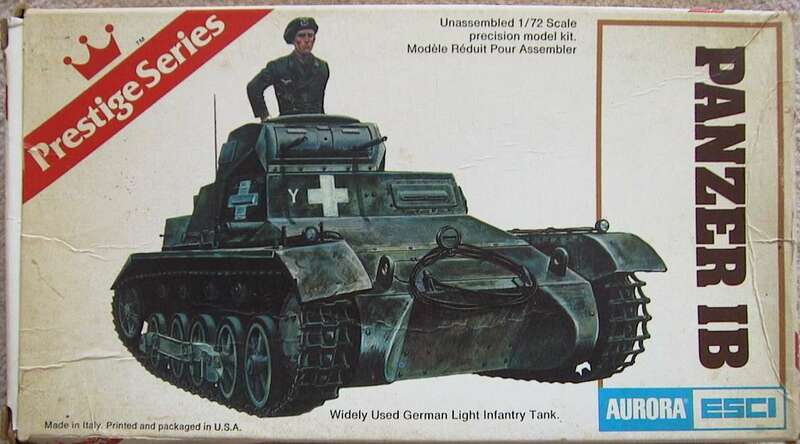 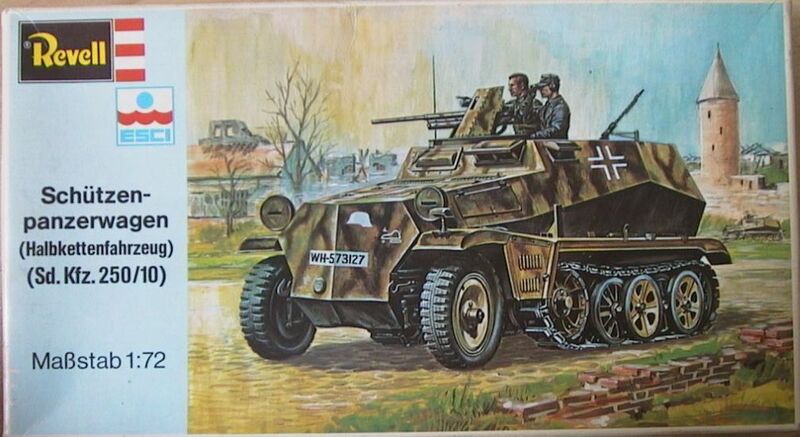 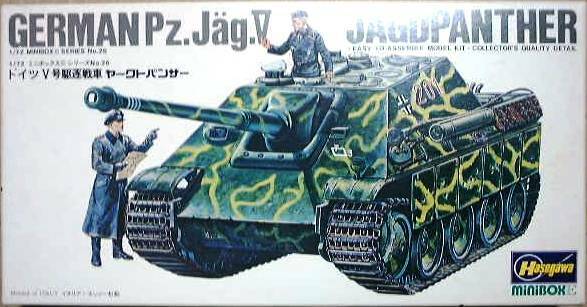 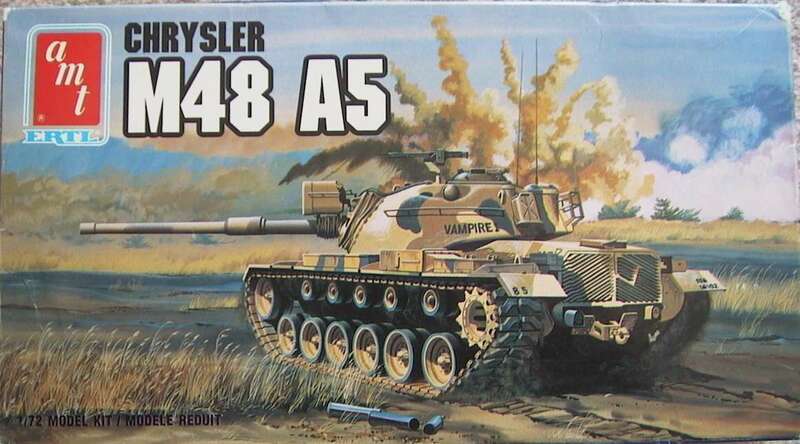 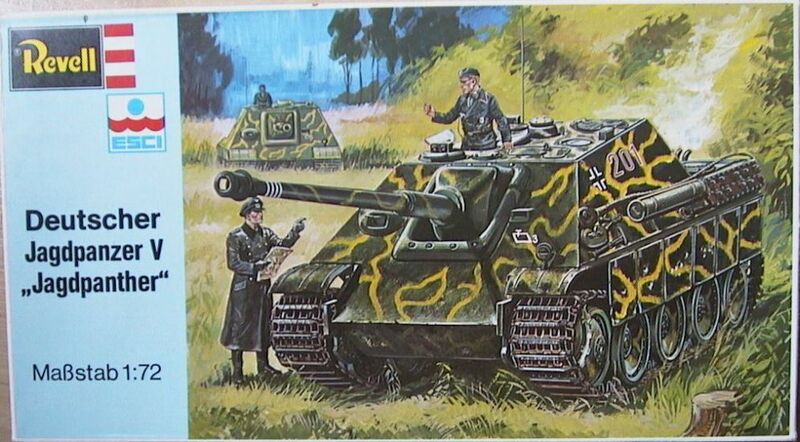 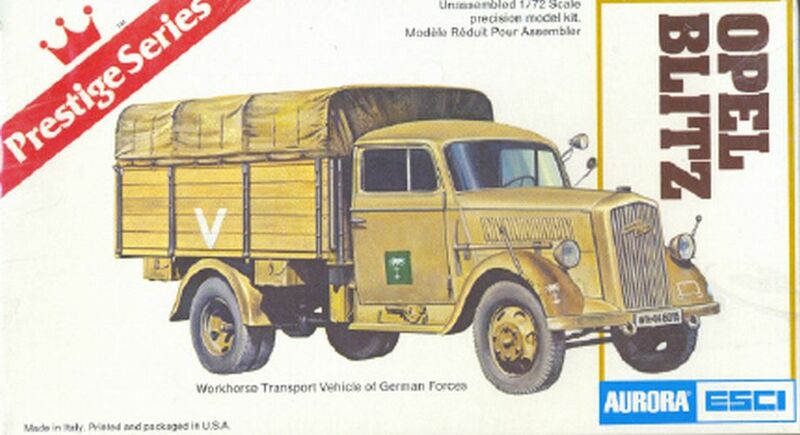 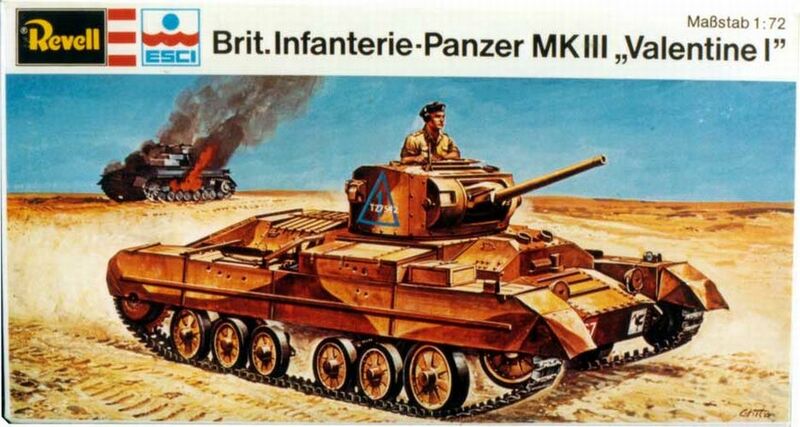 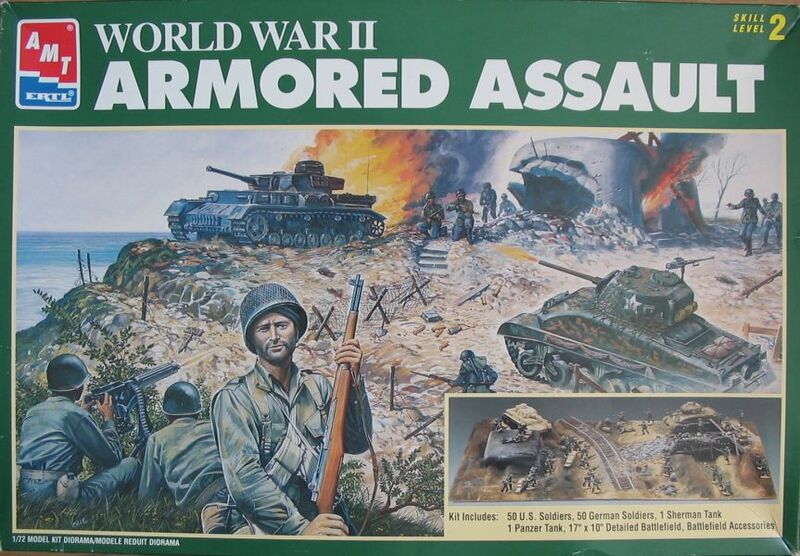 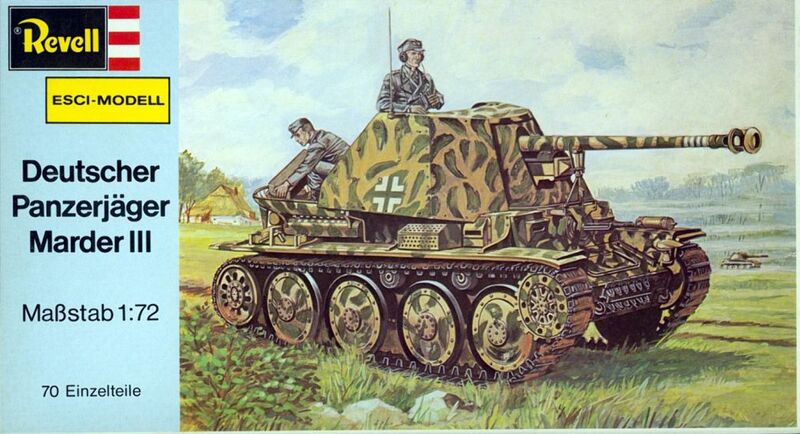 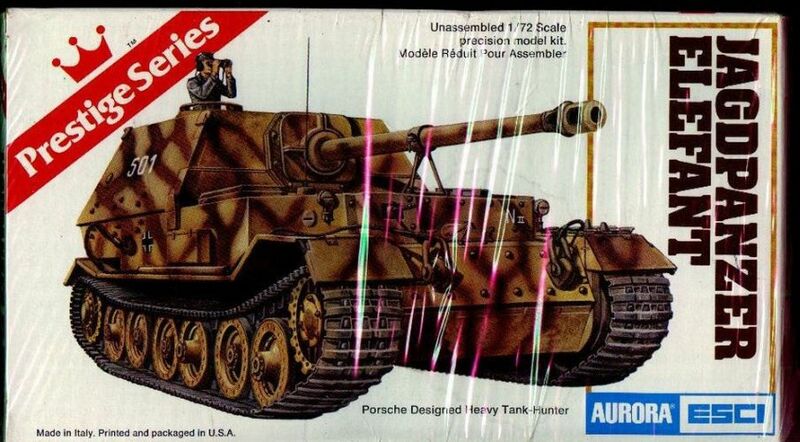 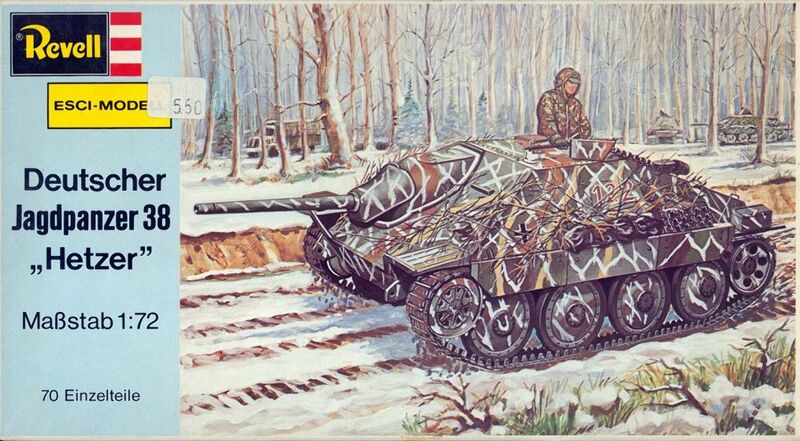 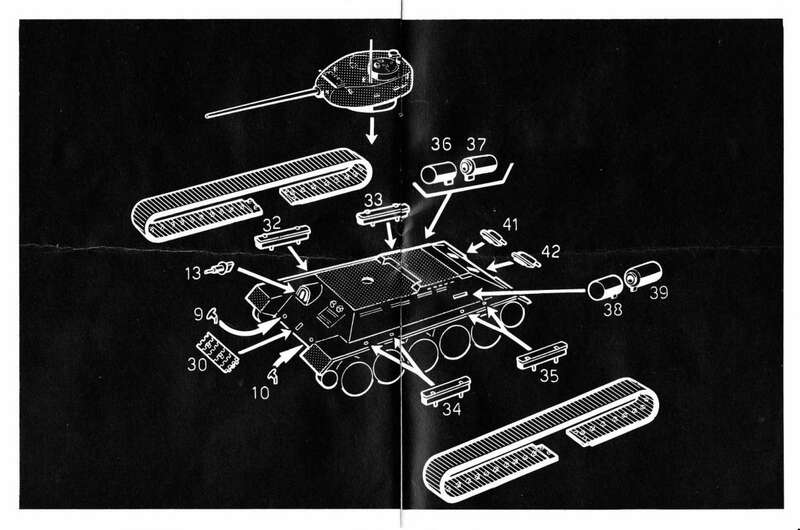 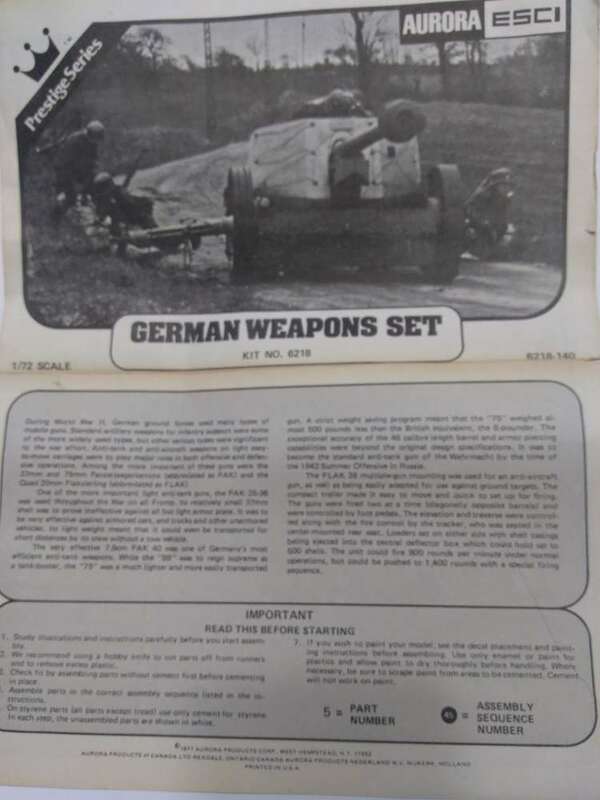 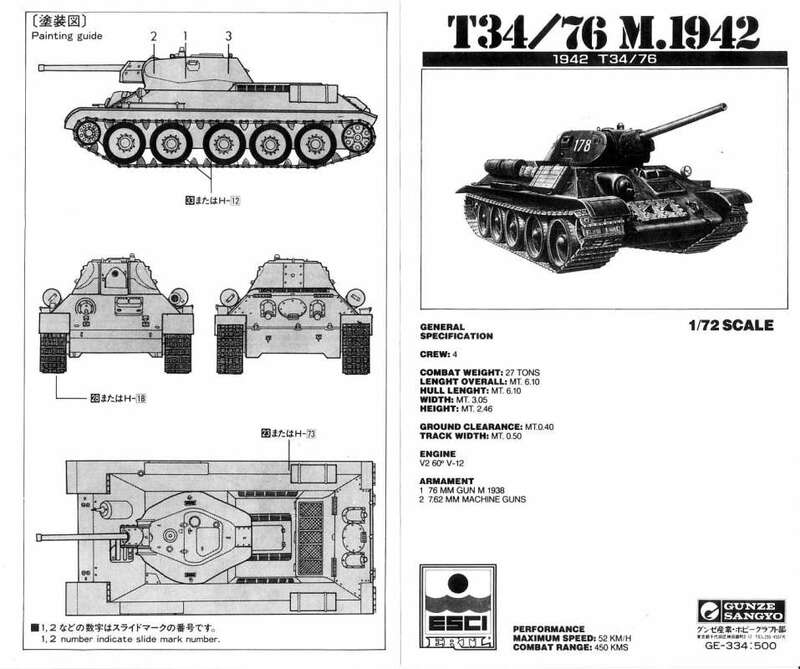 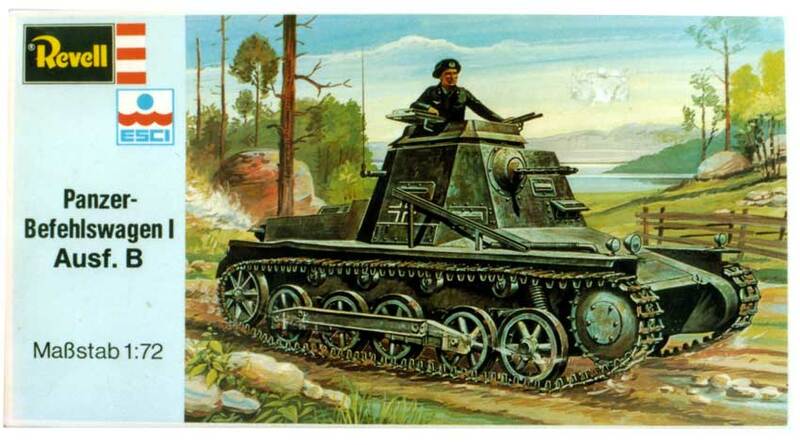 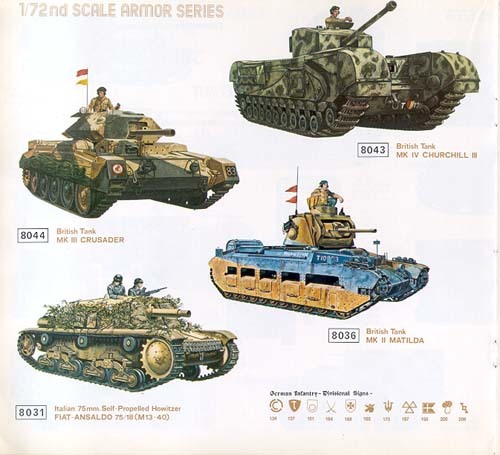 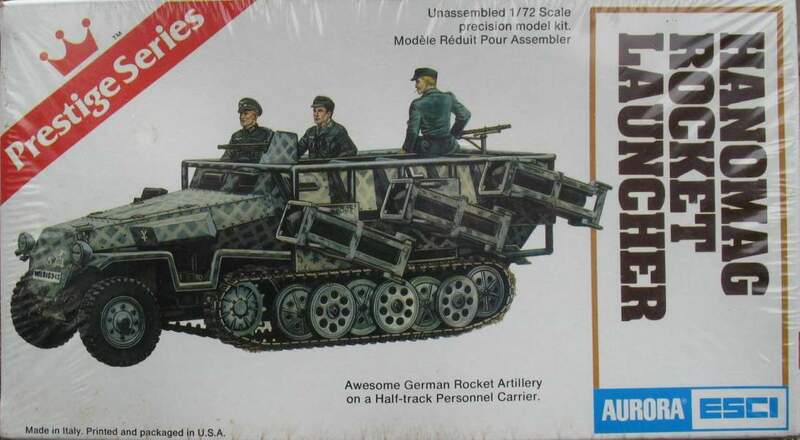 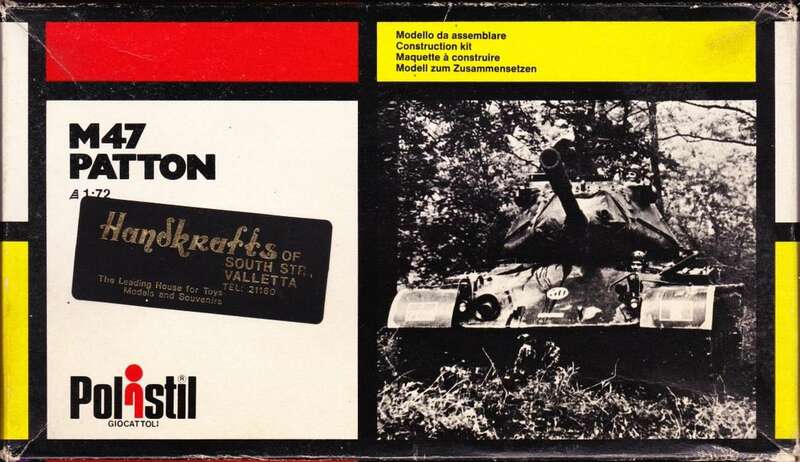 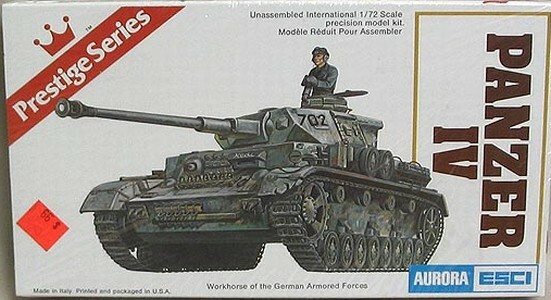 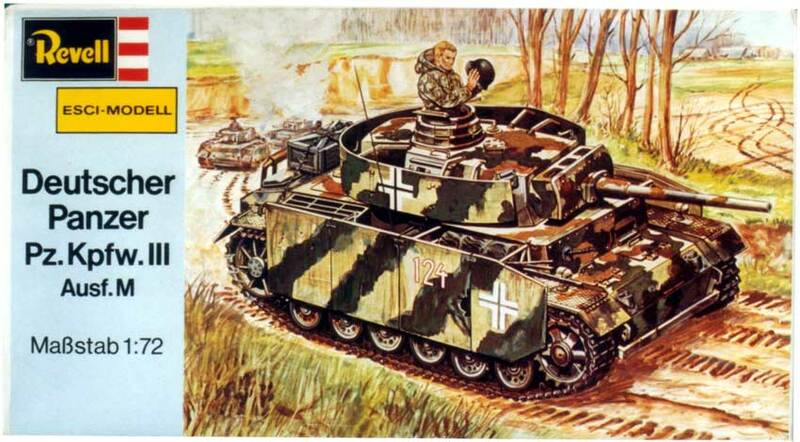 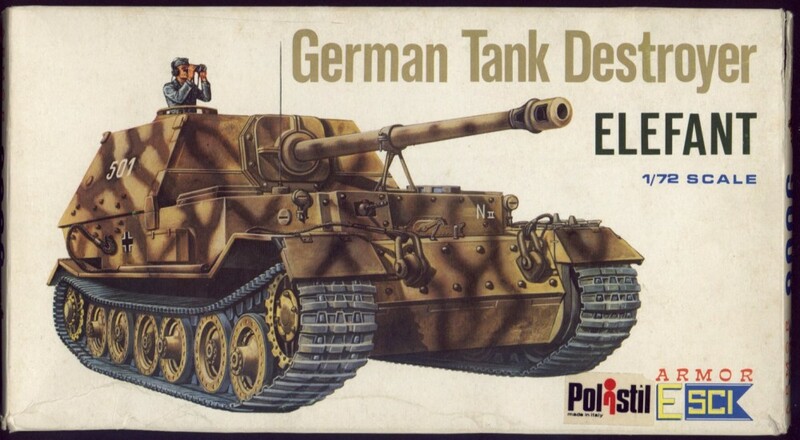 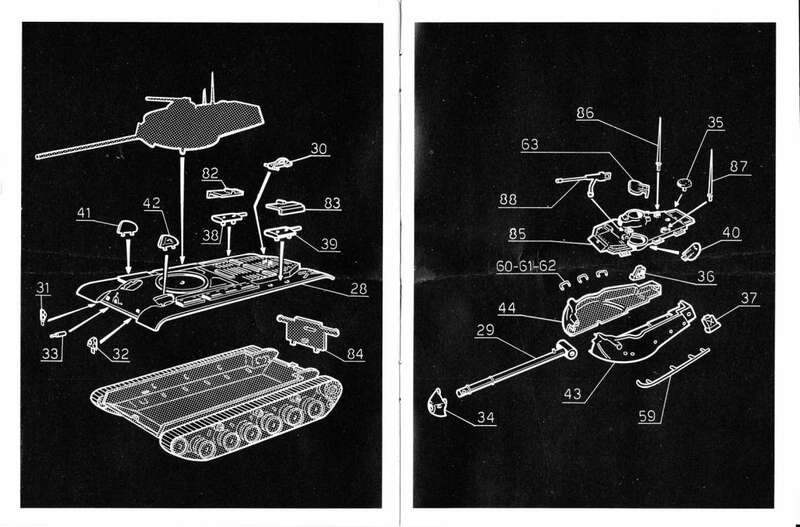 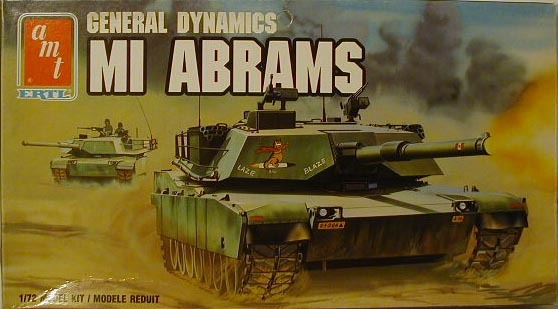 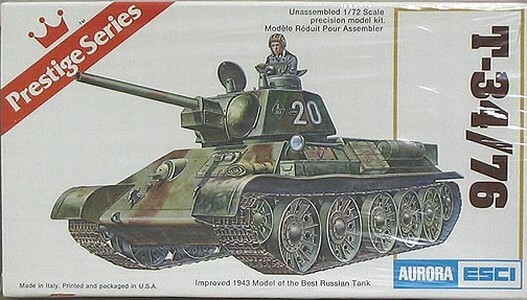 Possibly as early as 1975 Revell Germany started to produce The Esci Armor 1/72 kits. 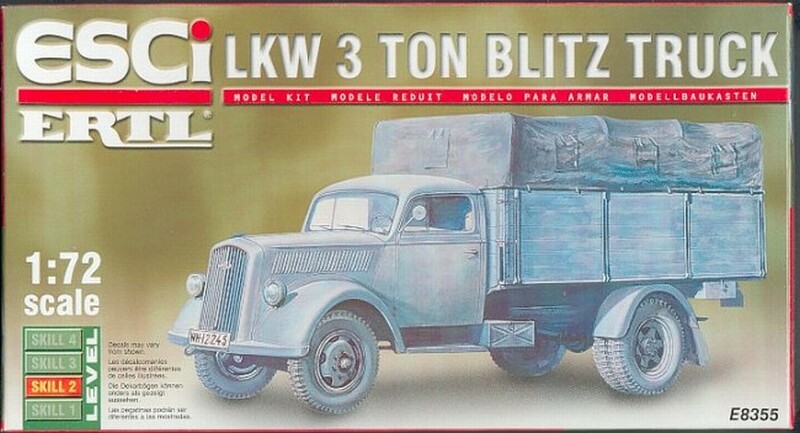 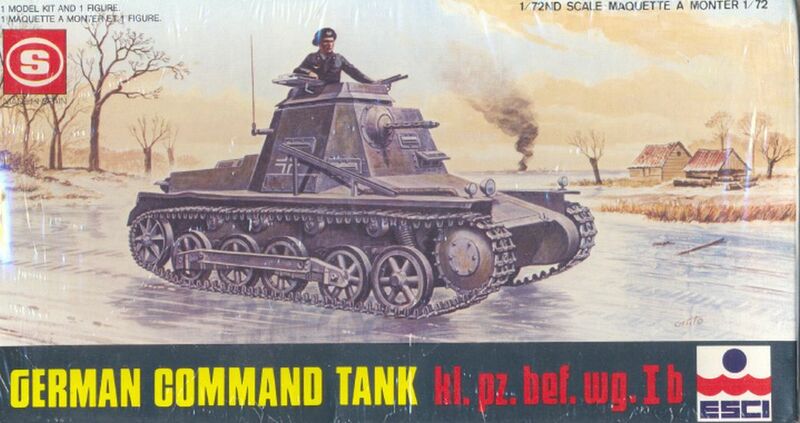 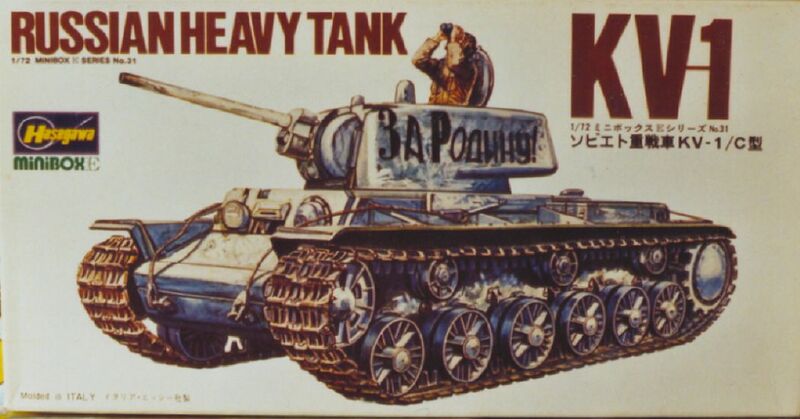 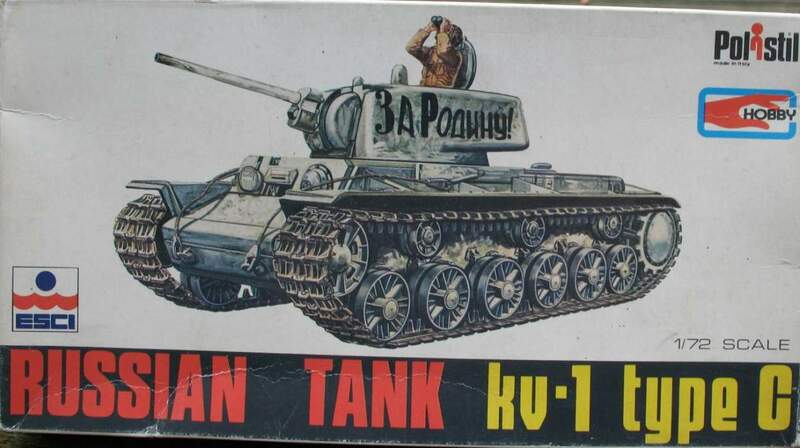 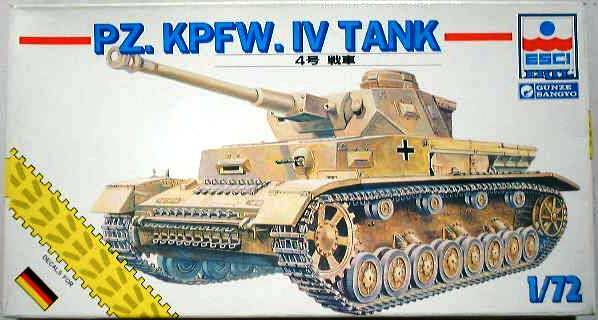 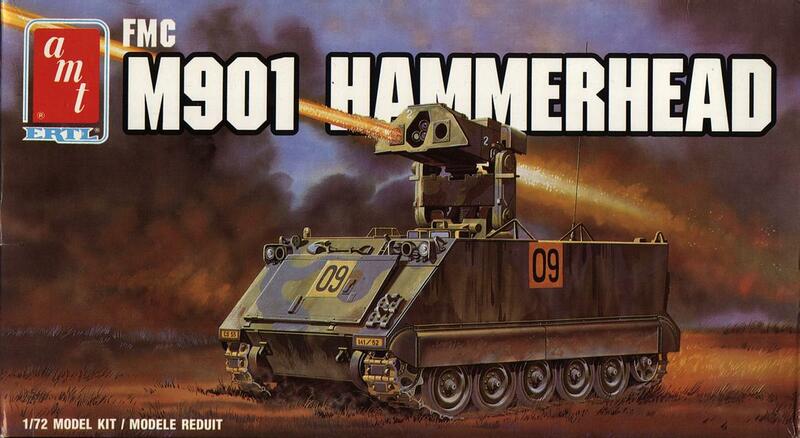 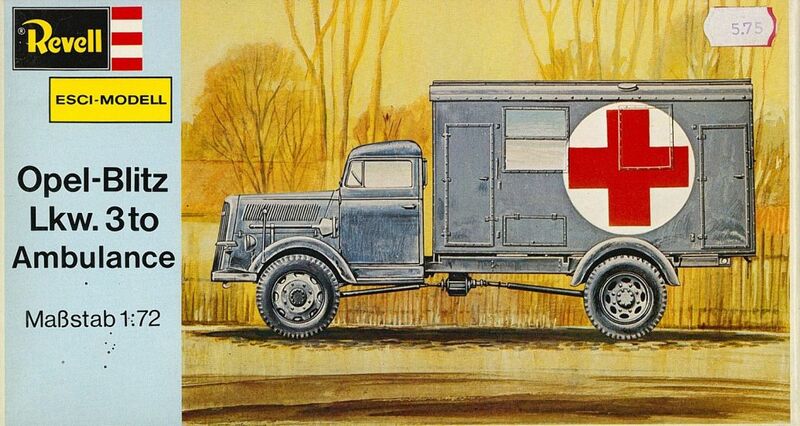 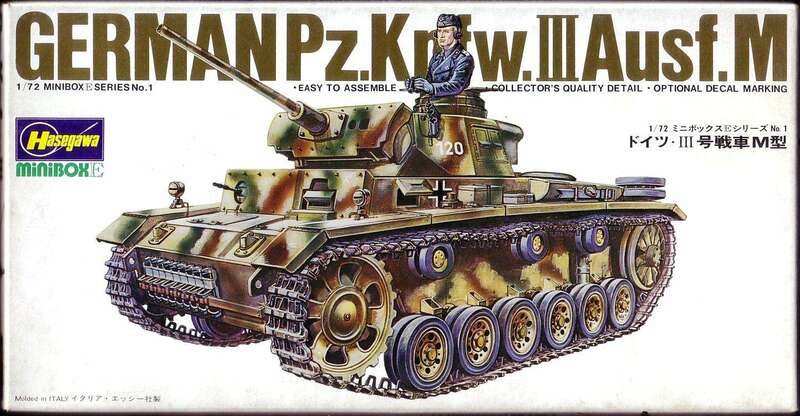 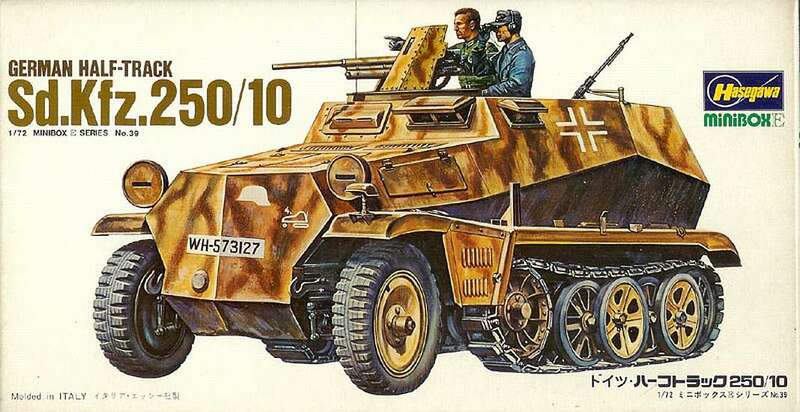 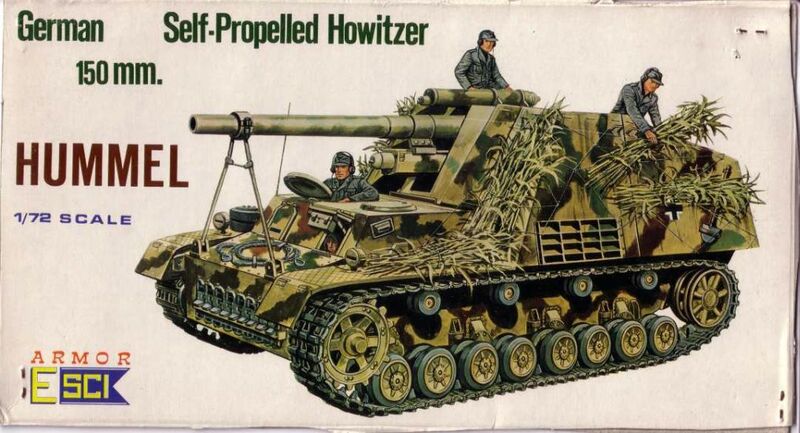 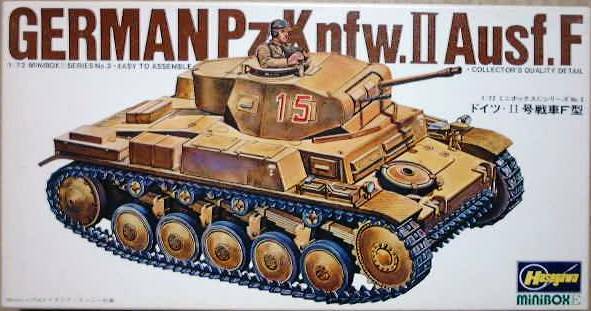 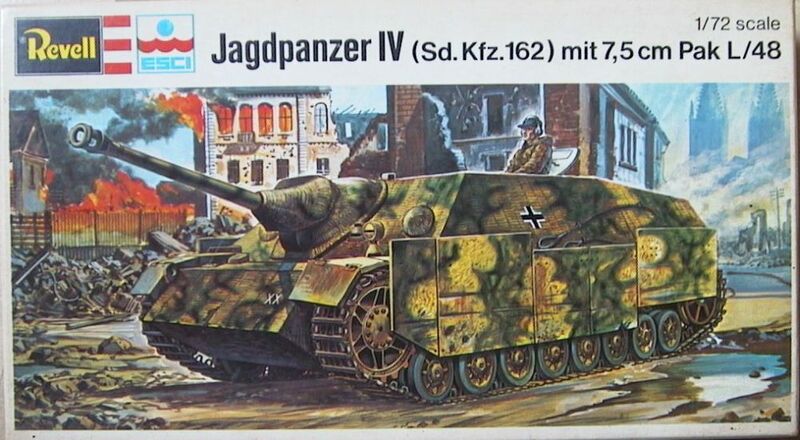 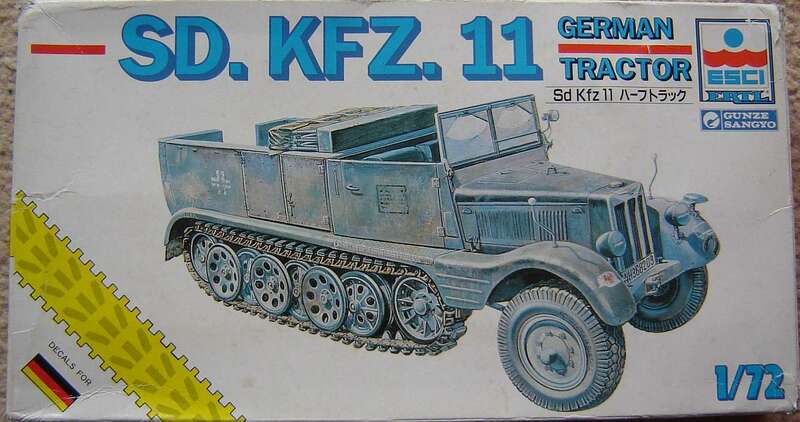 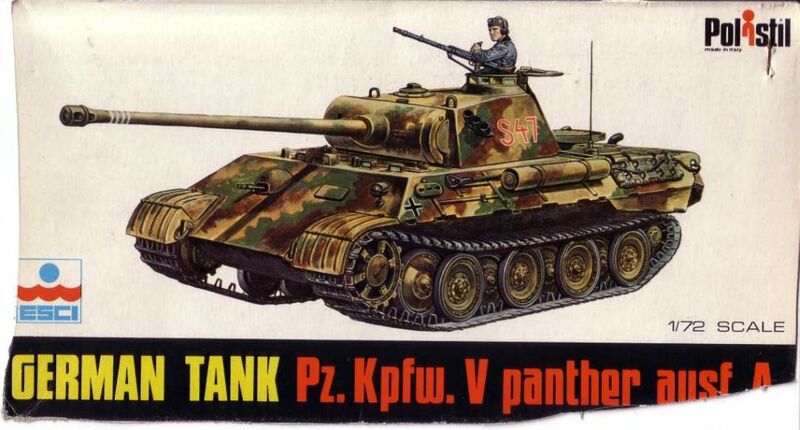 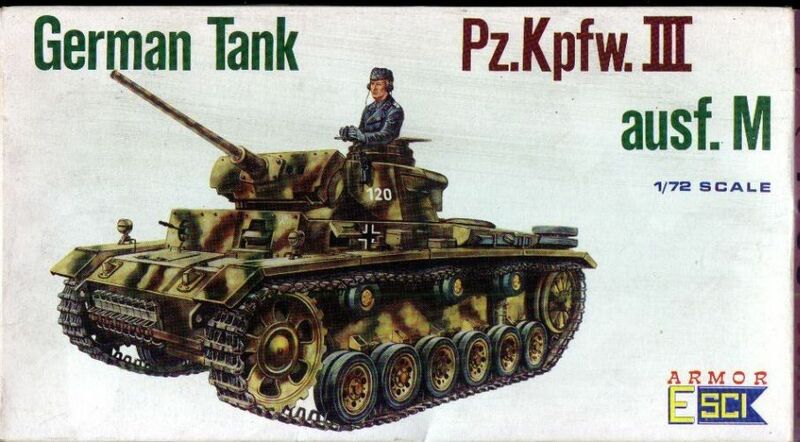 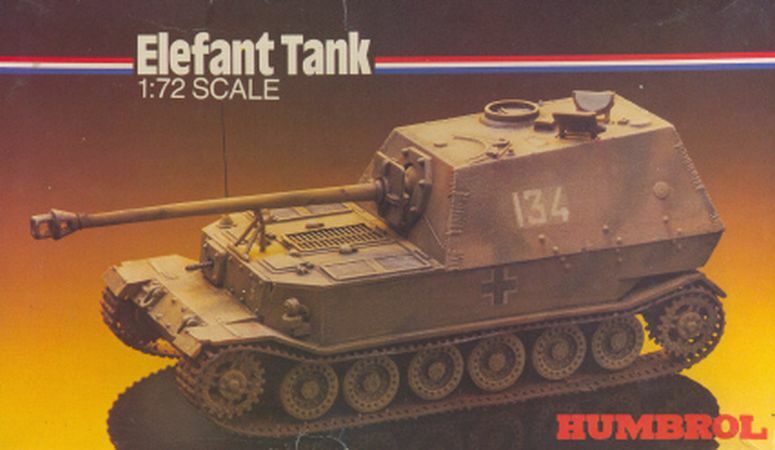 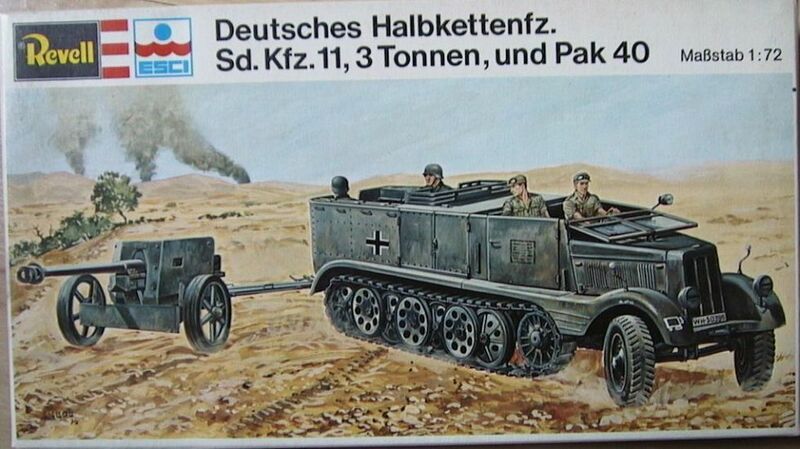 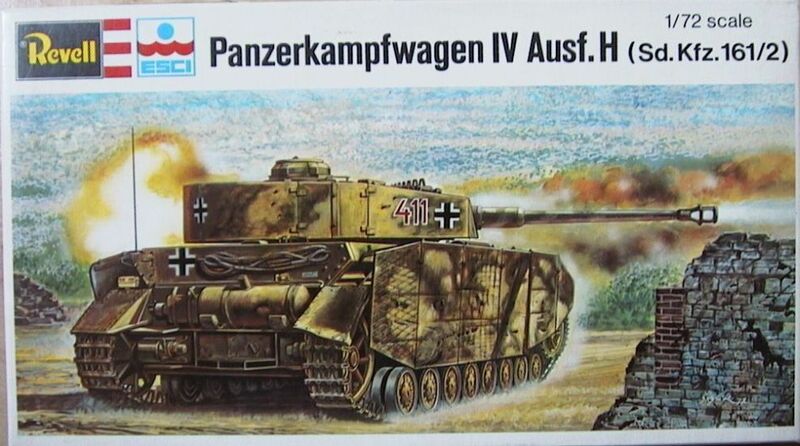 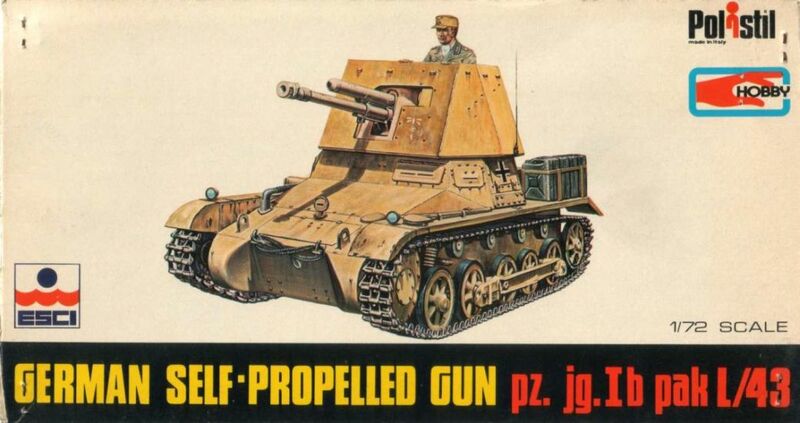 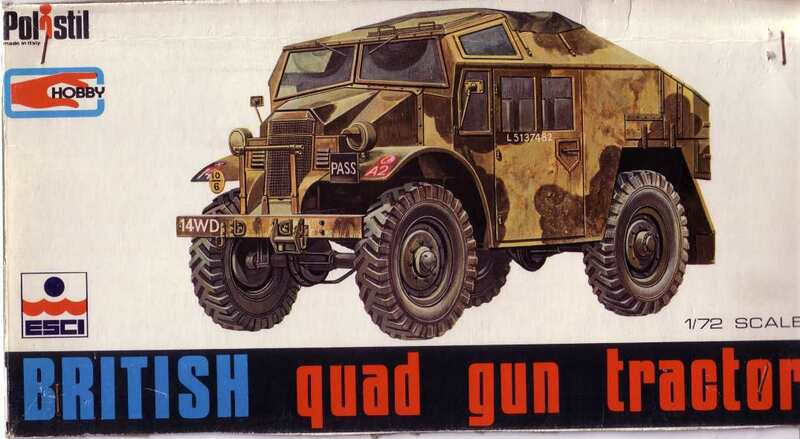 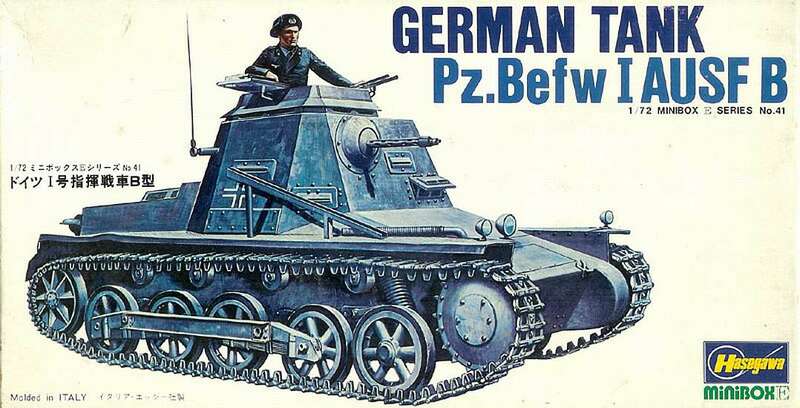 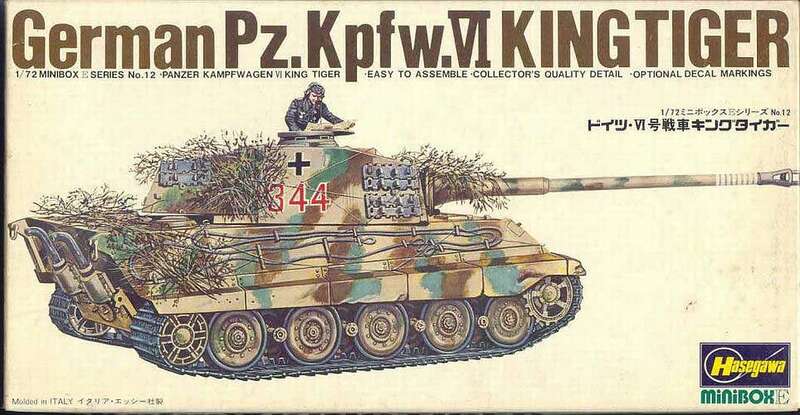 They had the usual Revell "H" numbering, starting with the PzKfw II (H-2300). 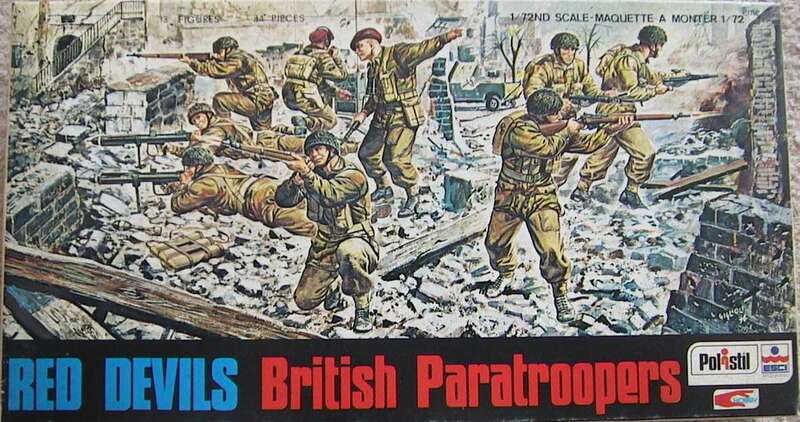 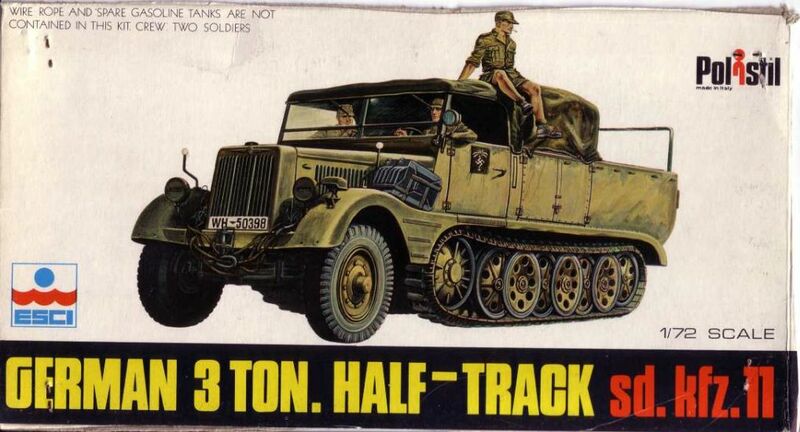 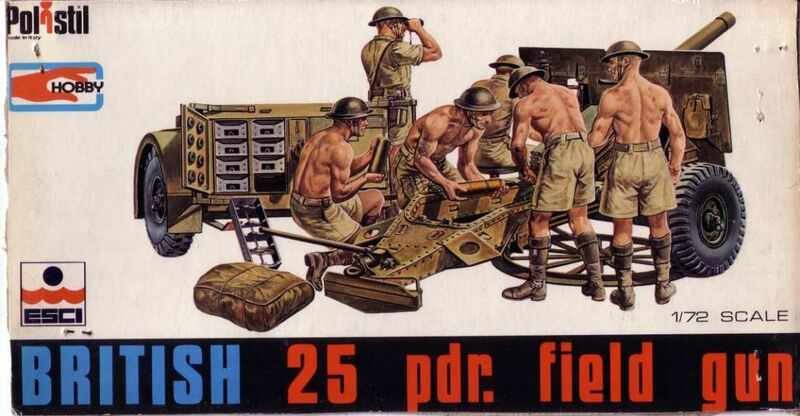 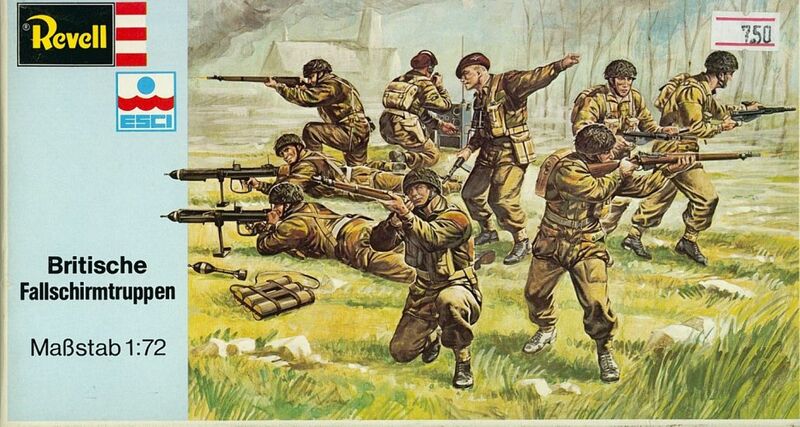 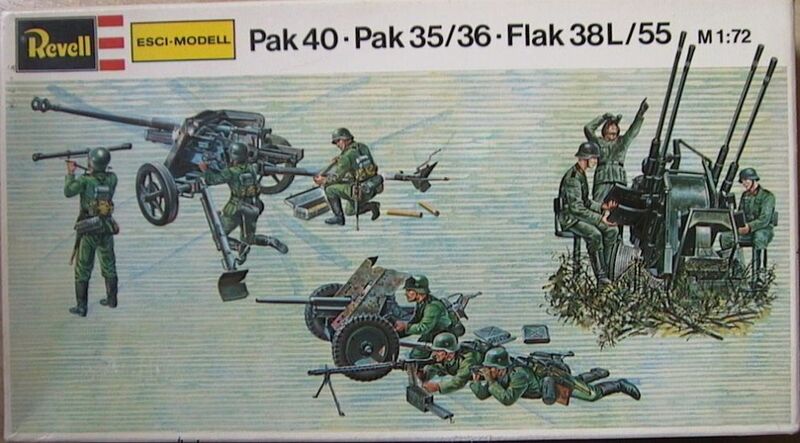 They were packed in the well known sturdy two part Revell boxes. 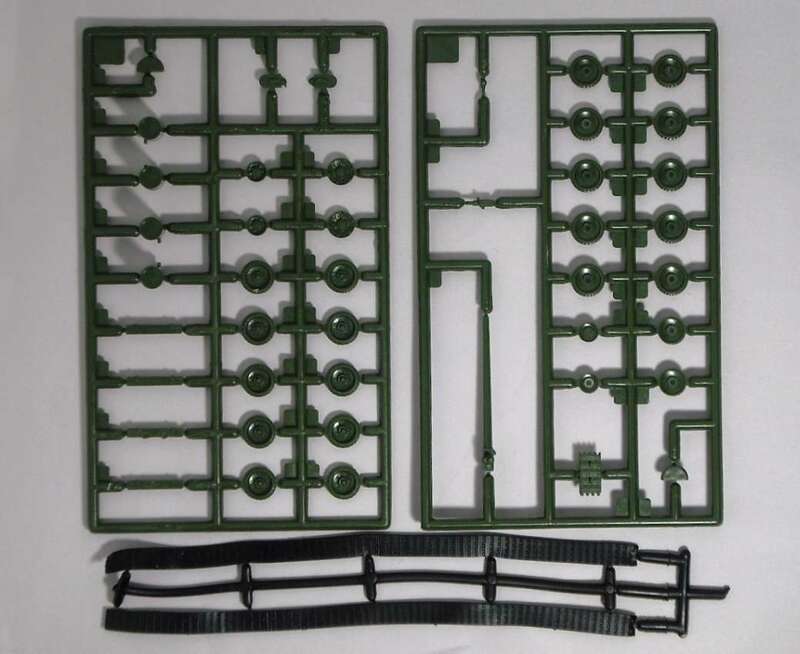 These are famous for not having any staples or glue : they are simply folded together and can be made flat easily without any damage to the box. 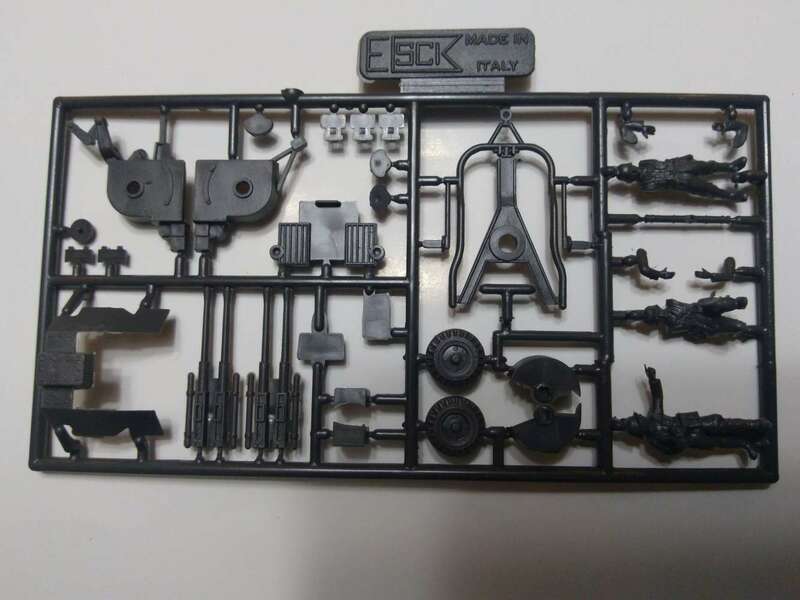 They are verry strong and when empty many are re-used for spare parts or other kits. 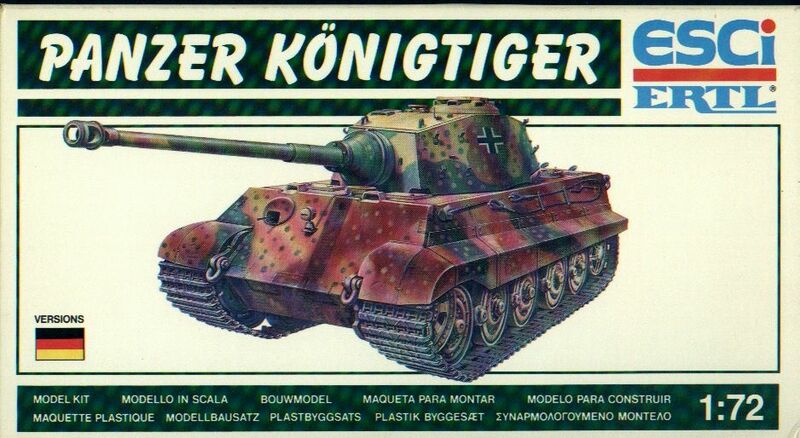 They were mainly sold in Germany, Austria, Switzerland and Holland and many survive. 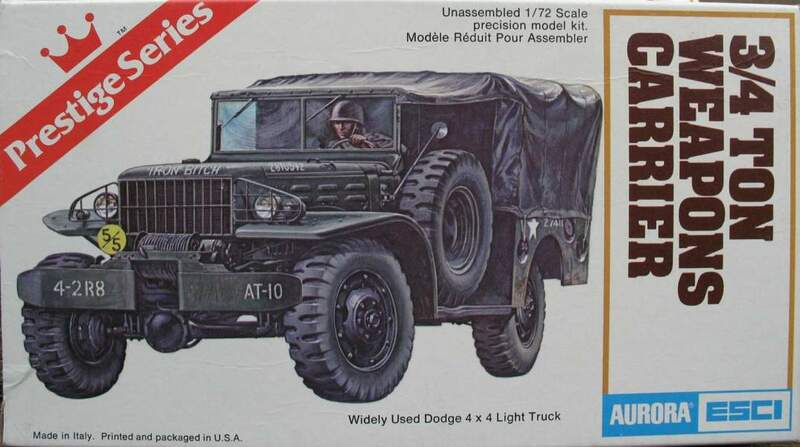 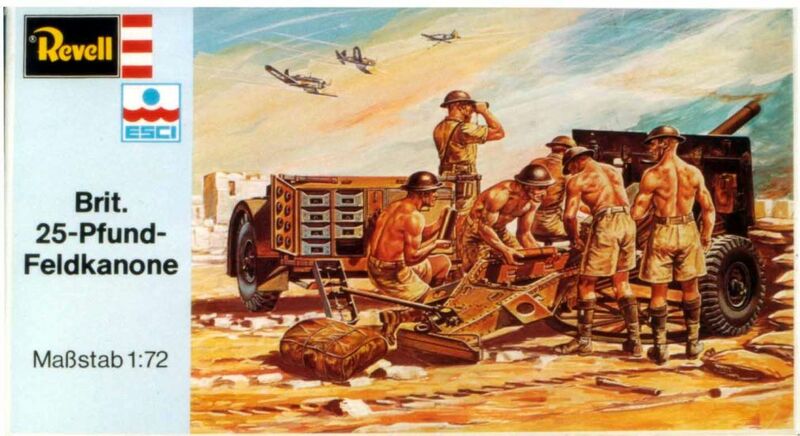 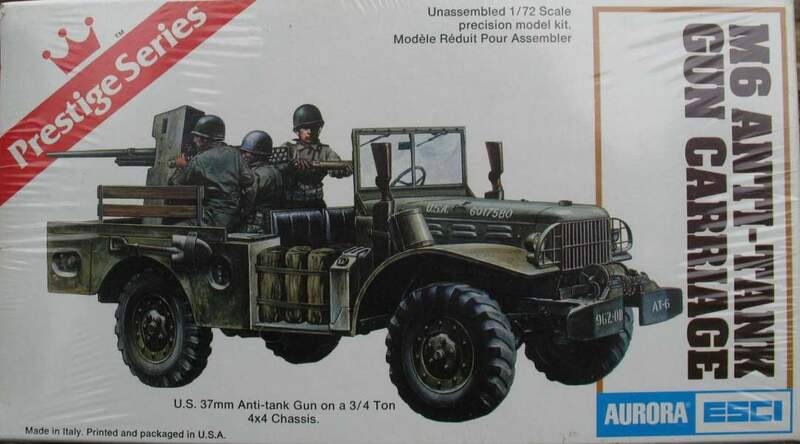 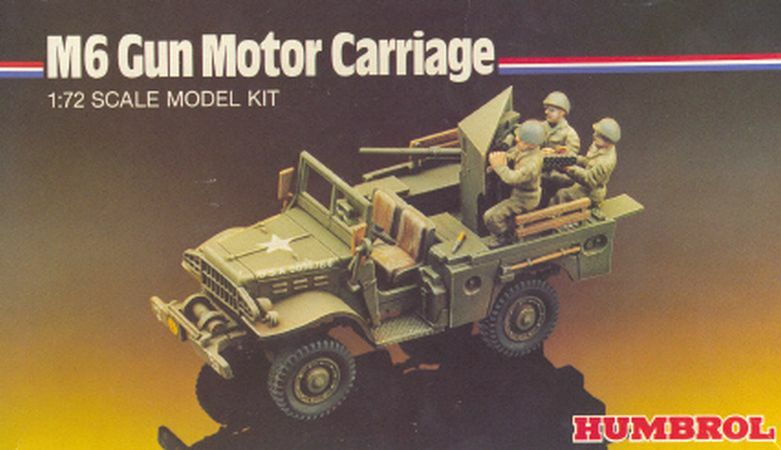 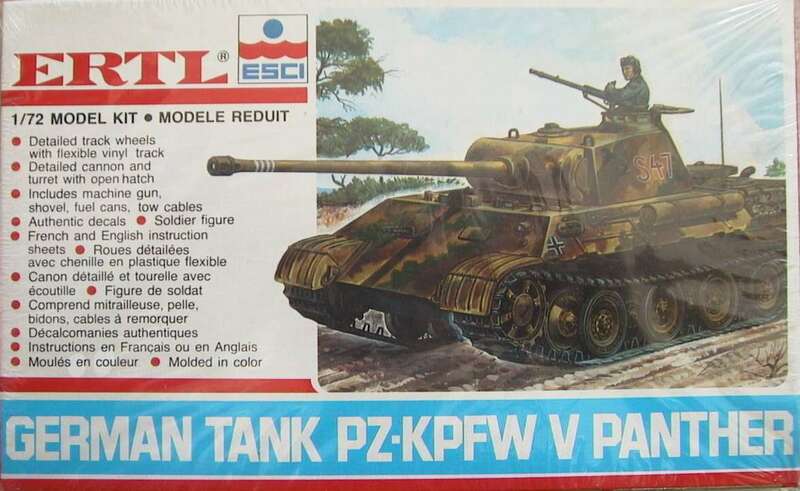 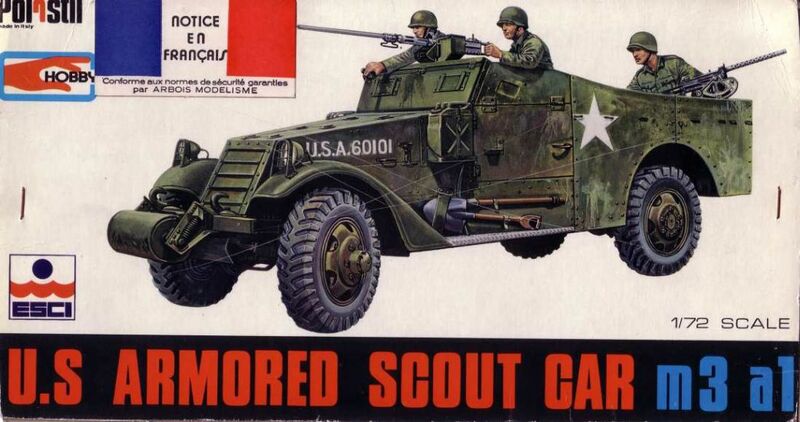 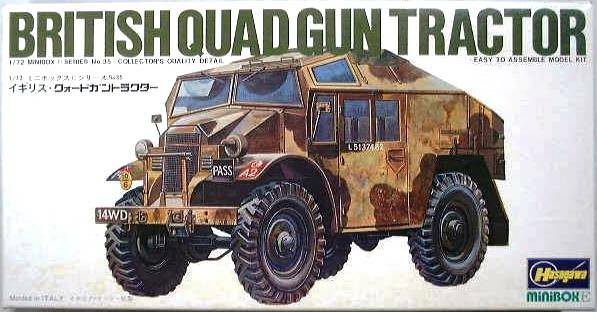 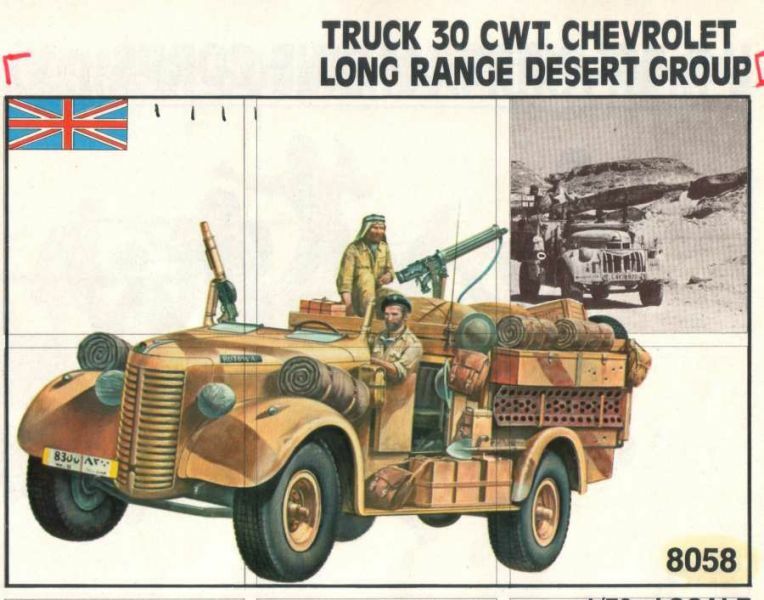 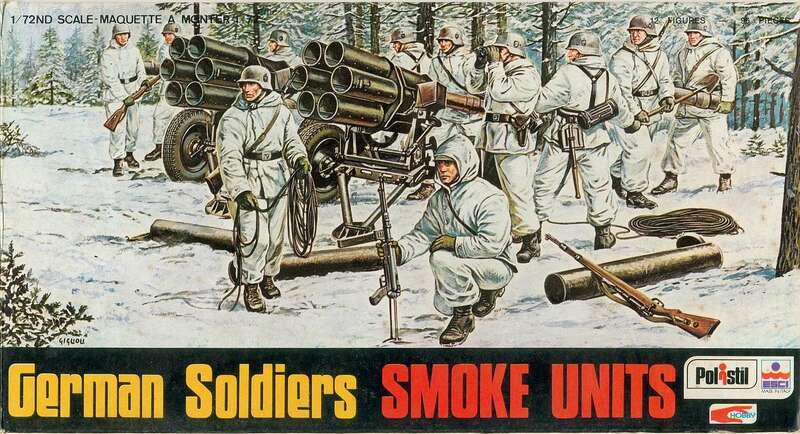 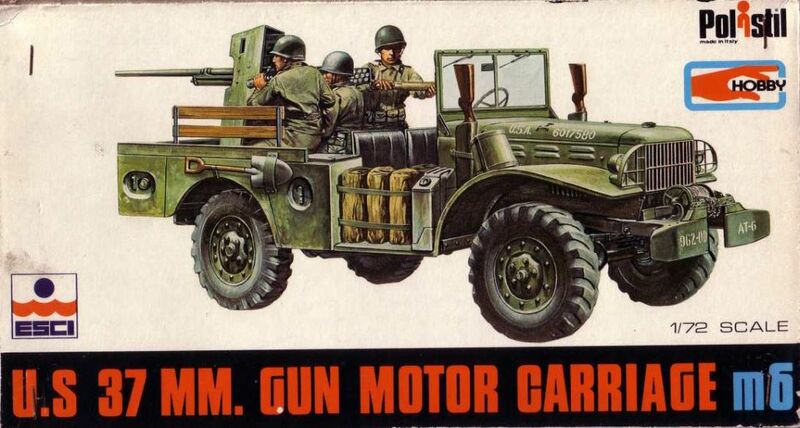 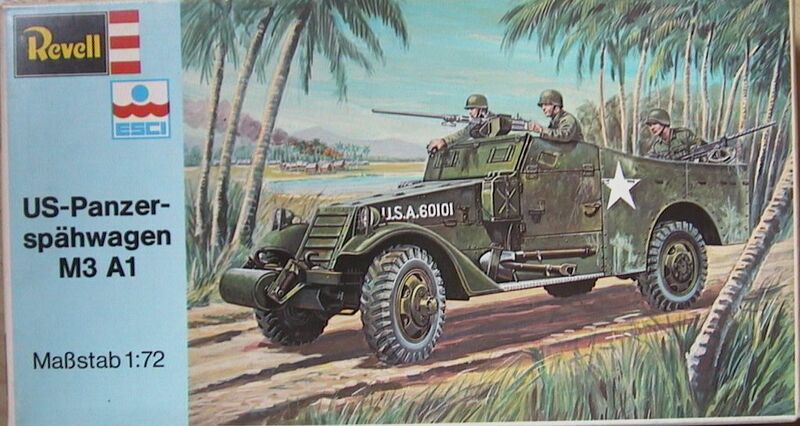 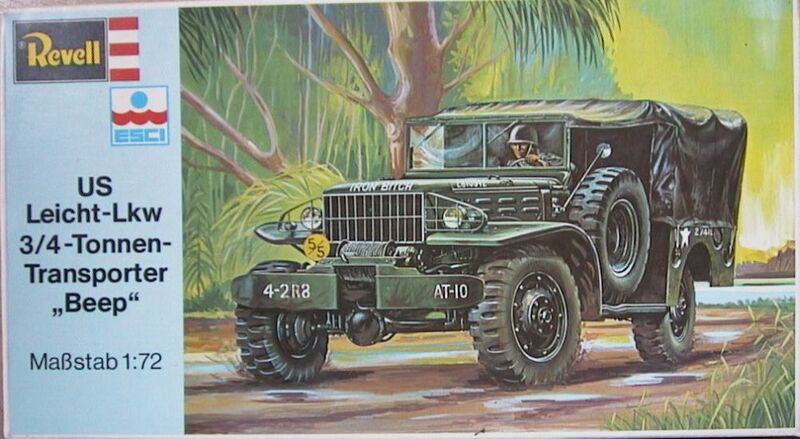 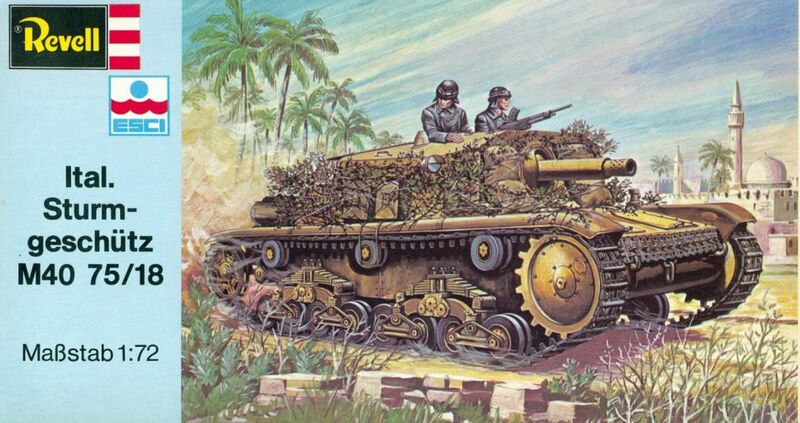 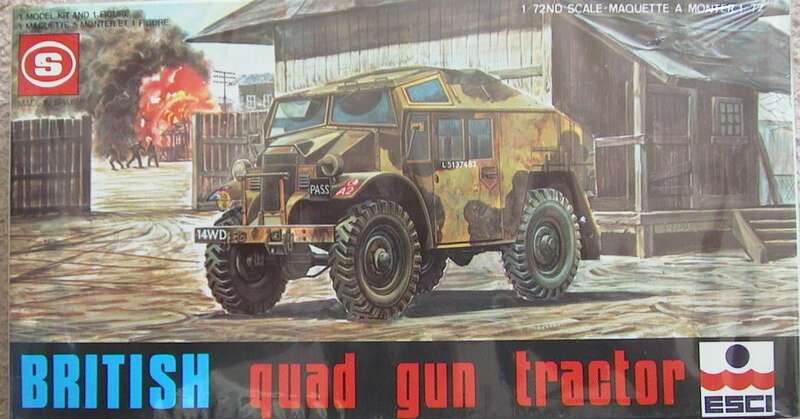 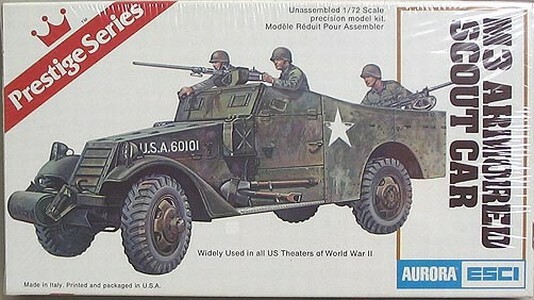 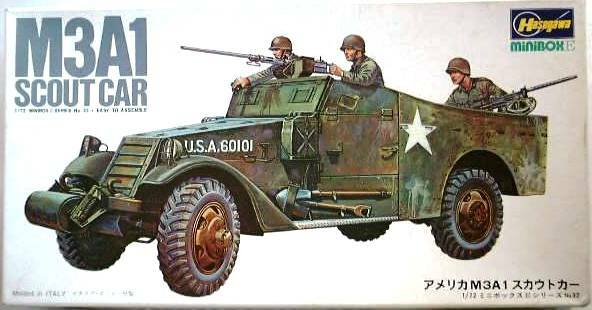 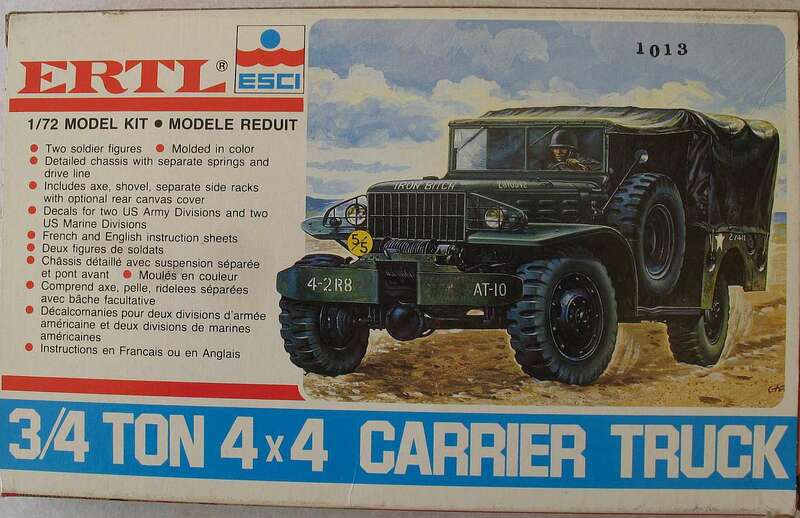 They were actually the first Esci kits with full box art and as with the original Esci 8000 series, the landscapes were painted behind the exsisting Esci whitebox 8000 series vehicle/soldiers picture. 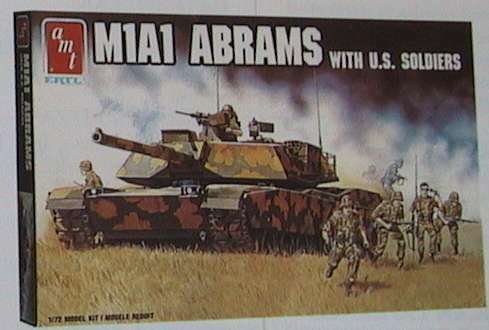 However the Revell series full color landscapes are all different from the later Esci full color 8000 series releases but equally beautiful ! 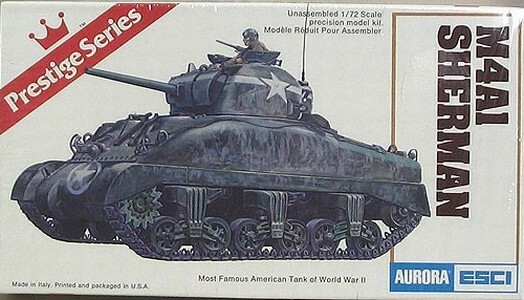 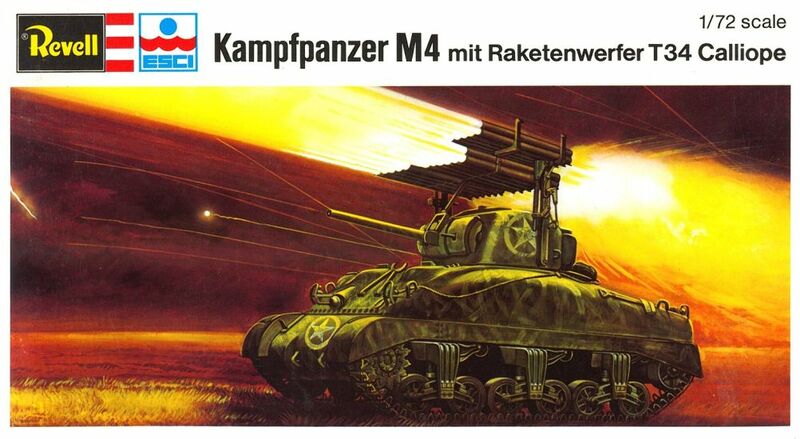 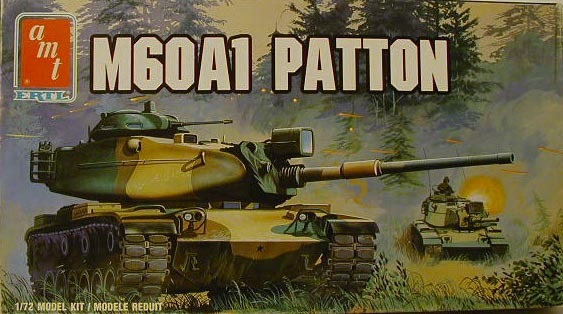 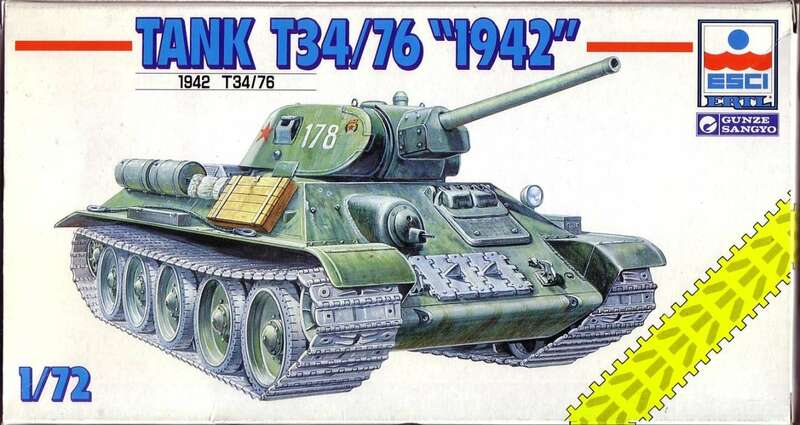 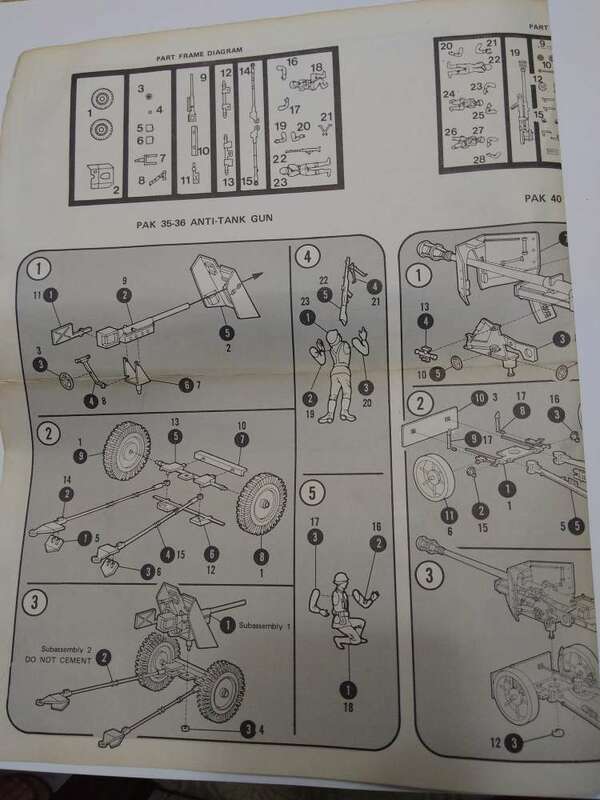 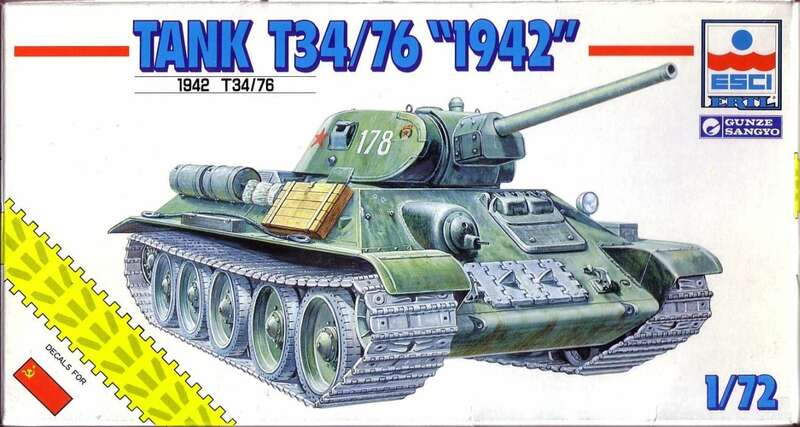 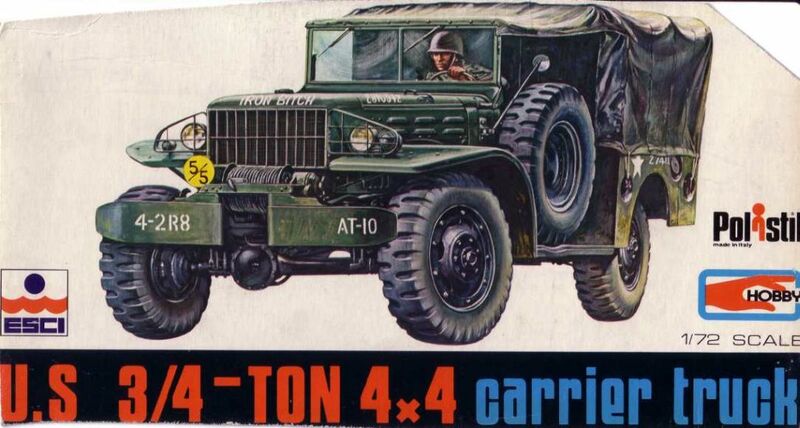 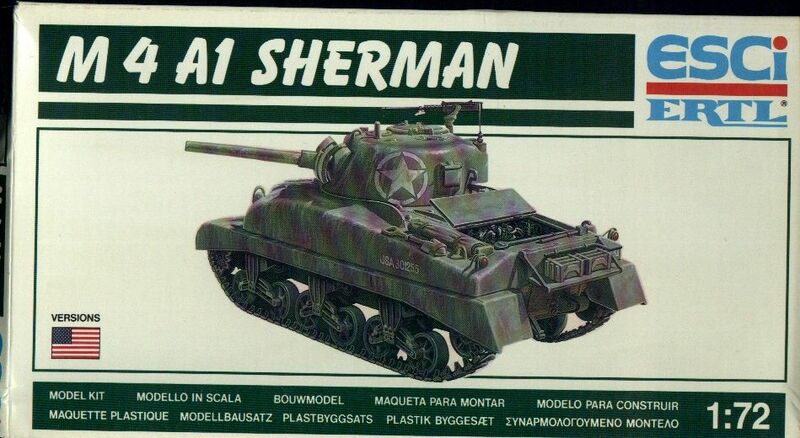 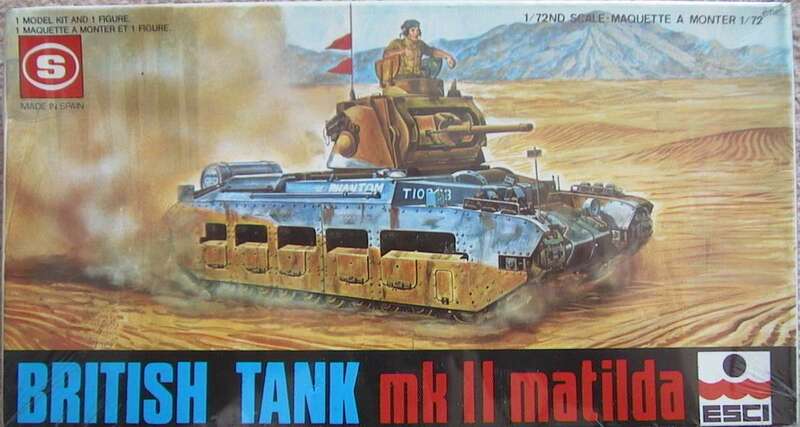 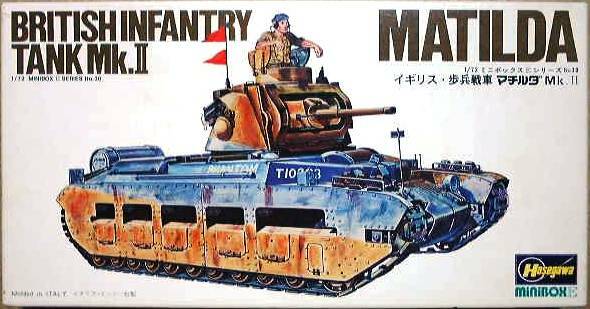 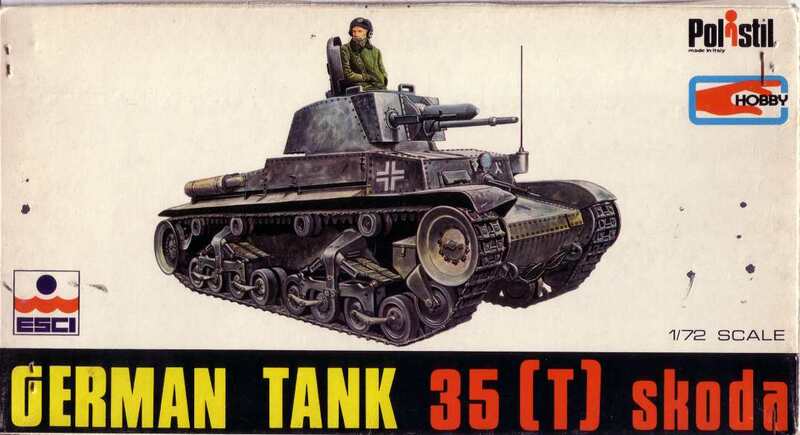 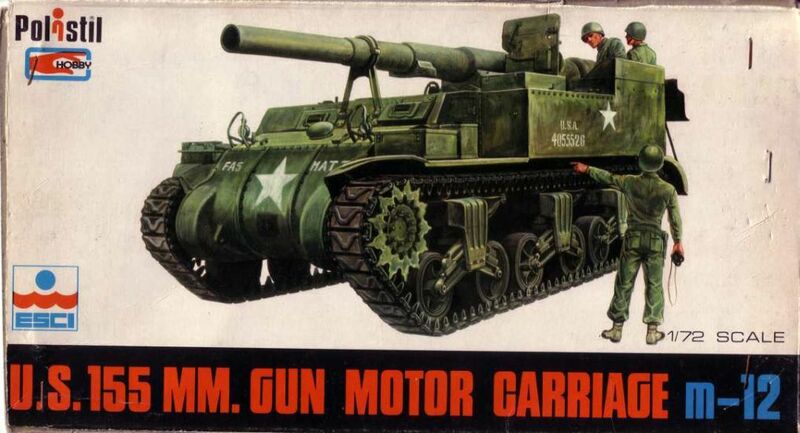 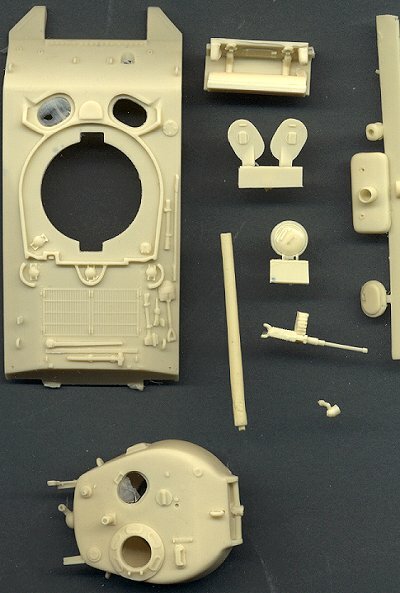 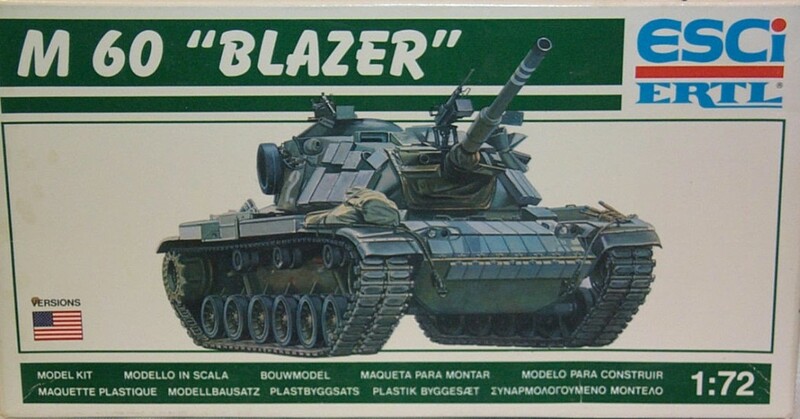 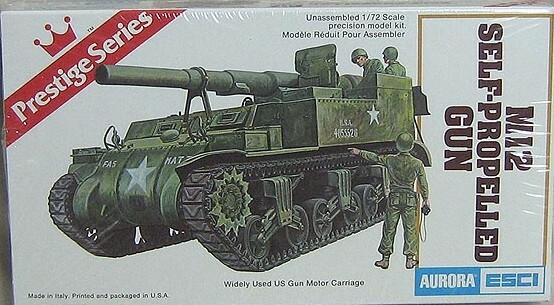 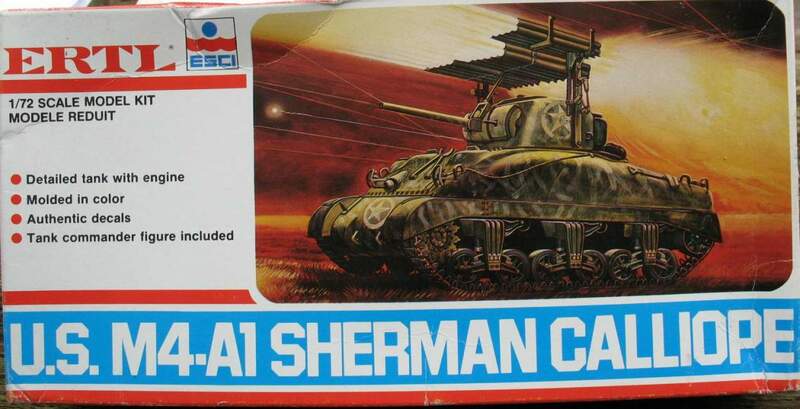 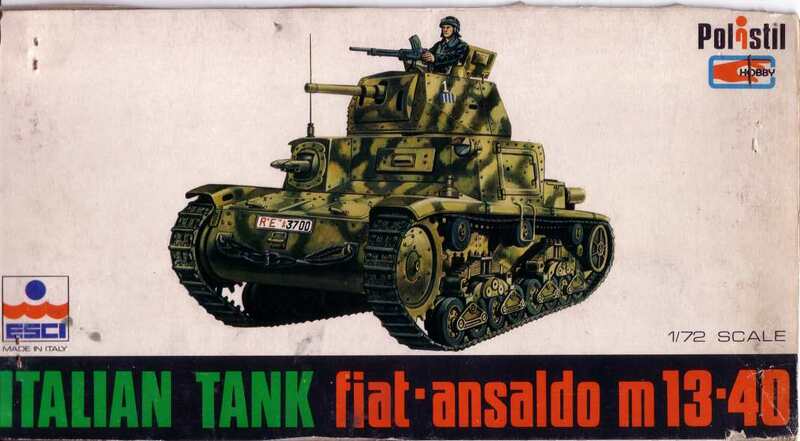 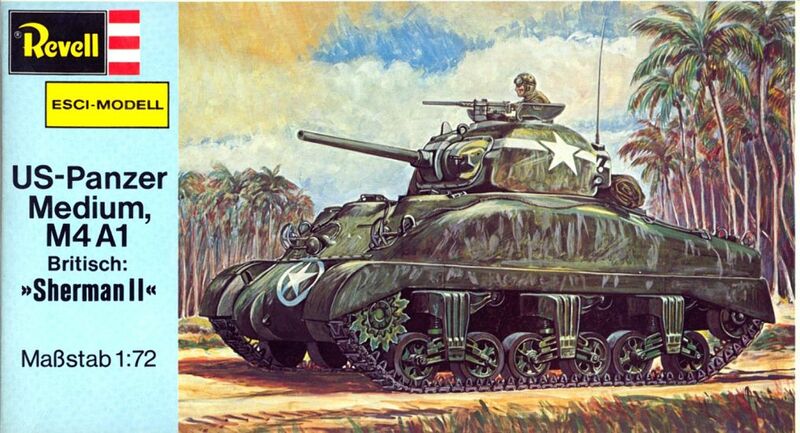 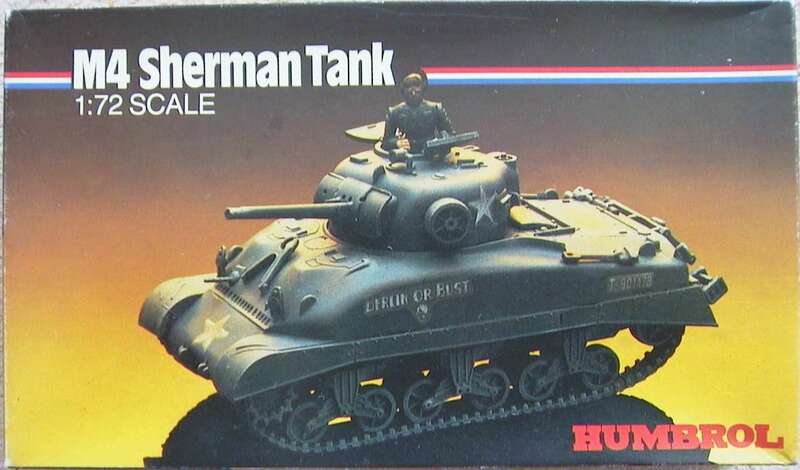 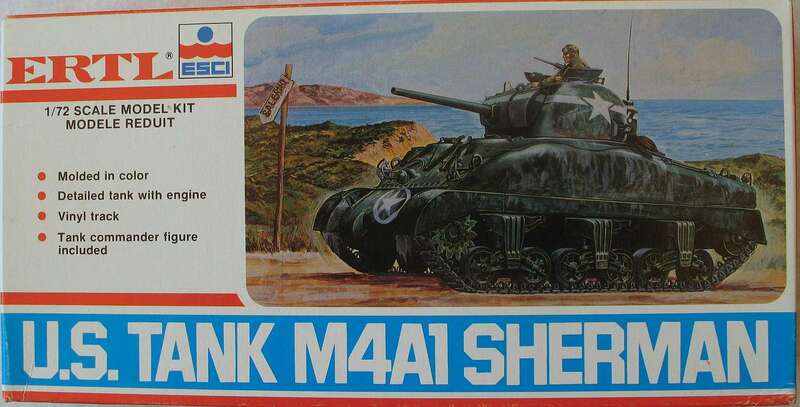 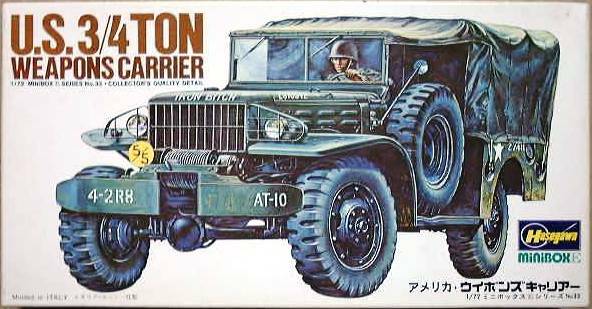 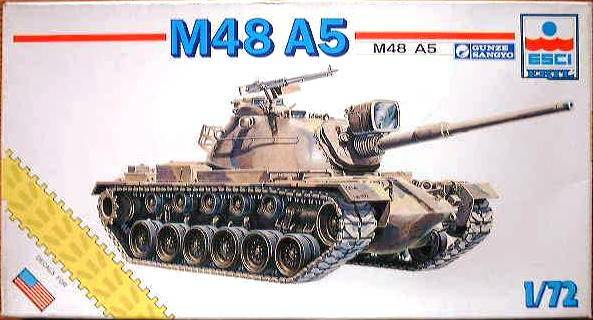 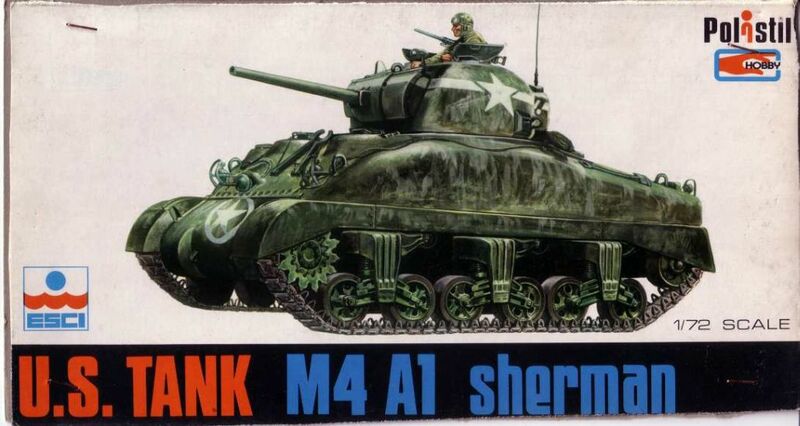 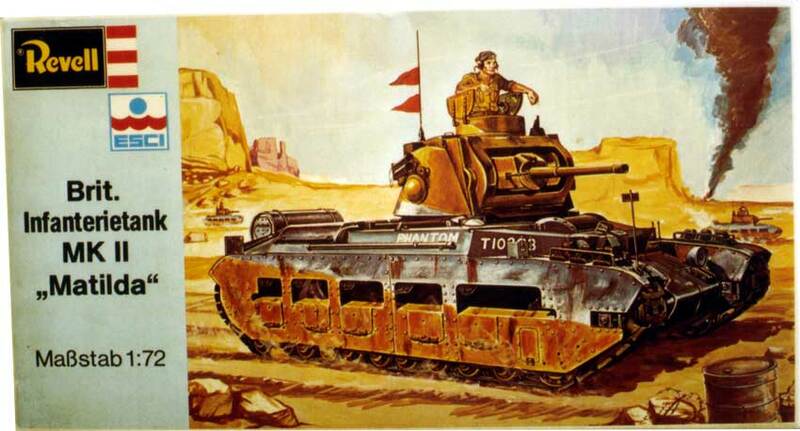 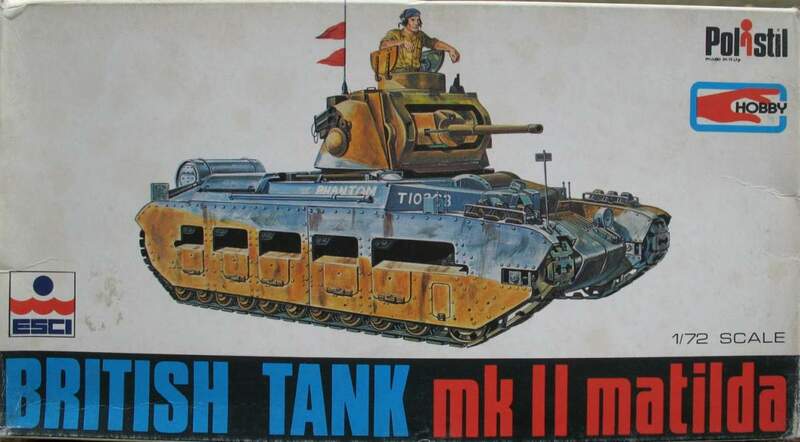 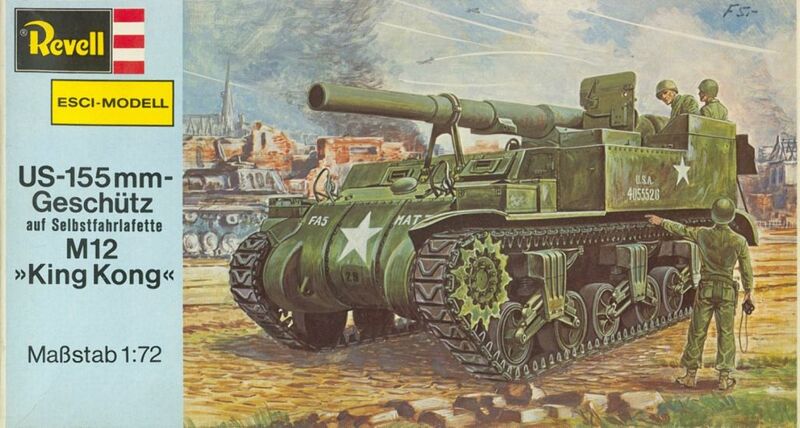 People with keen eyesight will also spot subtle differences in the vehicles pictures too, the M4A1 Sherman being a good study object for boxart detail variaty : it was released by various manufacturors in at least 12 different boxes (currently by Italeri) !!! 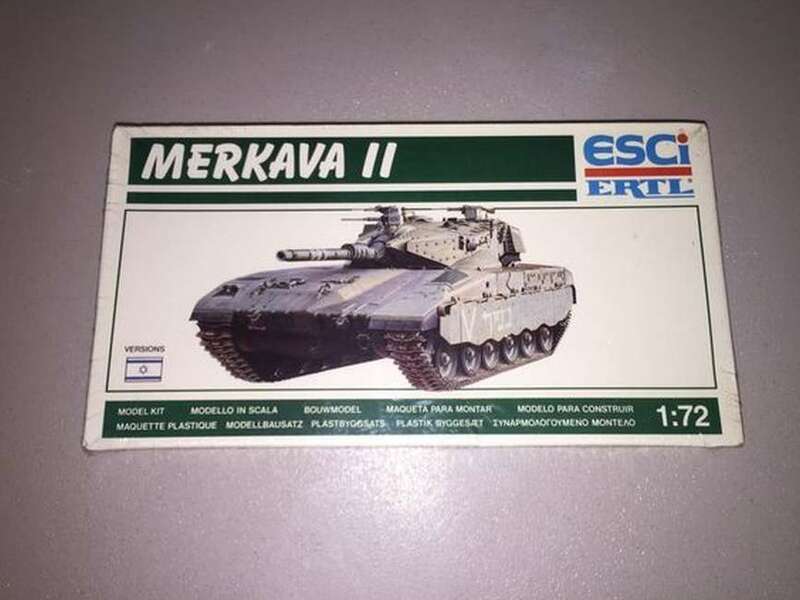 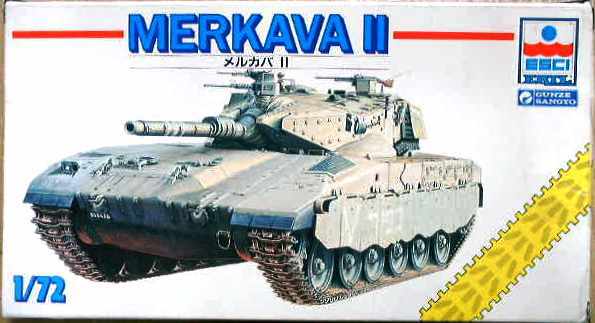 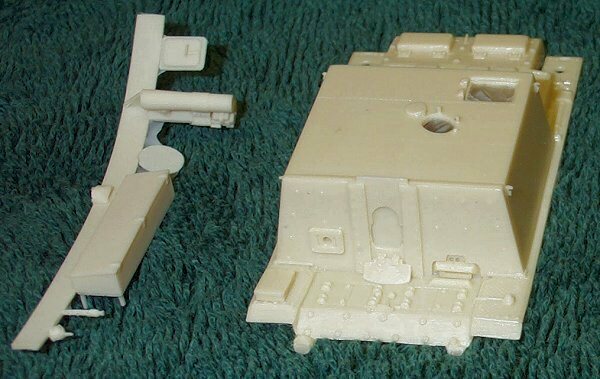 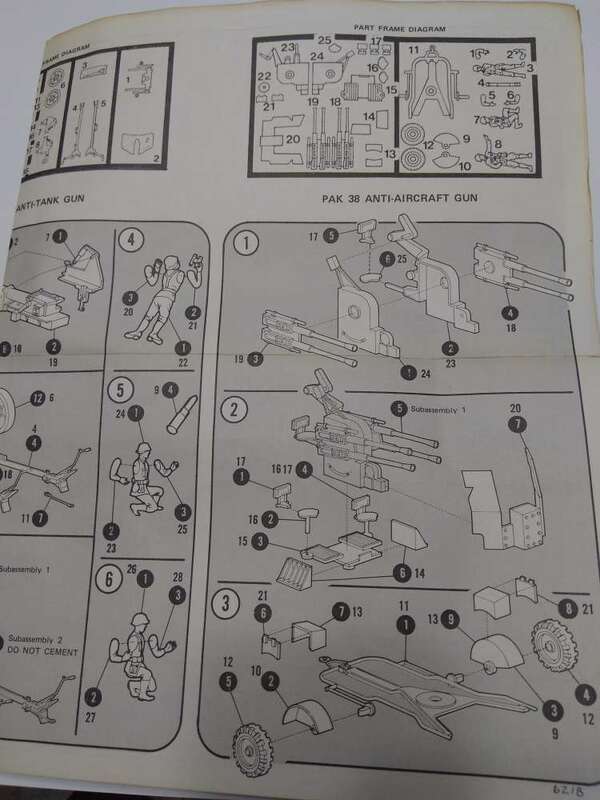 The verry early Revell Esci H-2300 releases had a plain carton/white underside but a little later they were all released with the same color profiles at the bottom as the Esci 8000 Armor series. 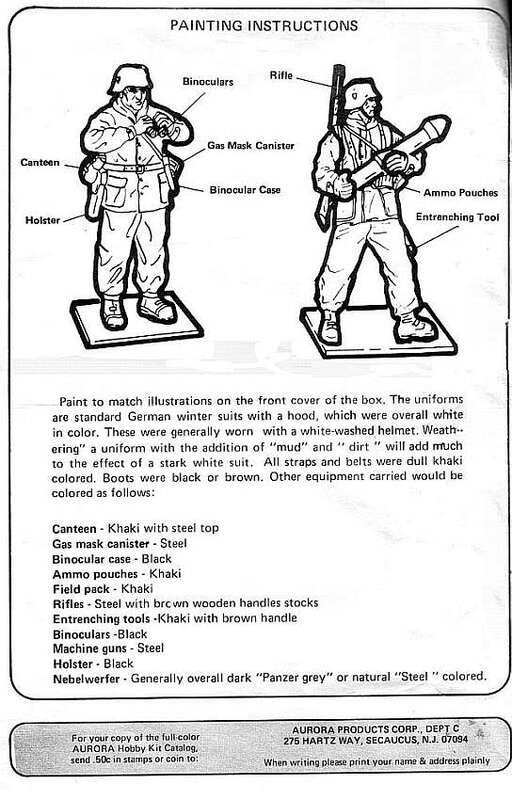 Again details could change, especially the colors ! 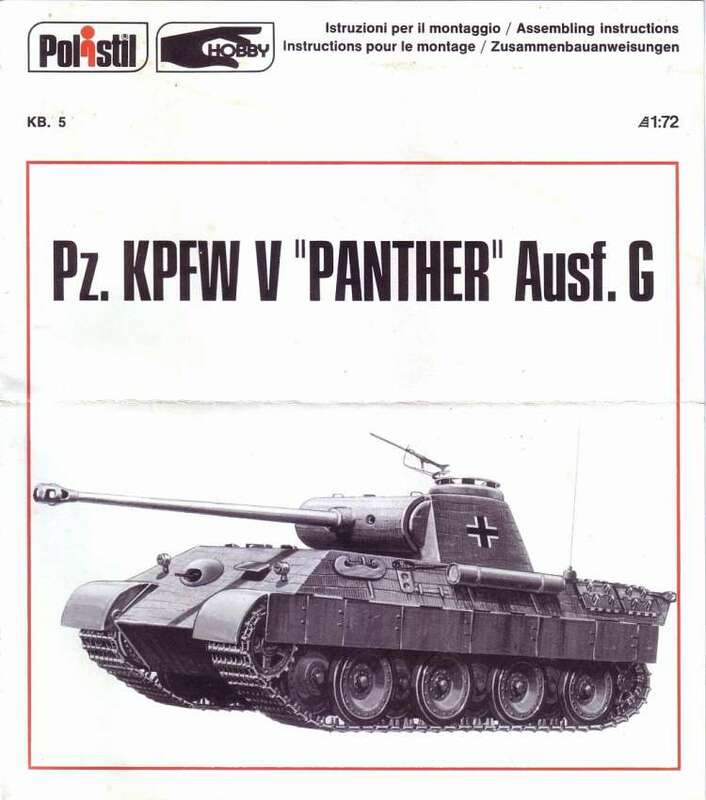 The PzKfW IV G (H-2359) and the Sherman Calliope (H-2360) were the last releases in the two part boxes and they regrettably had the plain white undersides again. 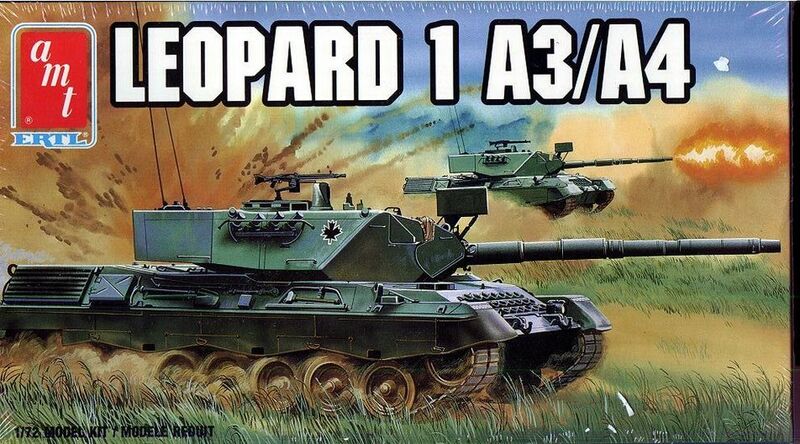 (I do hope to stand corrected on this one !!). 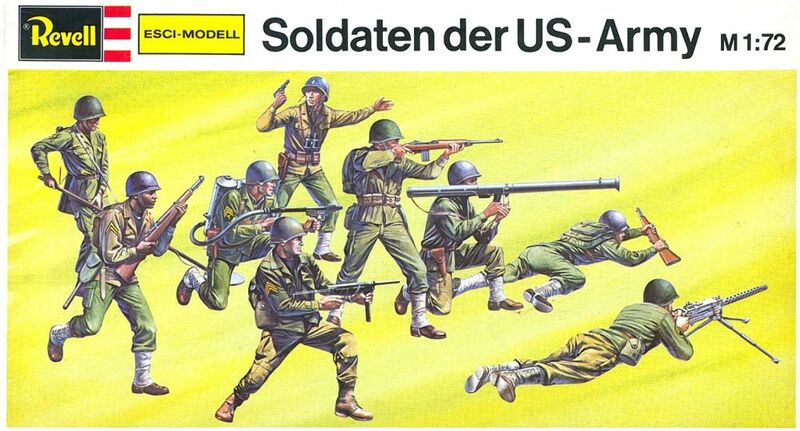 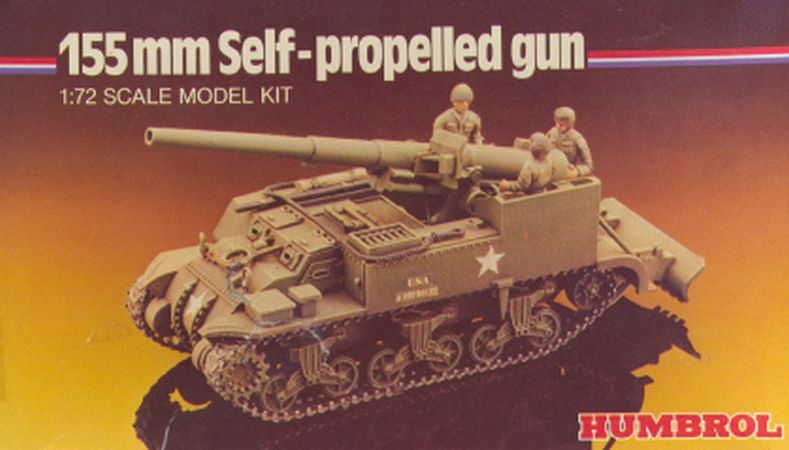 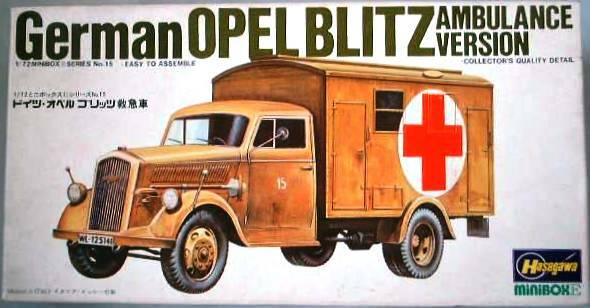 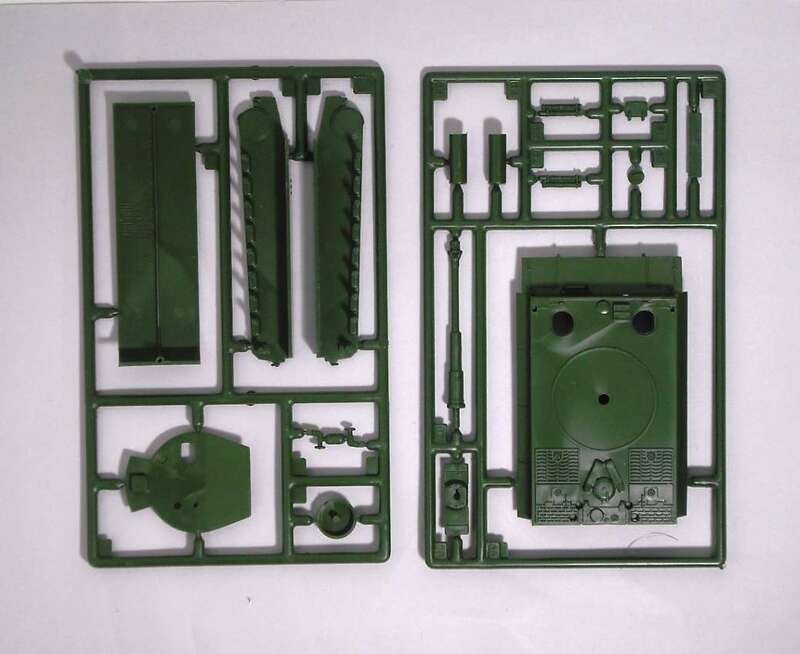 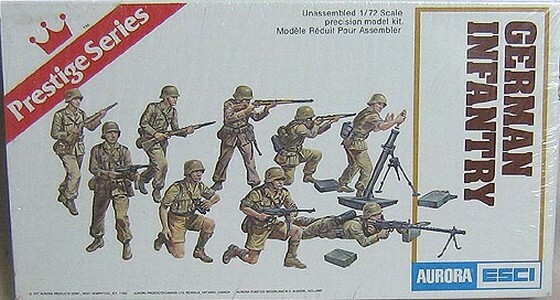 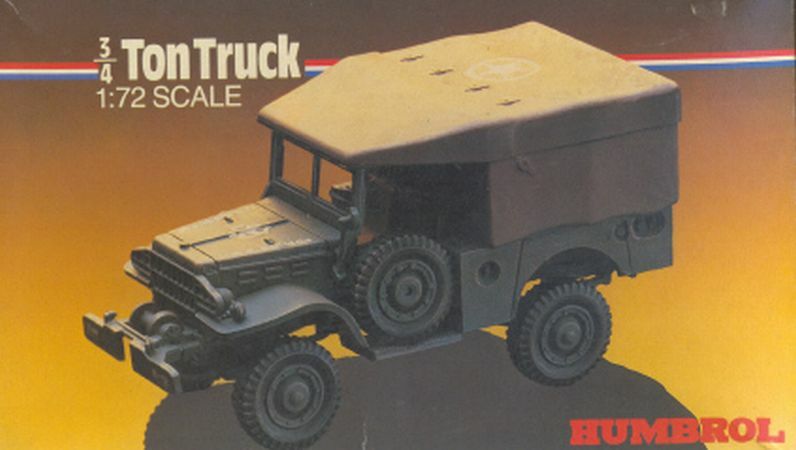 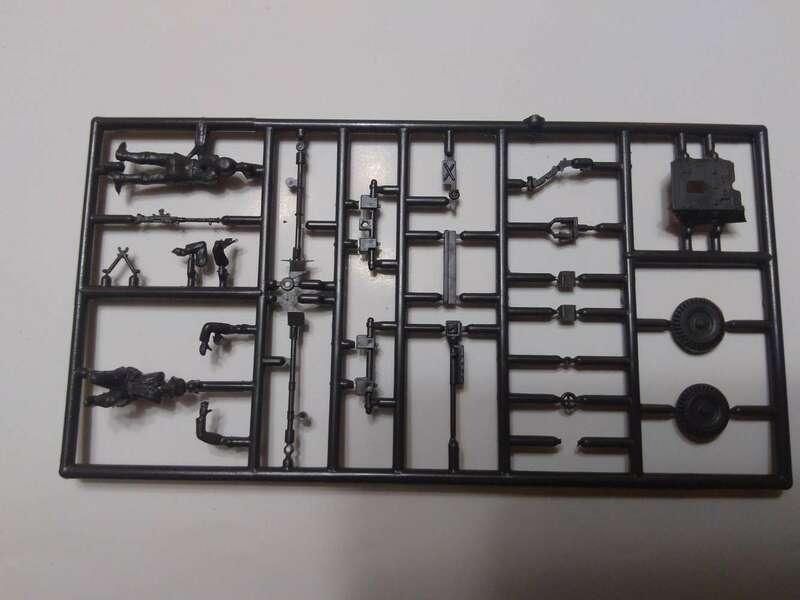 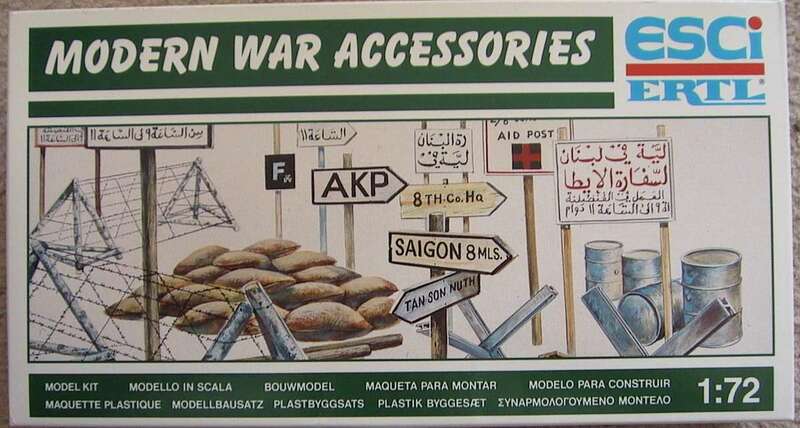 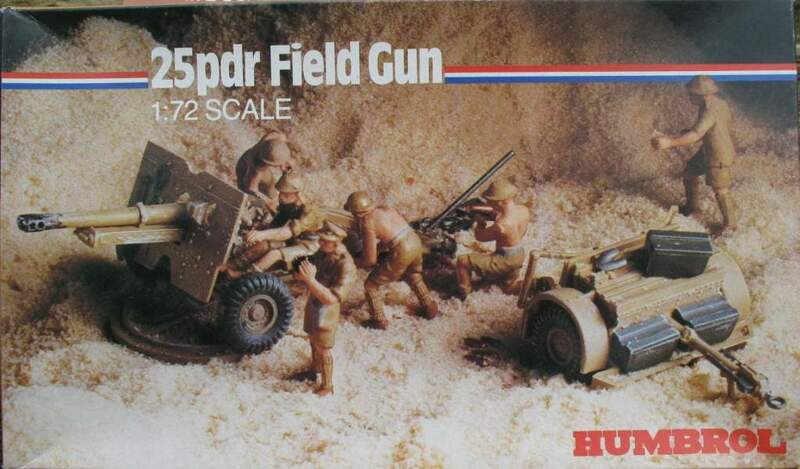 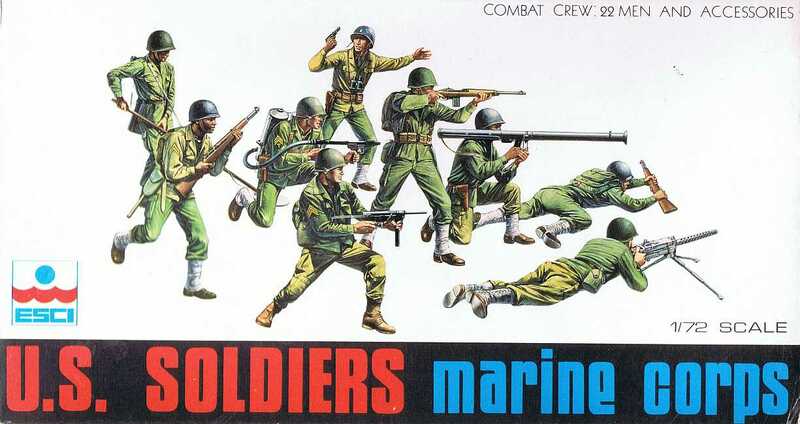 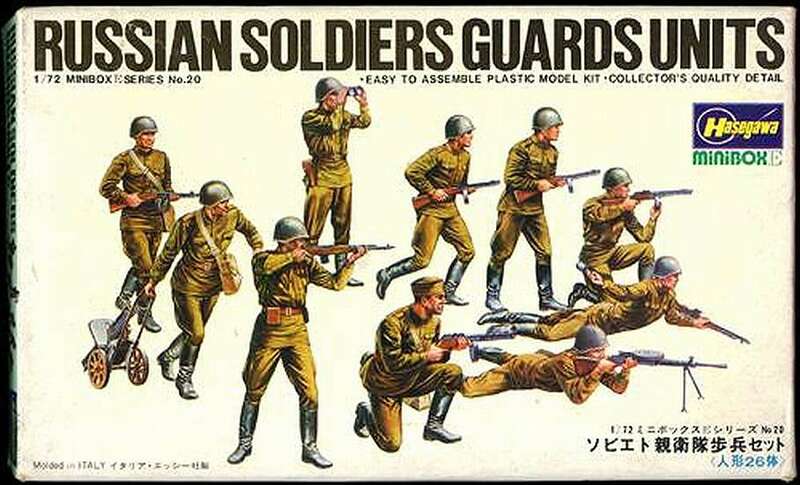 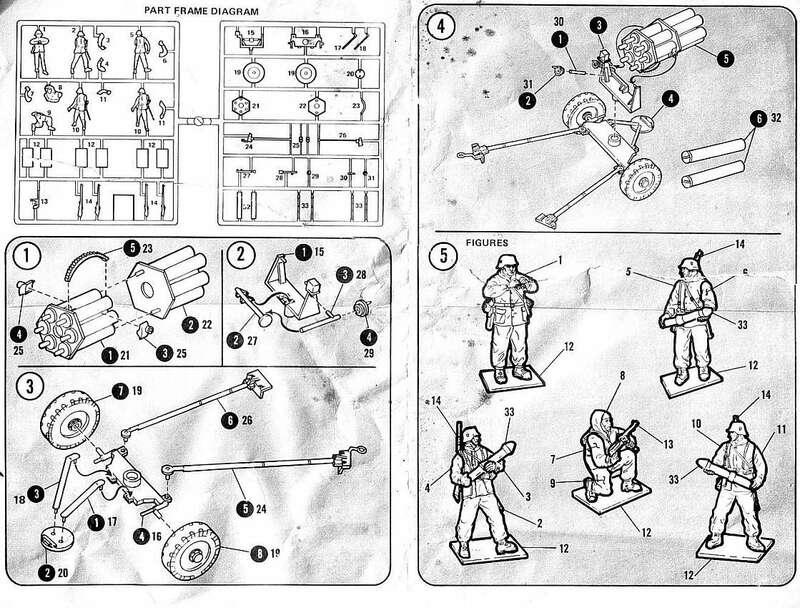 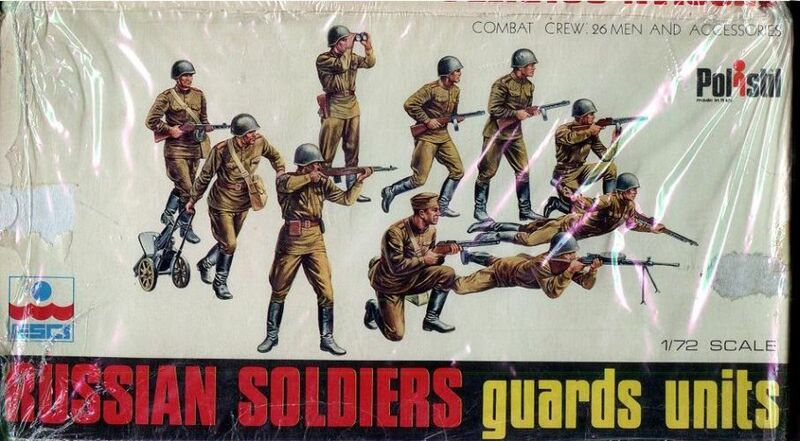 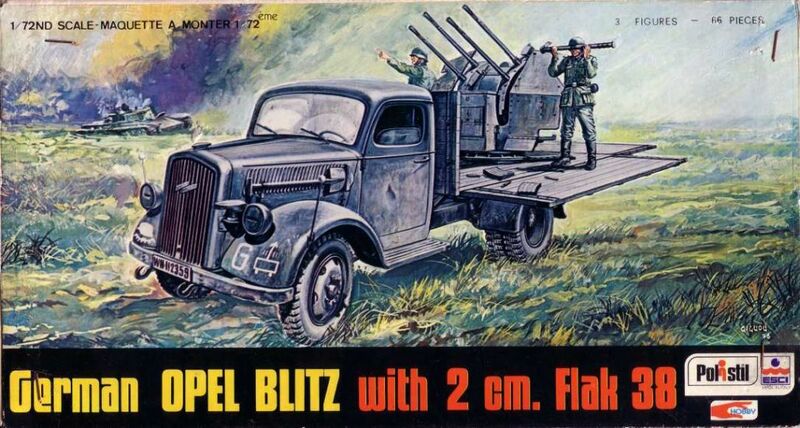 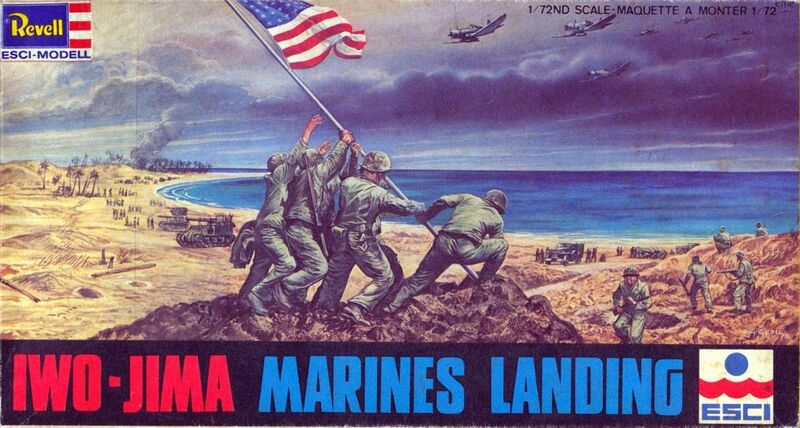 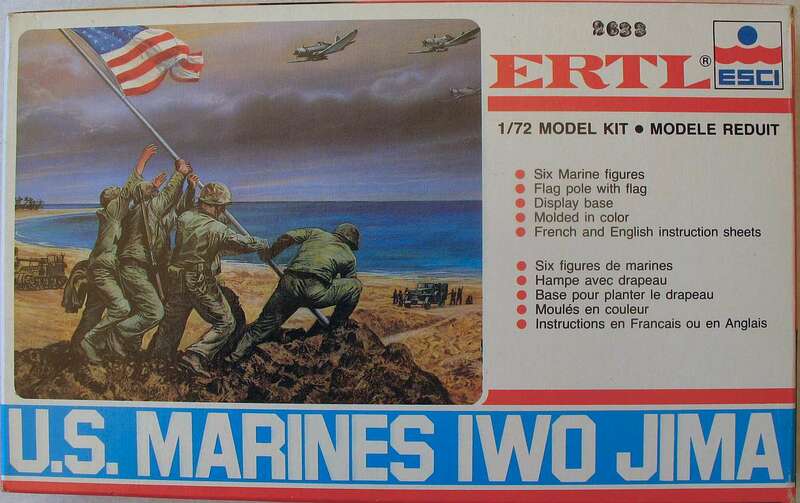 The three issues after that : the Diorama Accessories (H-2361), the Japanese Soldiers (H-2362) and the Iwo Jima Marines (H-2363) only appear in the normal Esci full color 8000 series flipopen boxes and they carry a "REVELL ESCI MODEL" logo sticker at the box top corner and/or sides, usually together with the "H" number. 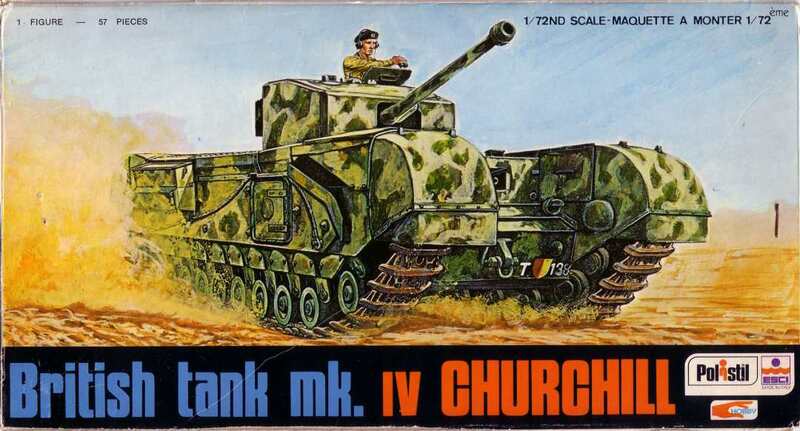 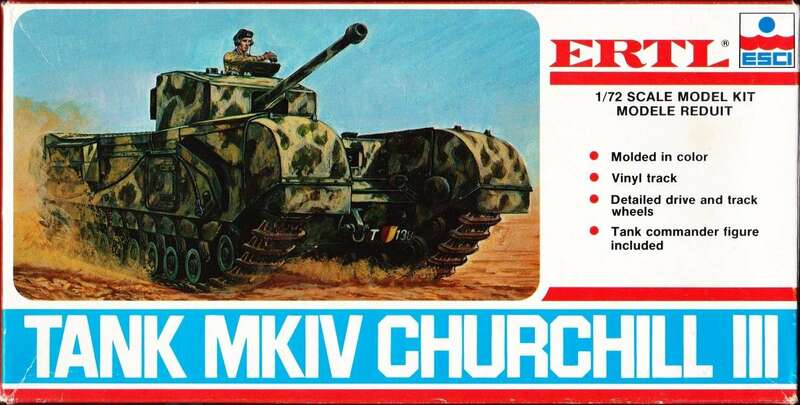 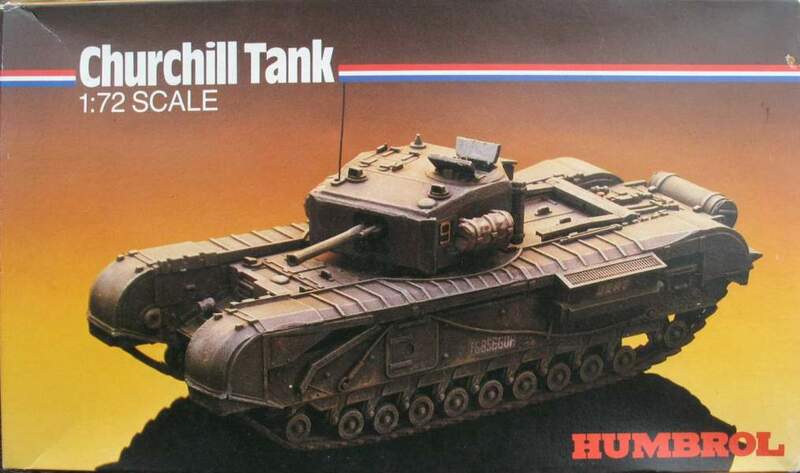 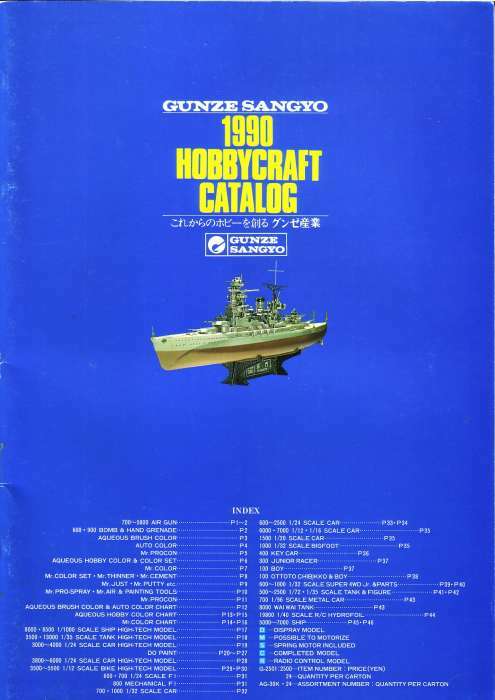 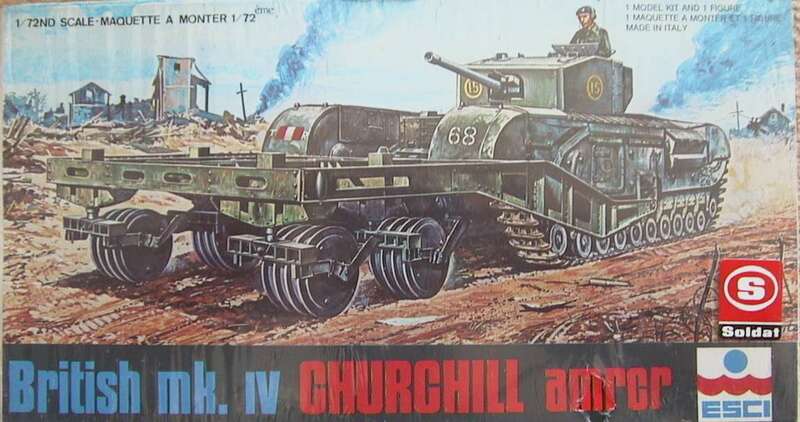 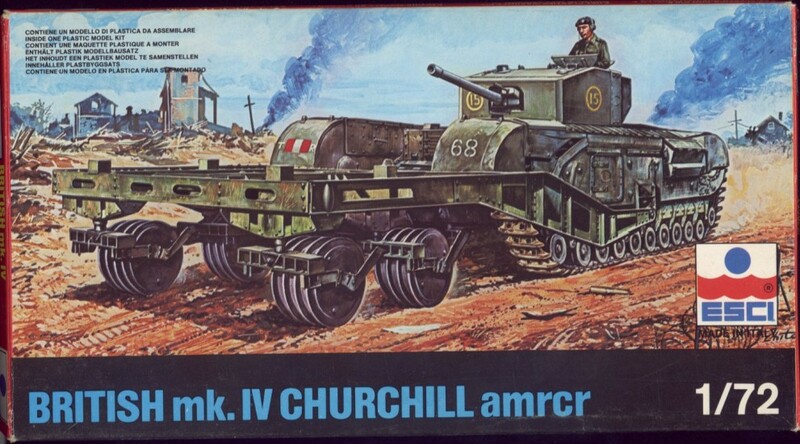 The Bishop (H-2344) and the Churchill AMRCR (H-2349) were later releases and also got the normal Esci 8000 box with the Revell stickers. 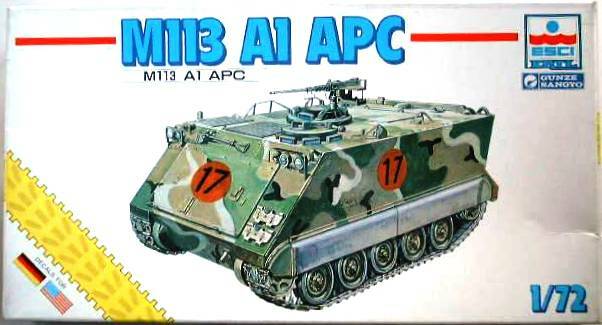 (I only have seen the AMRCR confirmed). 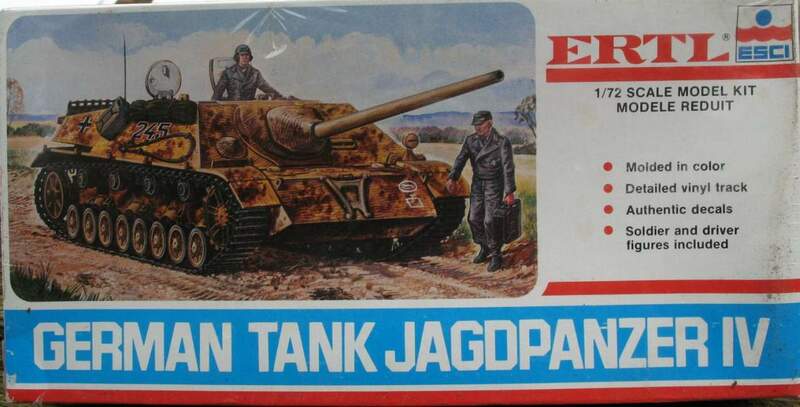 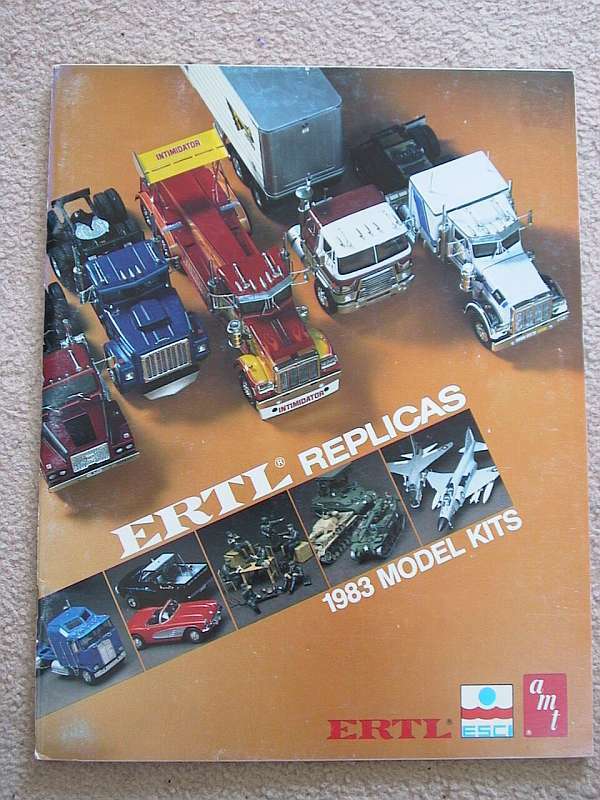 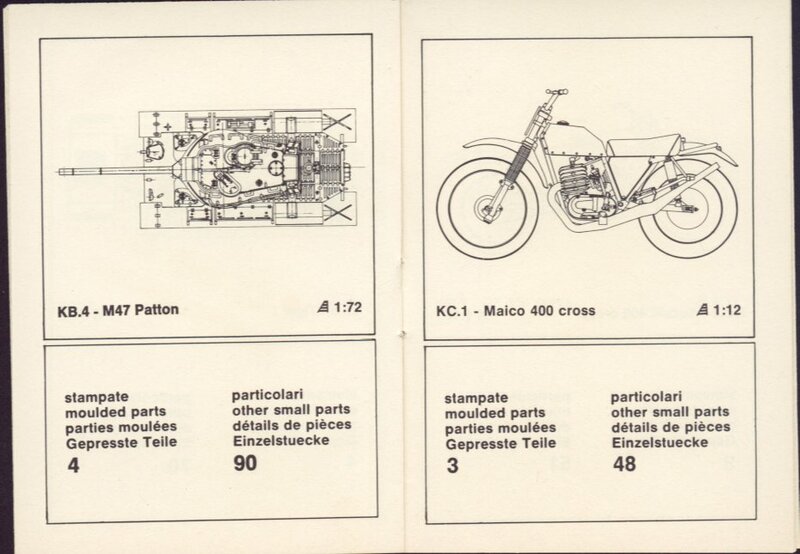 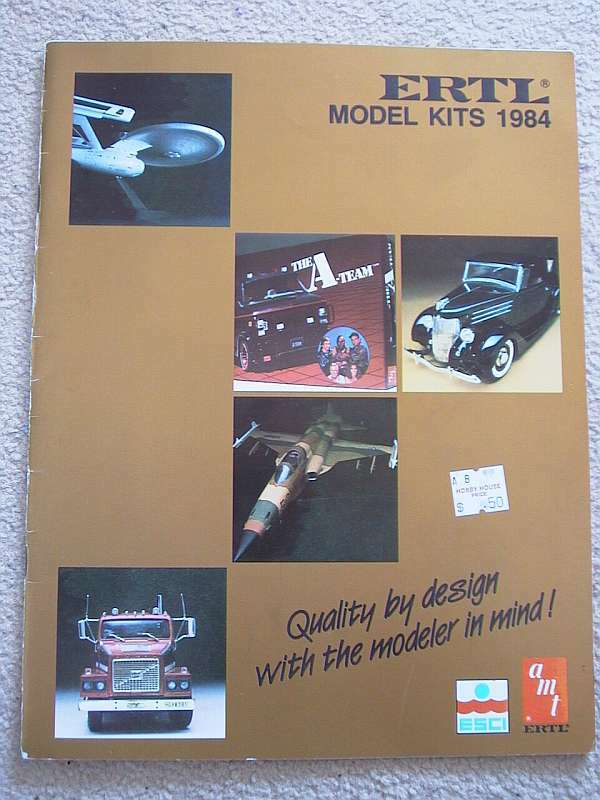 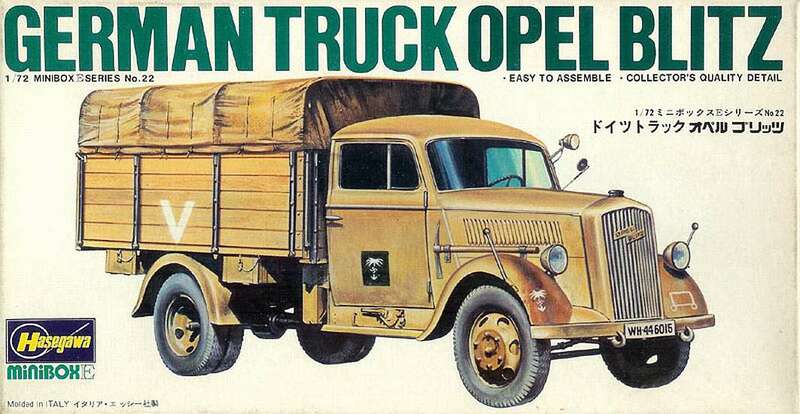 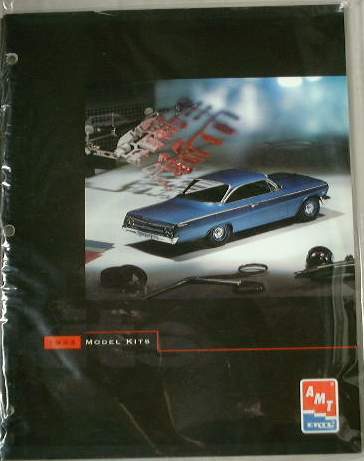 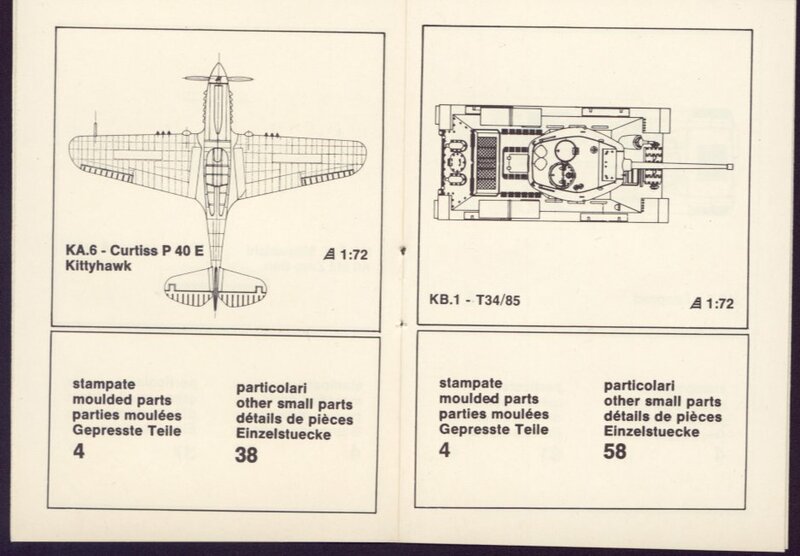 Untill 1980/81 also other normal Esci 8000 kits are seen with the Revell stickers. 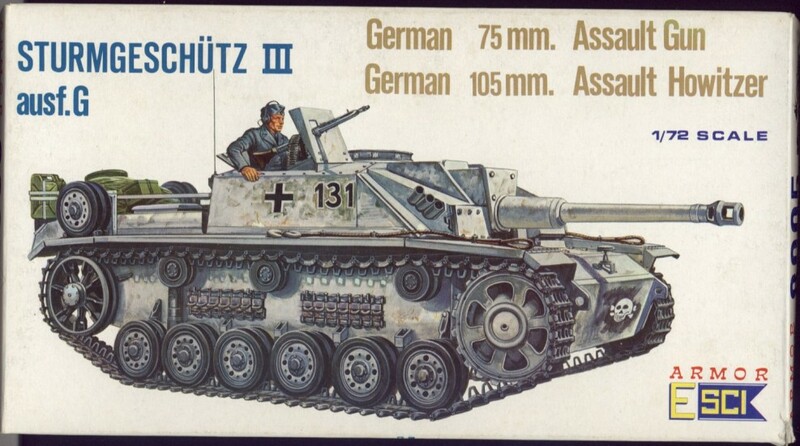 (Confirmed is the Hetzer). 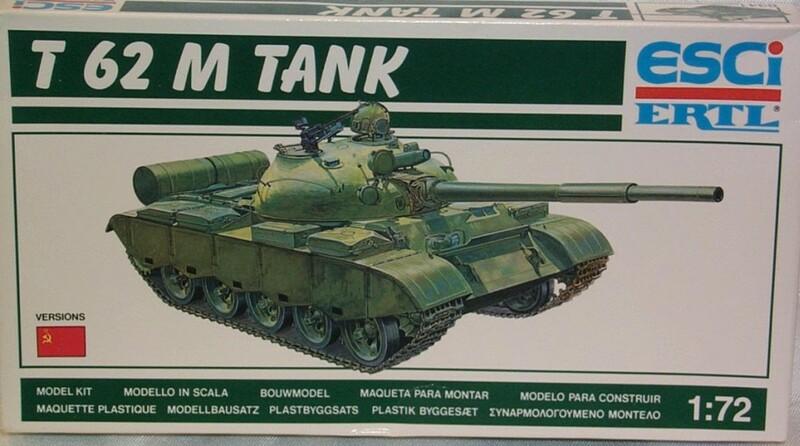 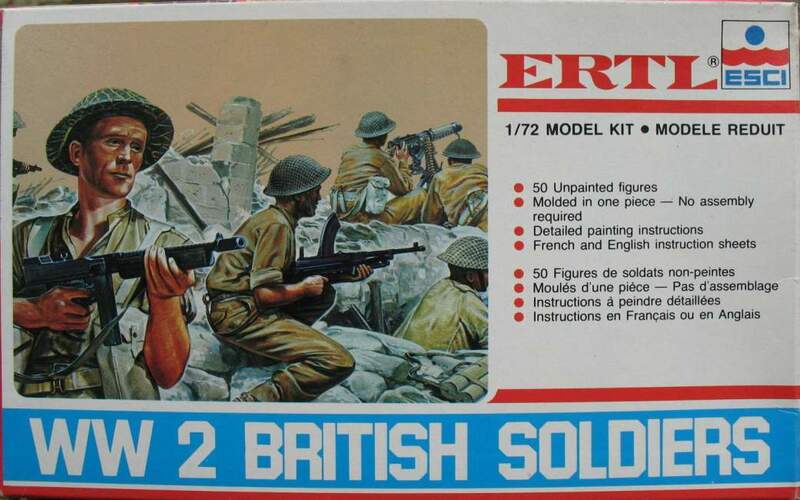 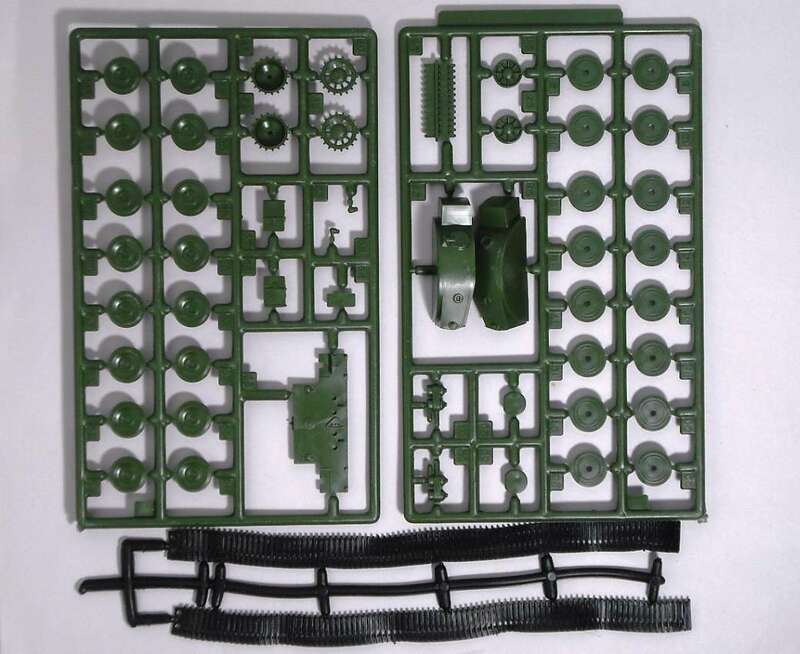 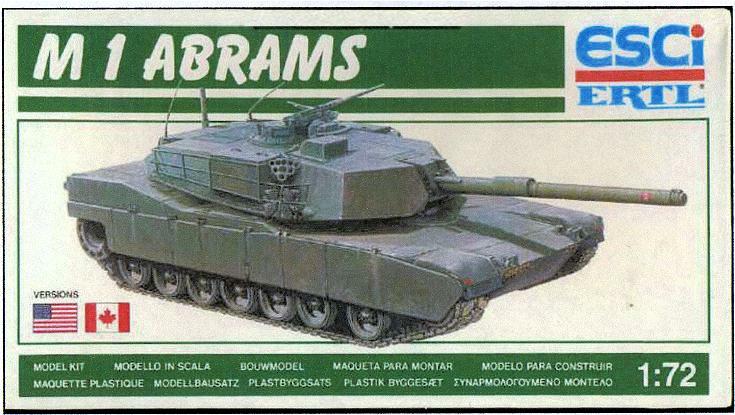 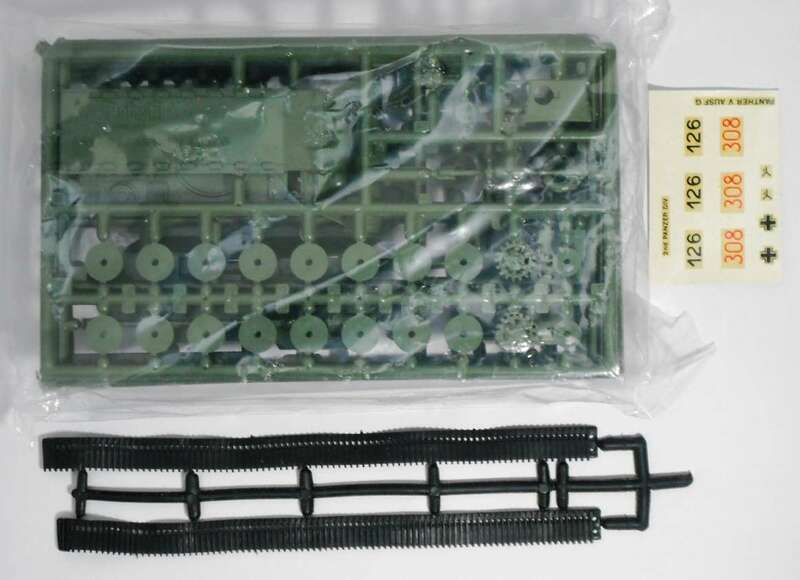 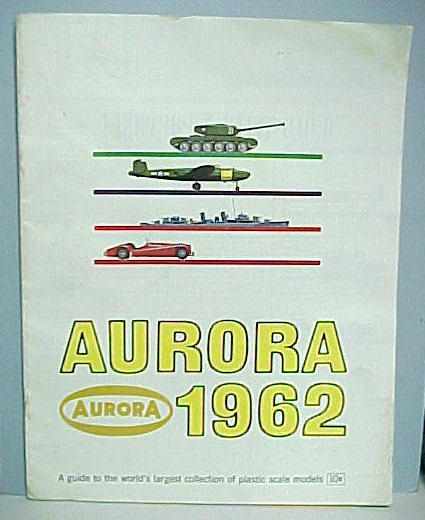 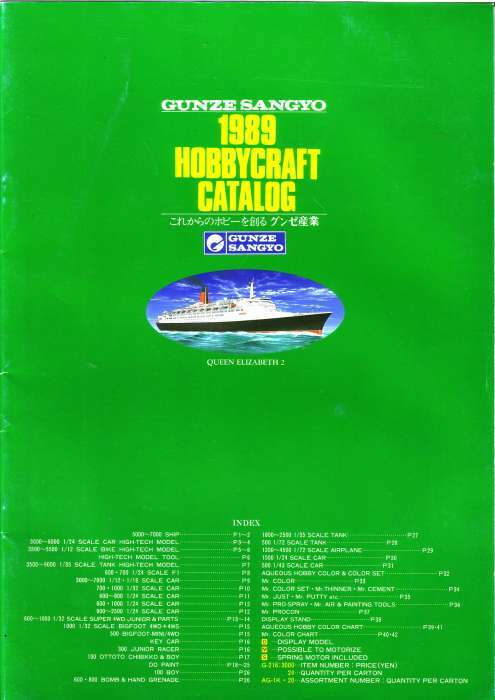 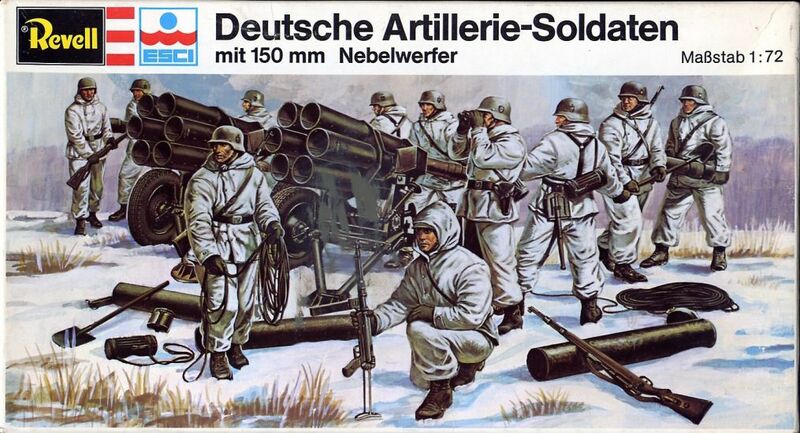 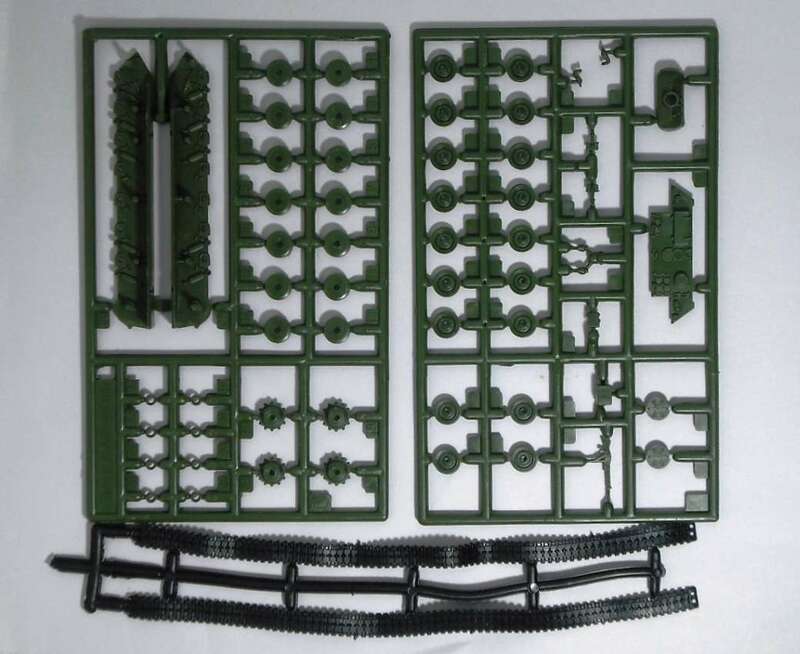 The last release from the Esci kits was under ESCI-ERTL label in White-Green boxes. 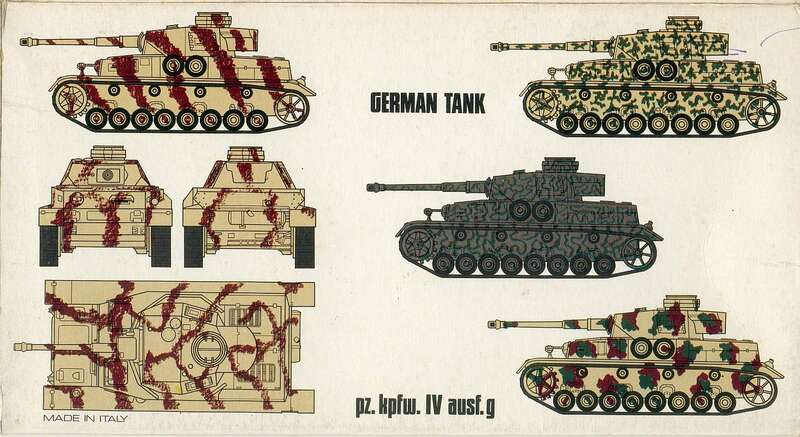 Who is so kind to help me with other scans of this series!! 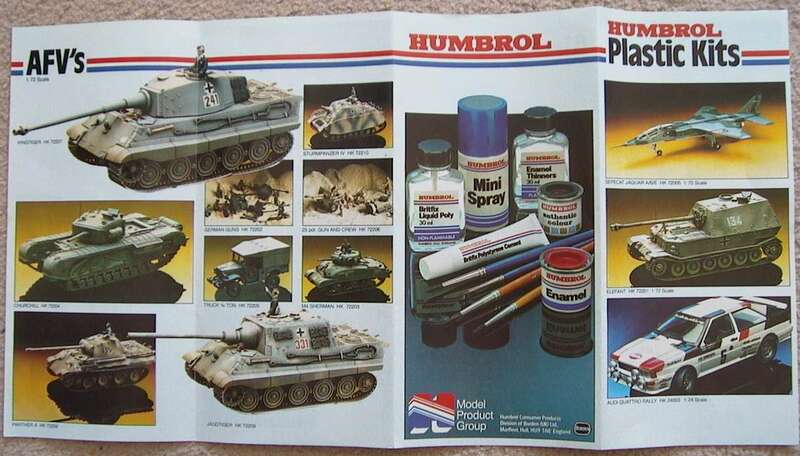 The Humbrol-Esci series started approximately in 1991. 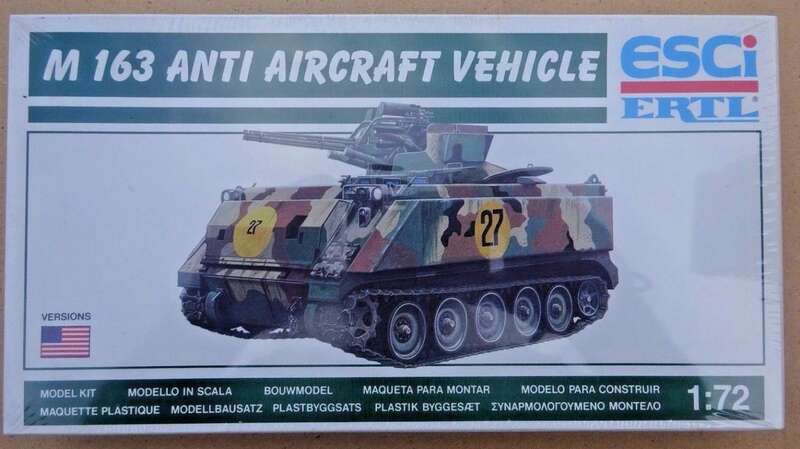 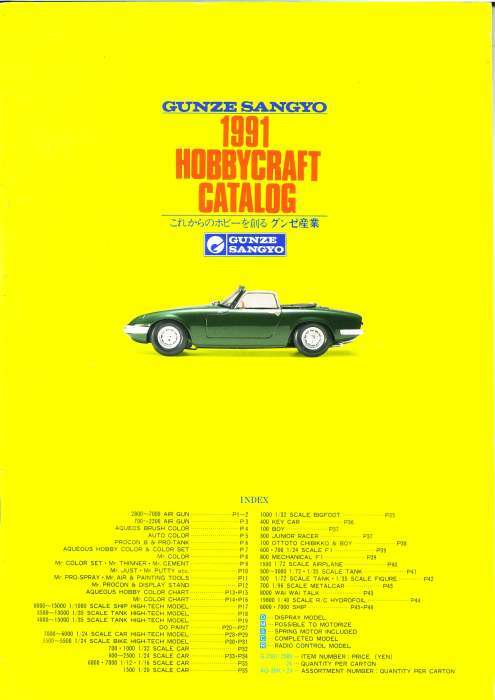 The boxart was the same as the Humbrol Heller aircraft 1/72 series : a picture of a finnished model on a yellow orange floor. 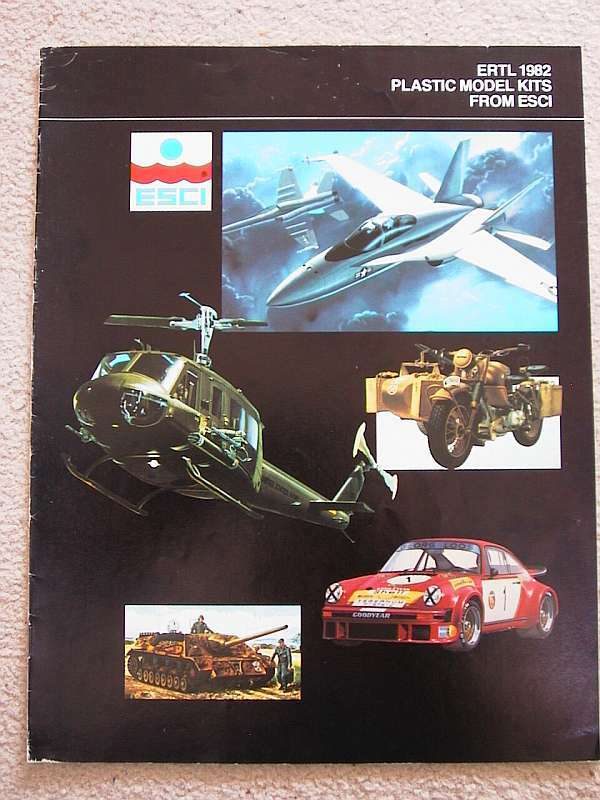 Verry ugly but boxart was like that in the early nineties. 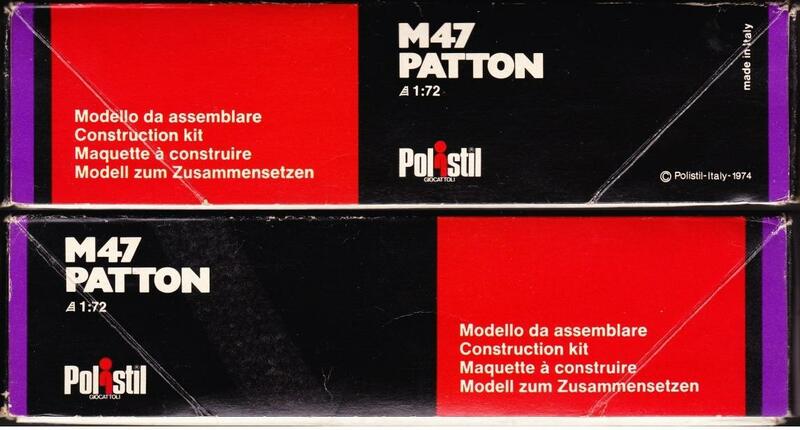 With the early whitebox "Armor" logo kits a POLISTIL logo sticker is put on the front of the box. 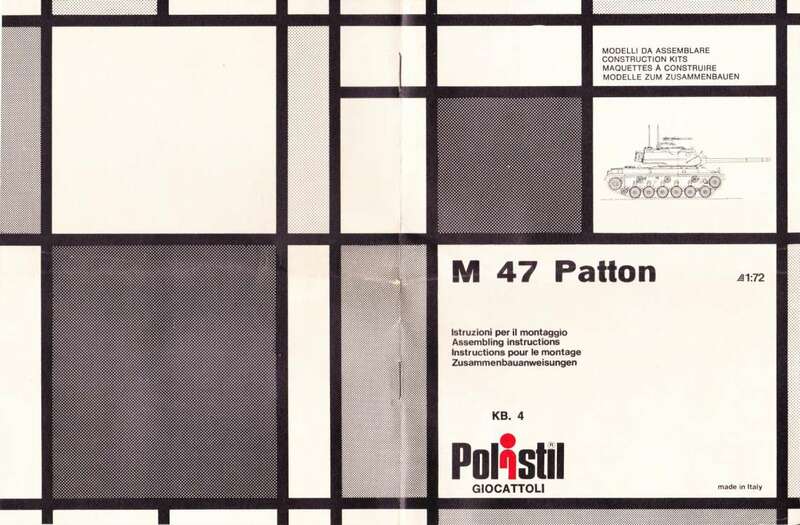 With the whitebox "flag" kits and the "black square" series kits things get complicated : They can have a POLISTIL logo sticker, a POLISTIL logo print or a POLISTIL HOBBY logo print... 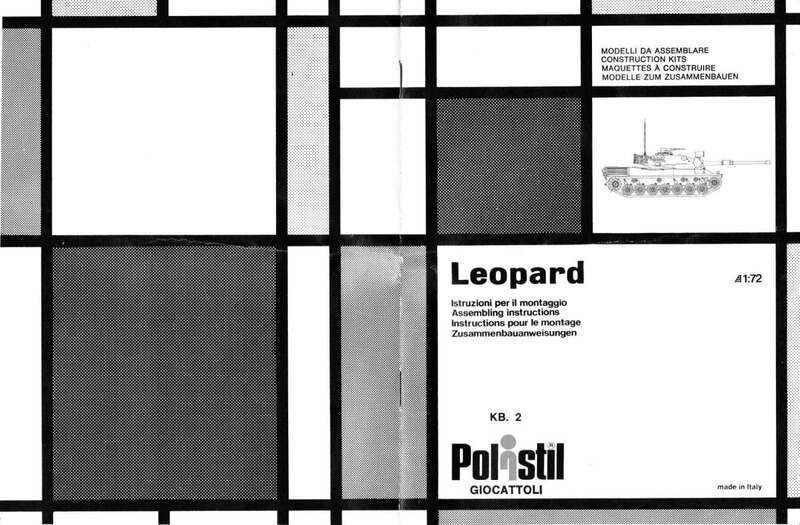 In general the "flag" series have very mixed logos and the "black square" series usually have the POLISTIL HOBBY logo print. 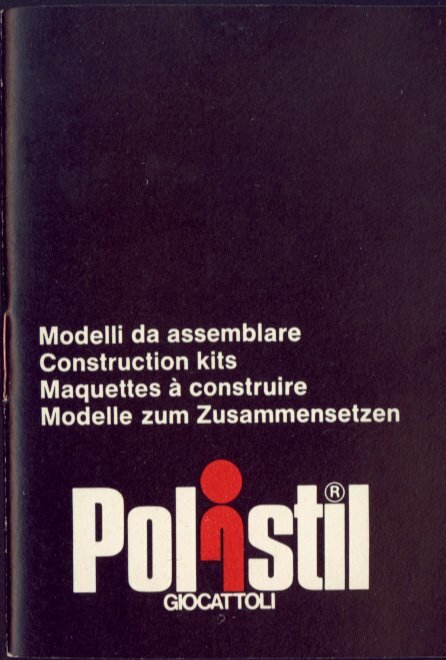 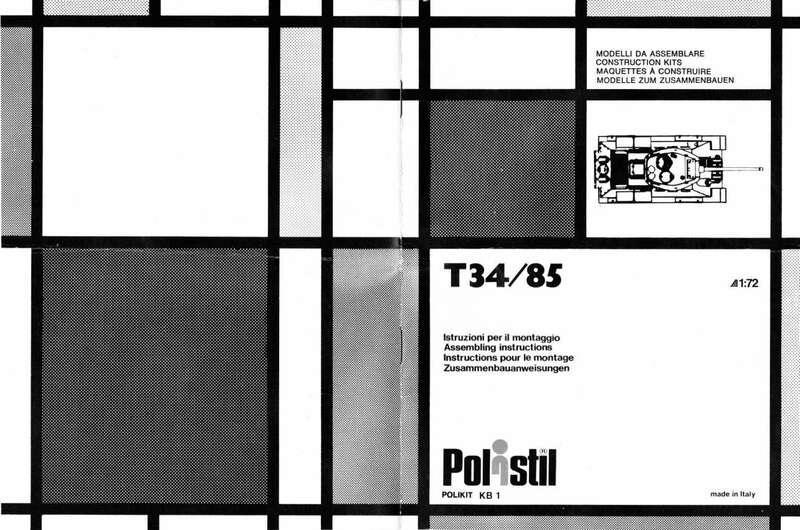 The POLISTIL logo sticker is seen throughout the series instead of a print. 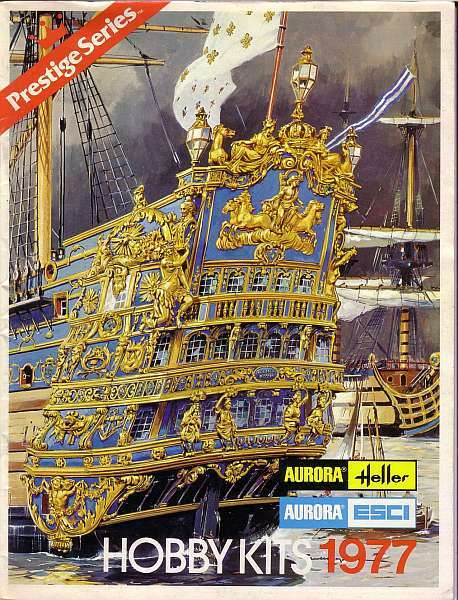 The full color boxart 8000 series with the colorprofile backs (that's a mouthfull !) 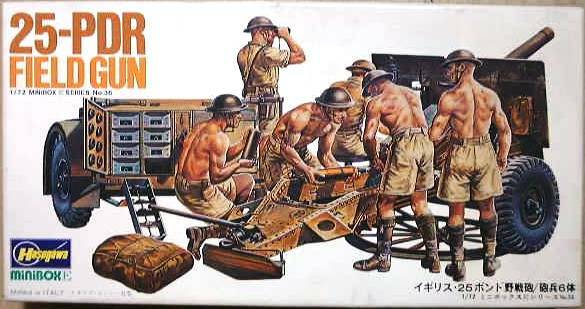 are again another story. 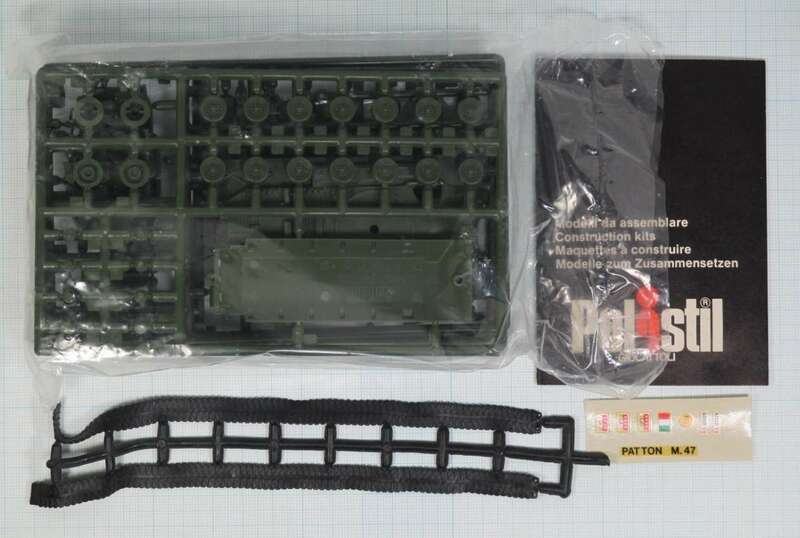 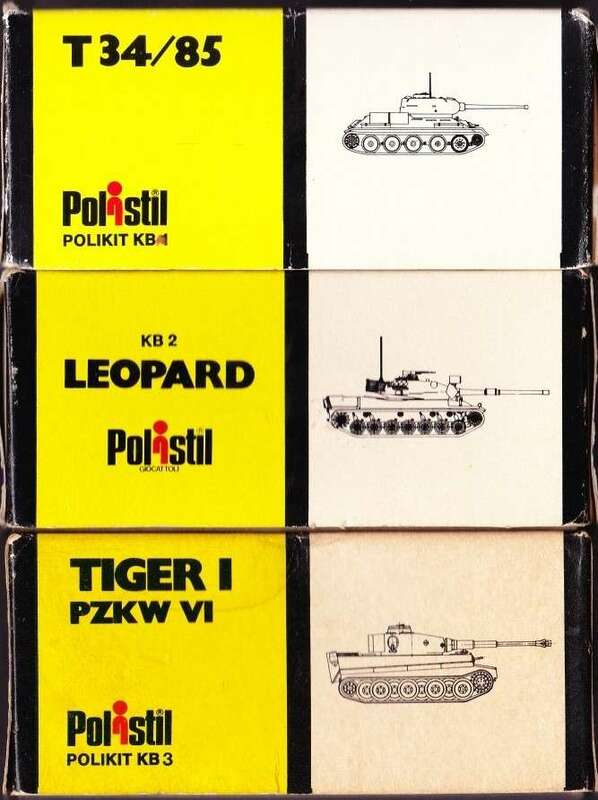 Up untill 8054 they are confirmed to have a POLISTIL HOBBY ESCI logo print on the front and sides of the box were usually the normal ESCI logo is printed. 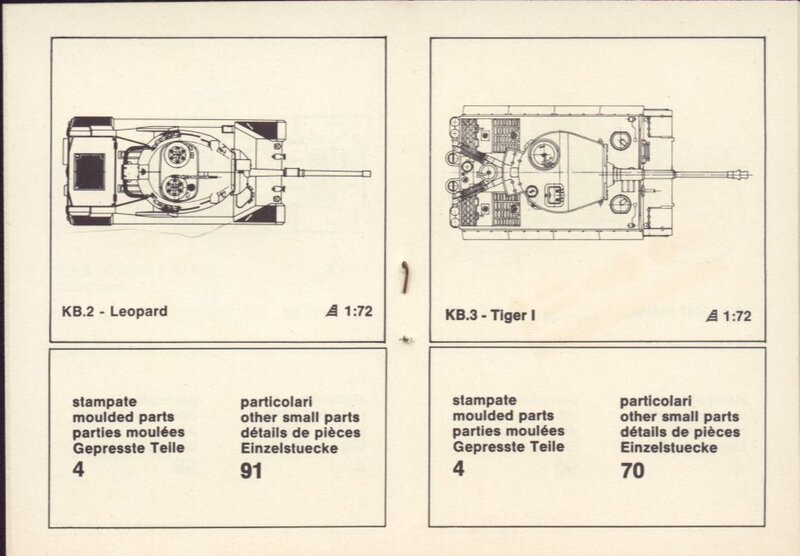 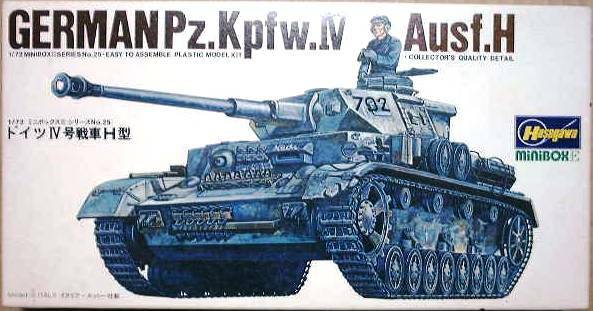 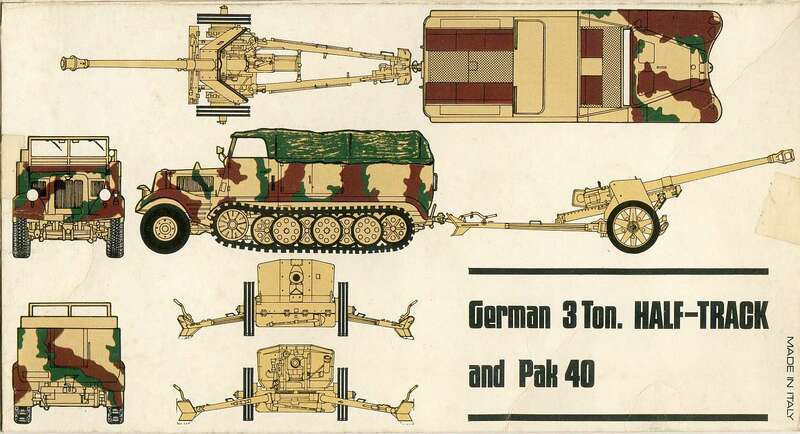 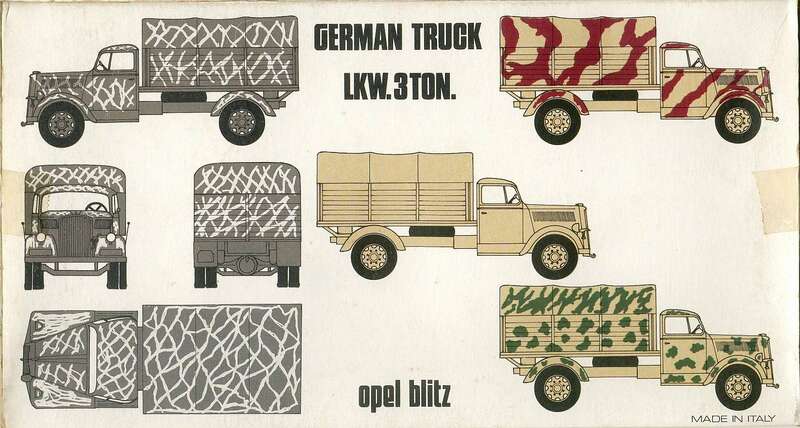 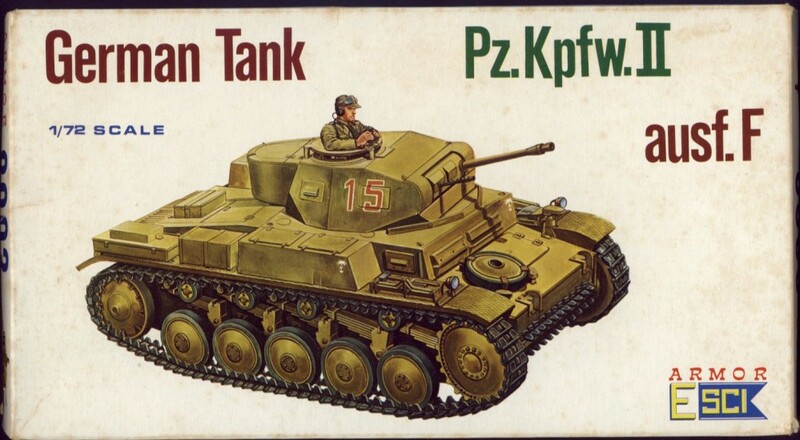 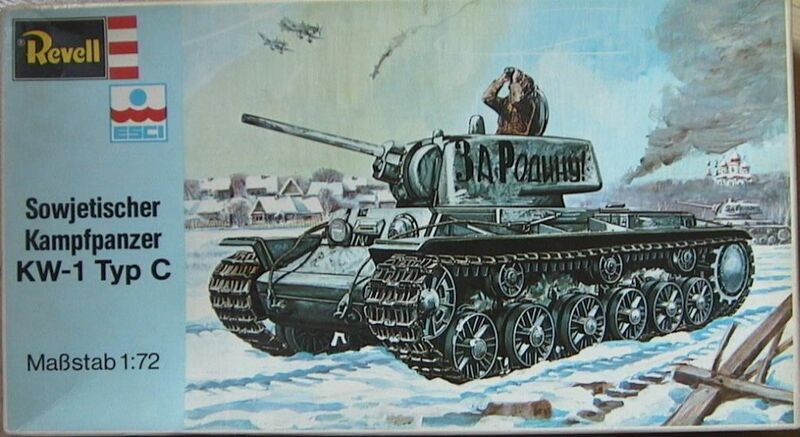 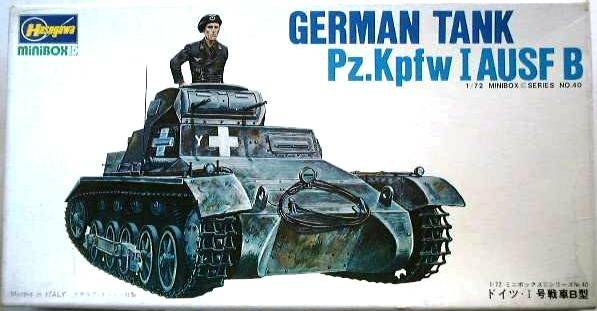 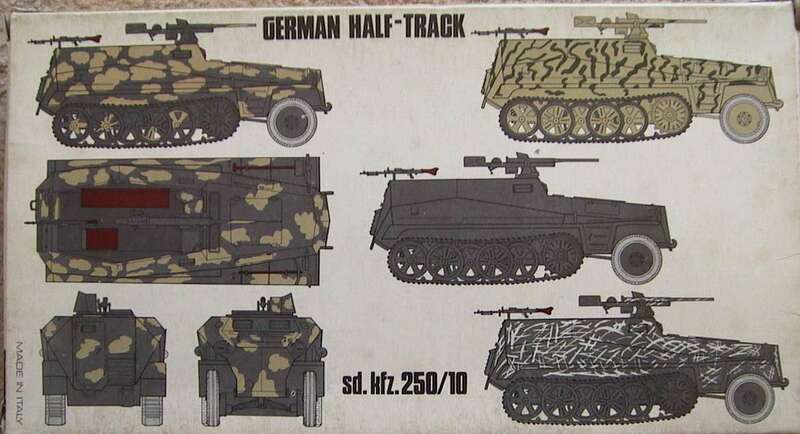 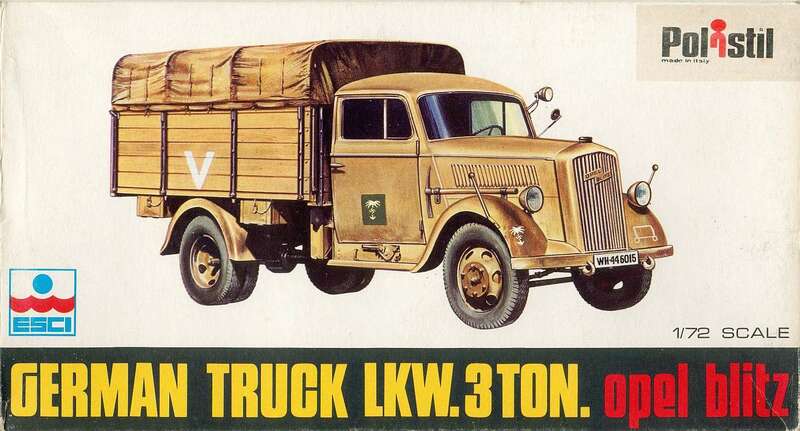 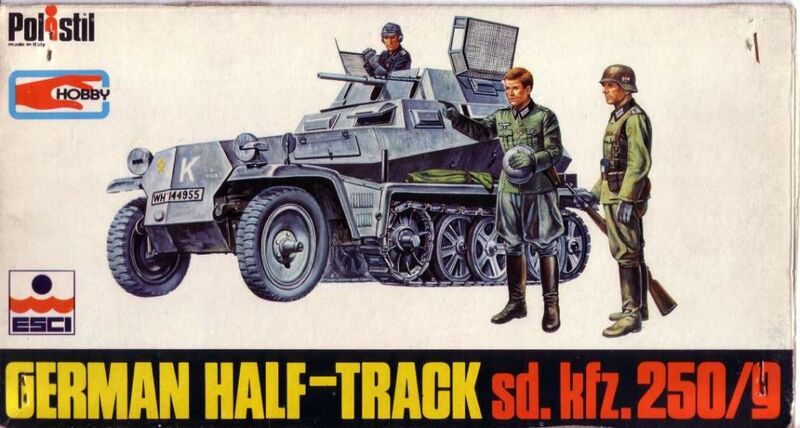 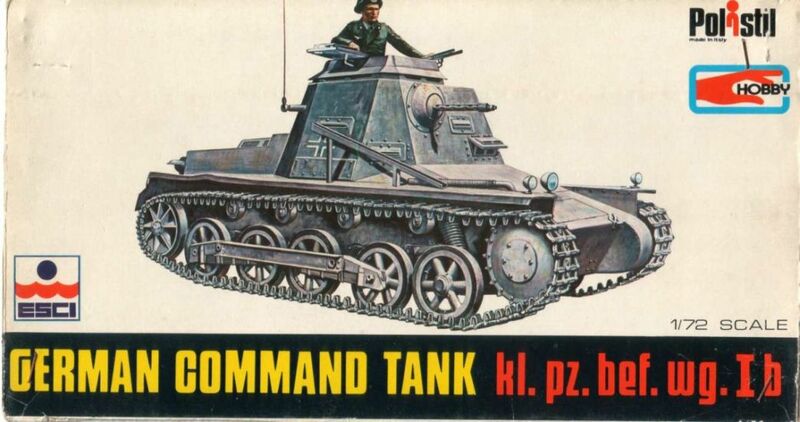 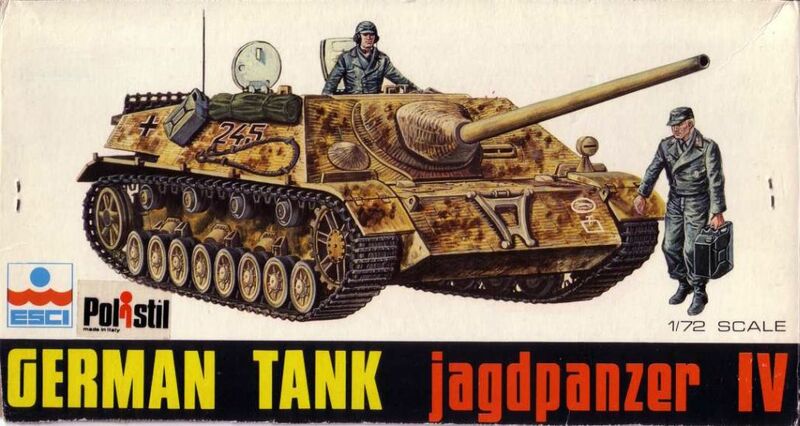 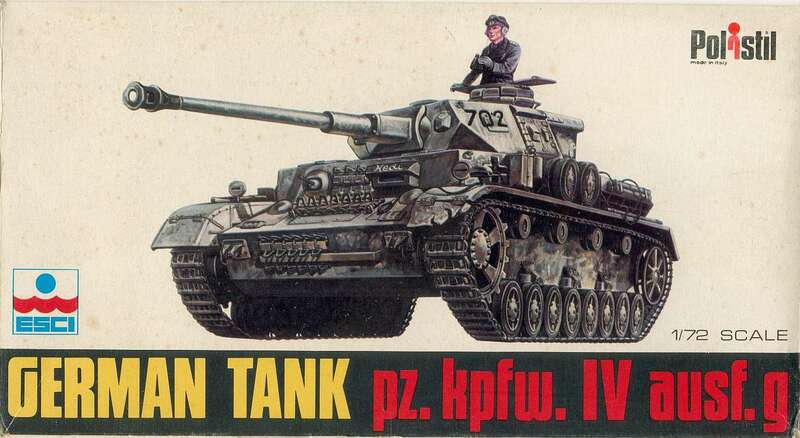 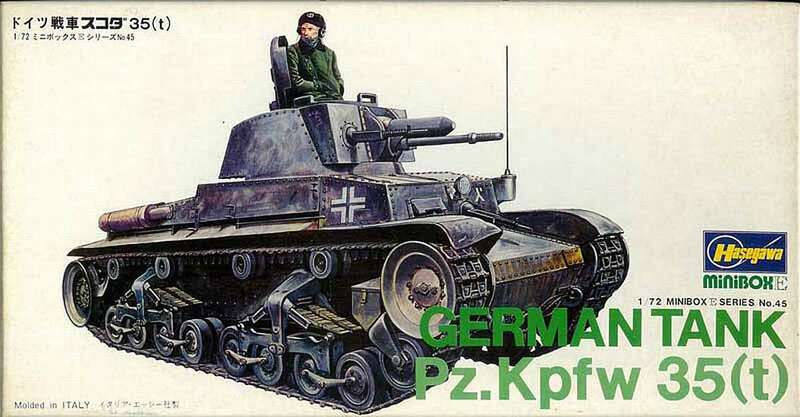 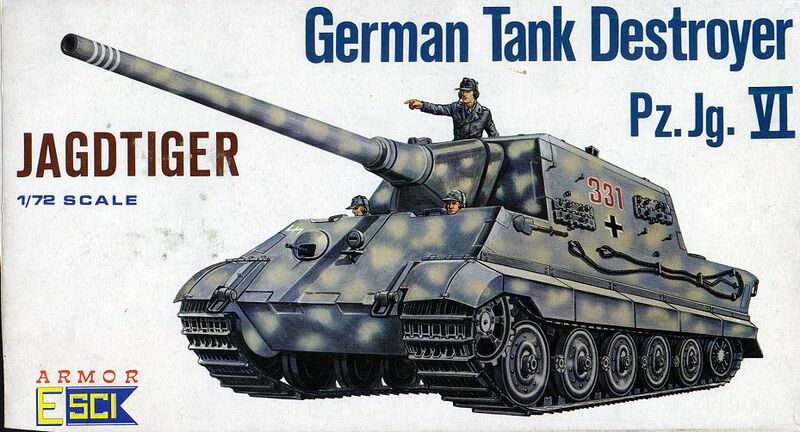 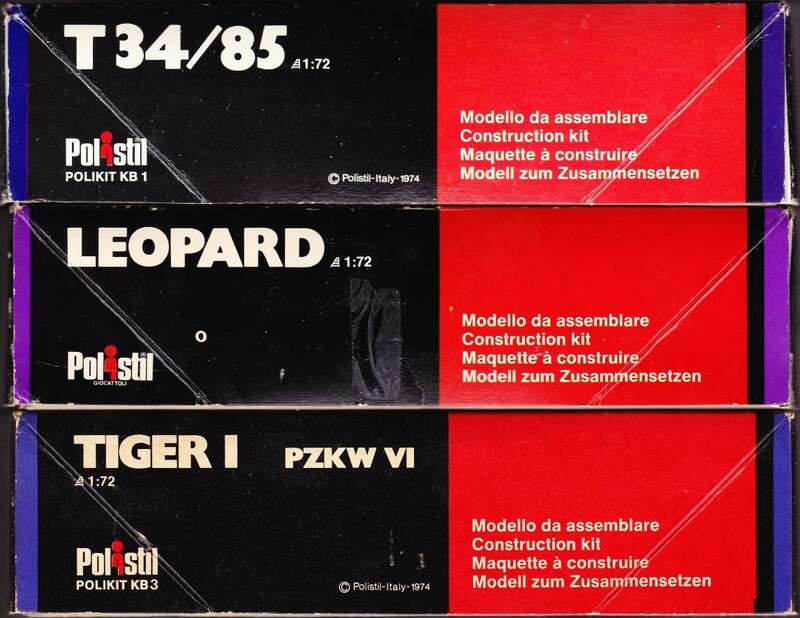 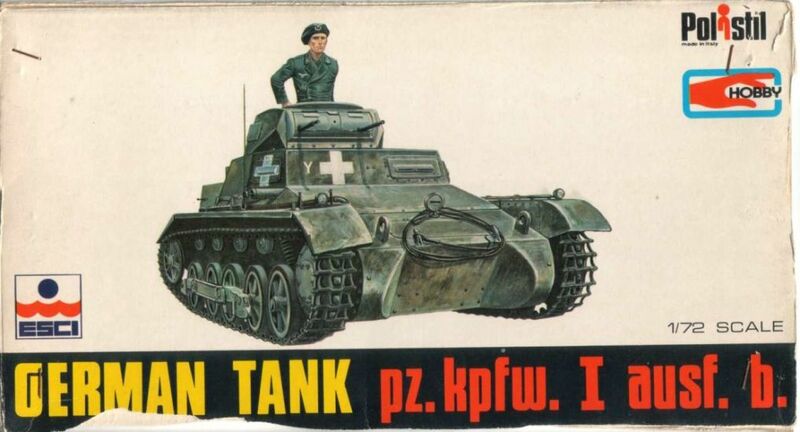 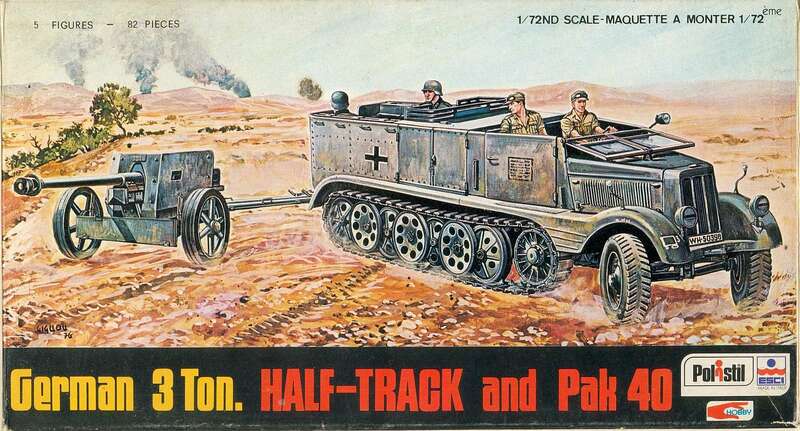 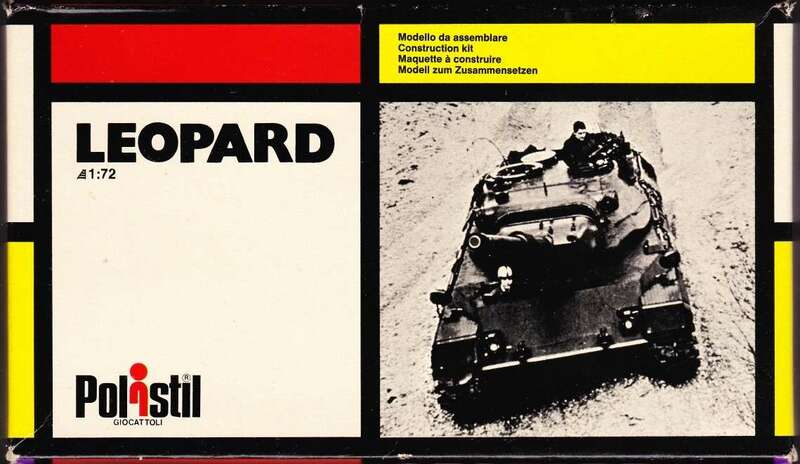 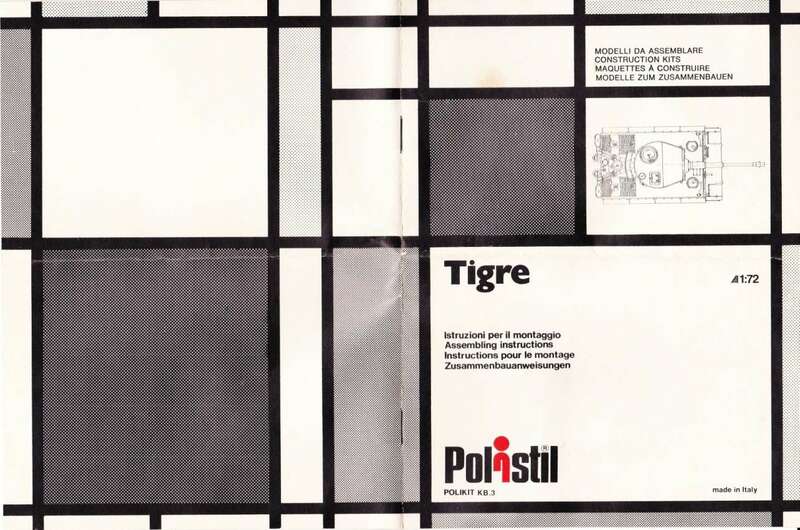 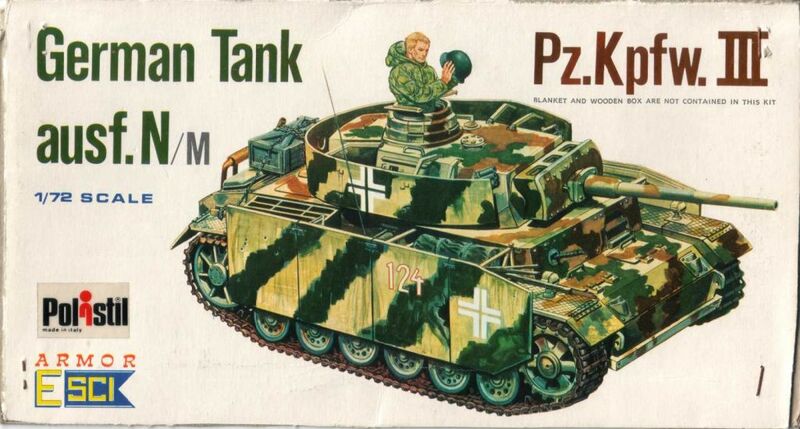 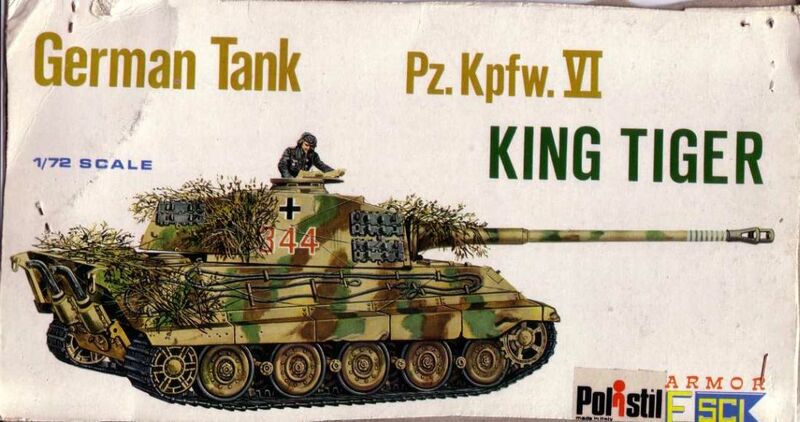 From then on a white POLISTIL logo sticker appears randomly on the later full color 8000 series; confirmed are the PzKfw II F (8003), the Kingtiger (8008), and the SdKfz 251/16 Flamm (8055). 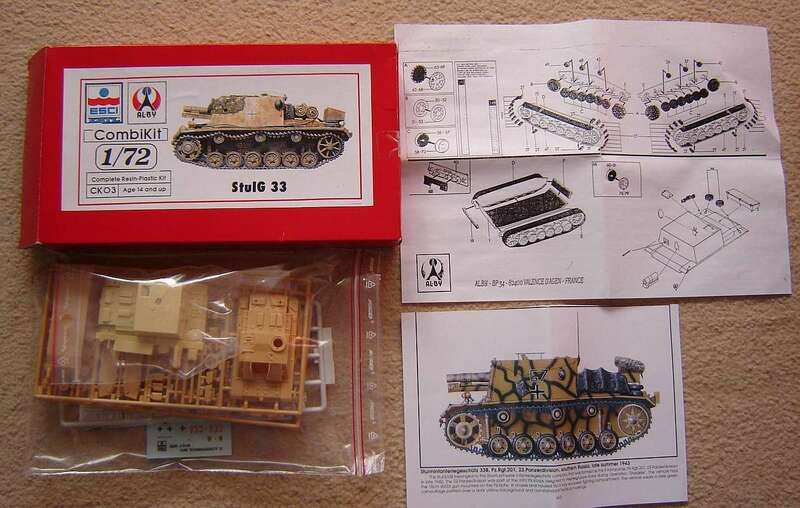 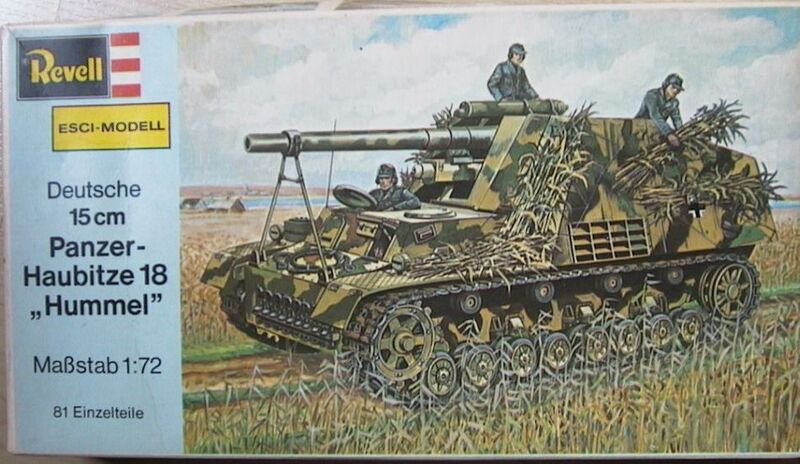 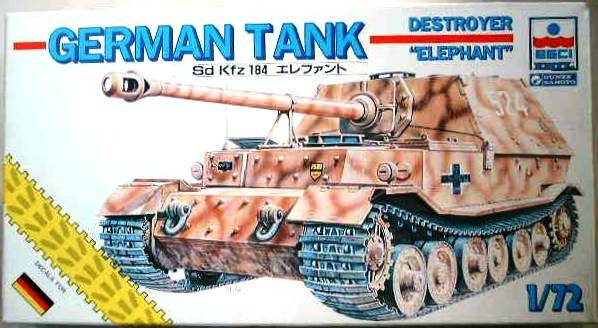 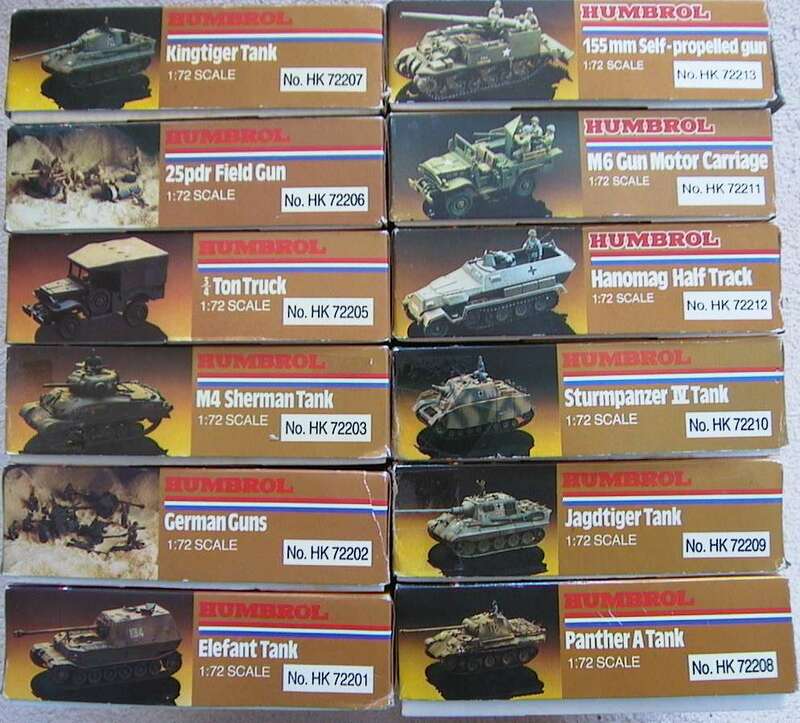 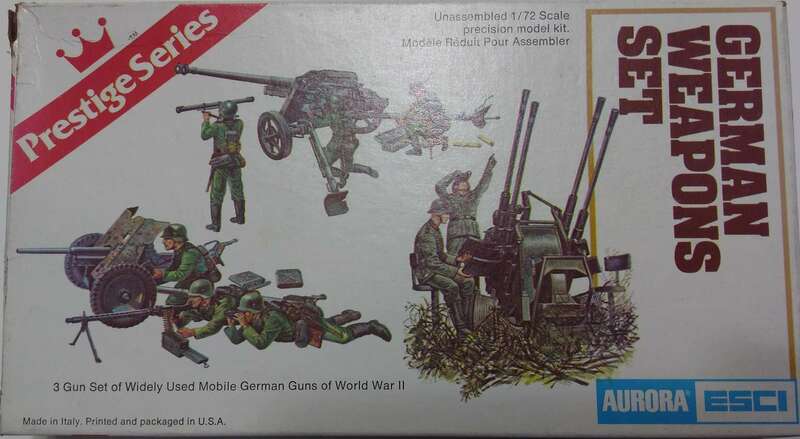 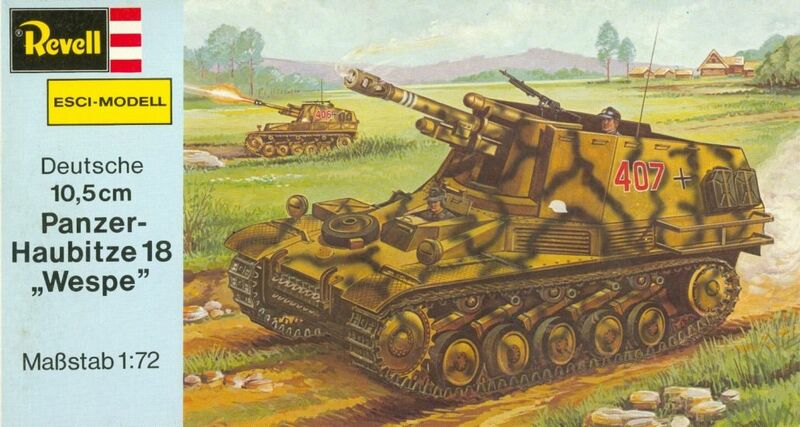 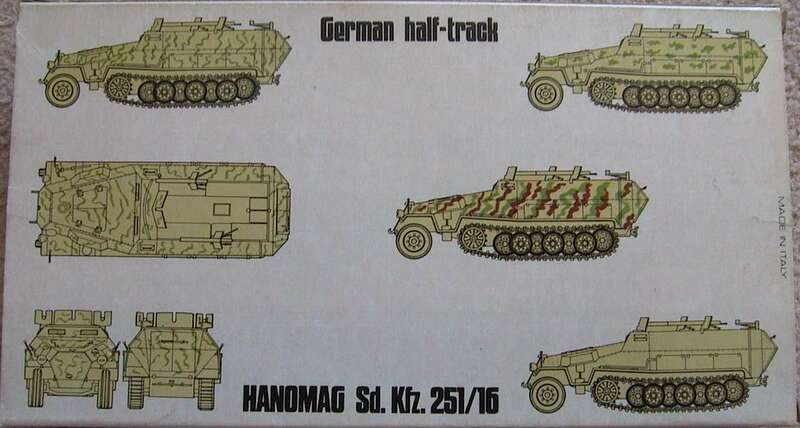 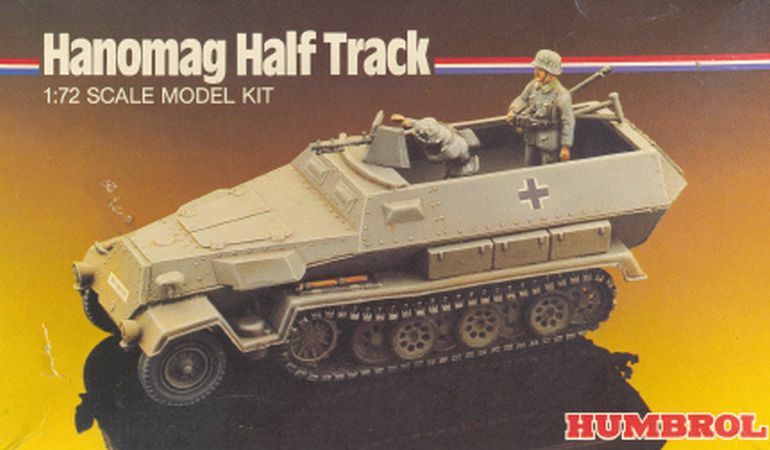 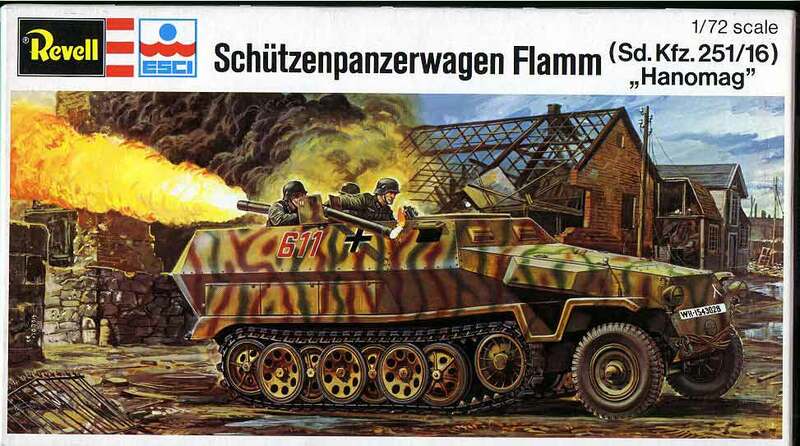 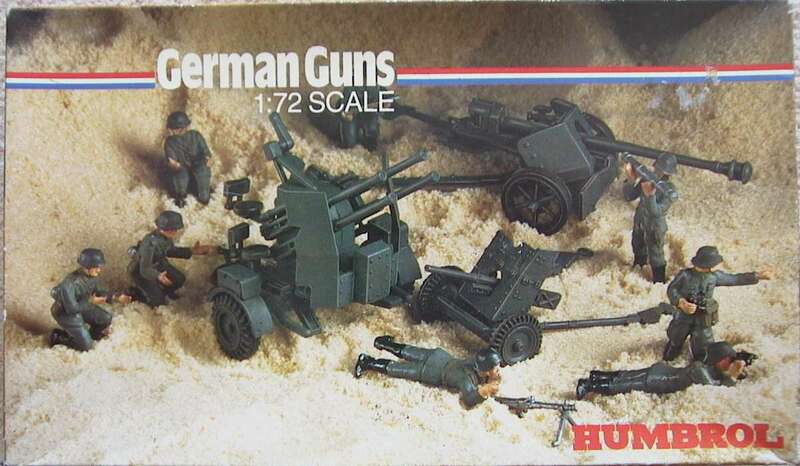 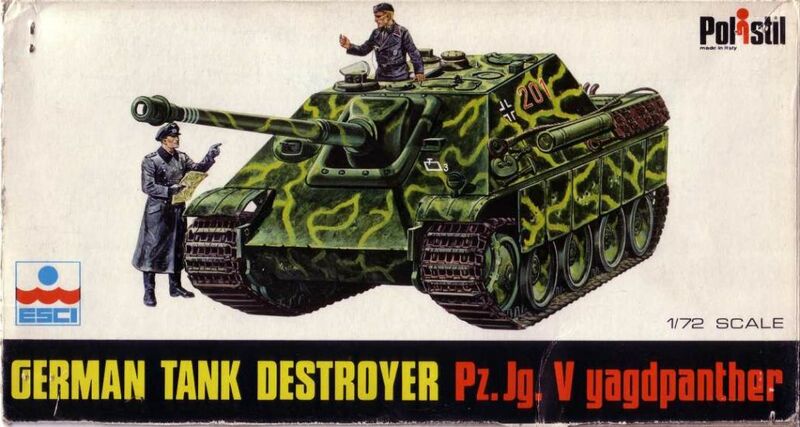 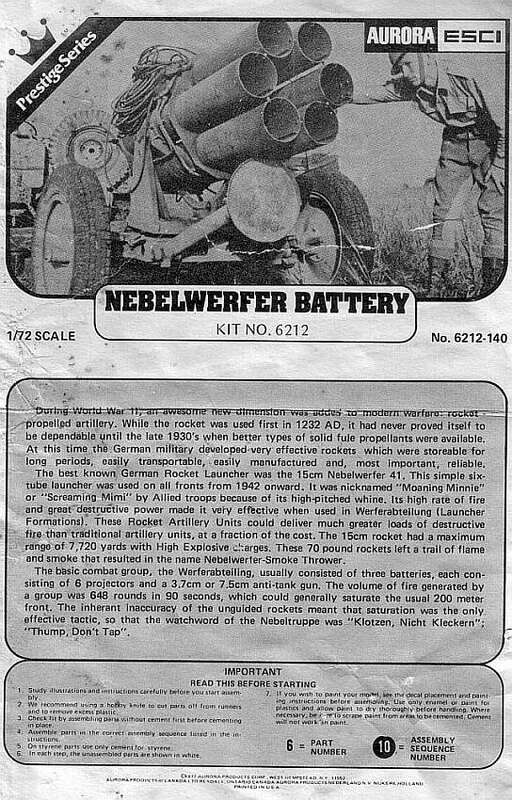 Kit 8307 - Sturmpanzer IV "Brummbar"
Kit 8548 - Marines "Iwo Jima"
From 1974 untill 1975 they produced 5 Esci Armor kits with their own boxart in flipopen boxes. 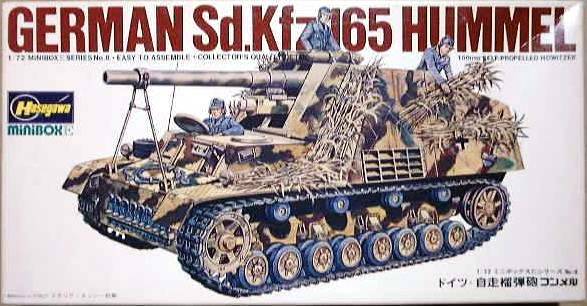 The last one, the Hummel 150mm SP is numbered out of sequence : 0559. 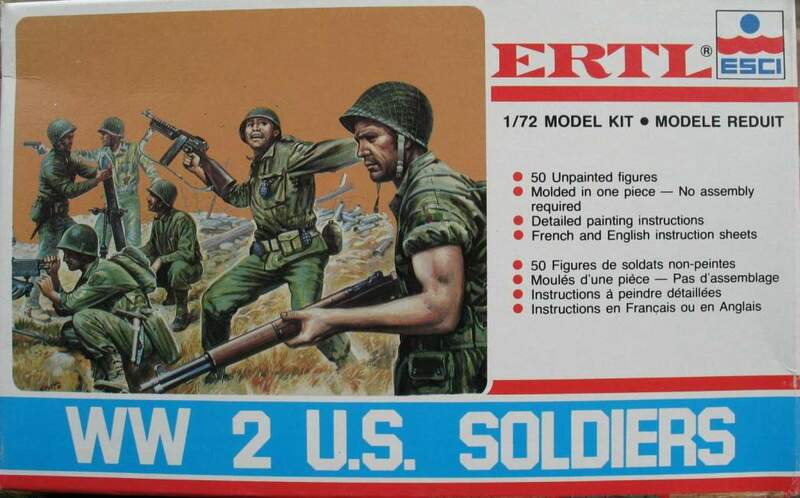 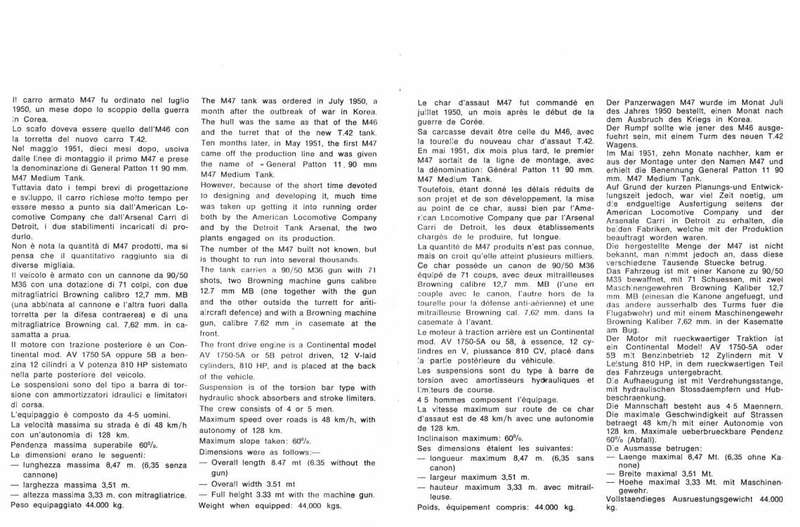 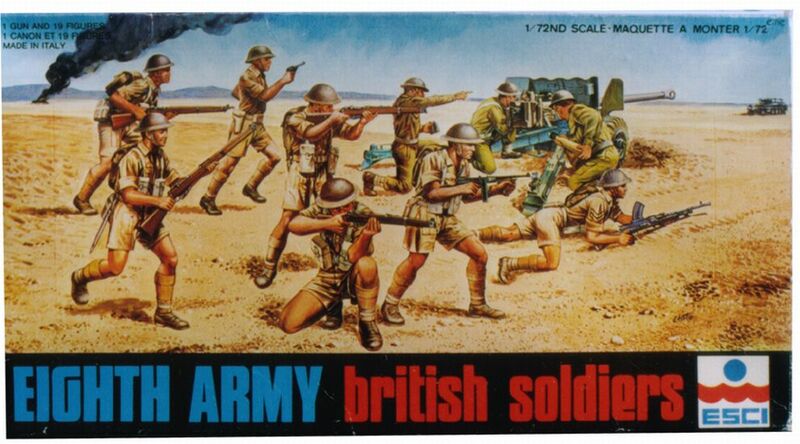 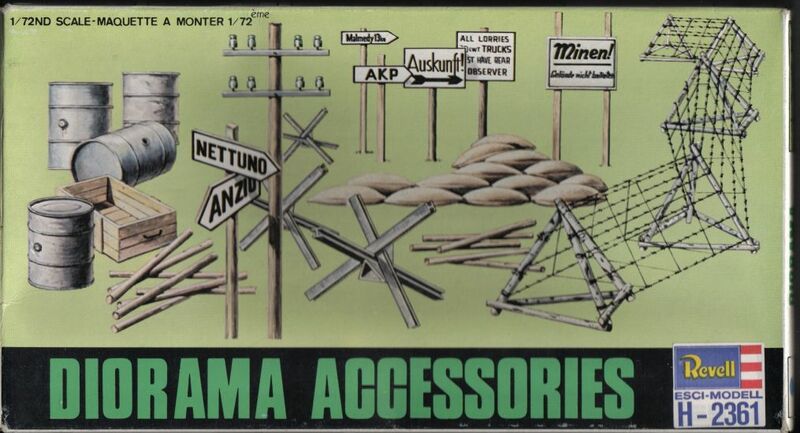 AMT produced a few Esci kits in 1989 and 1990 including two combination kits with soldiers. 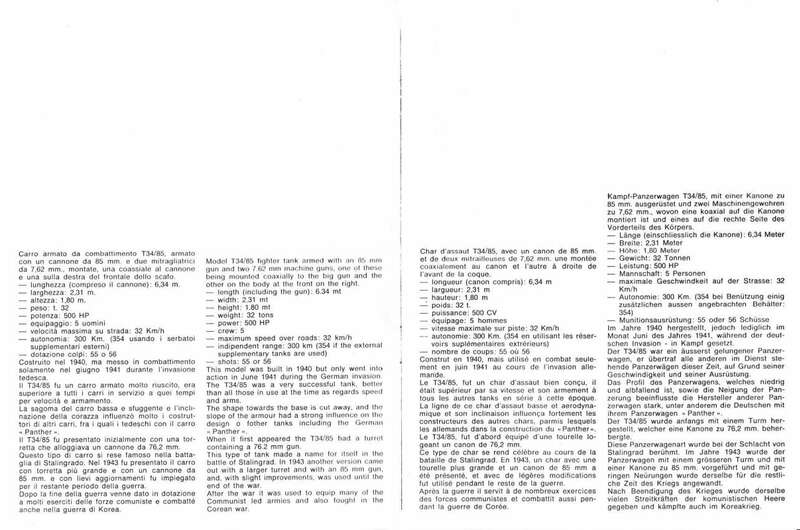 Emphasis on modern subjects. 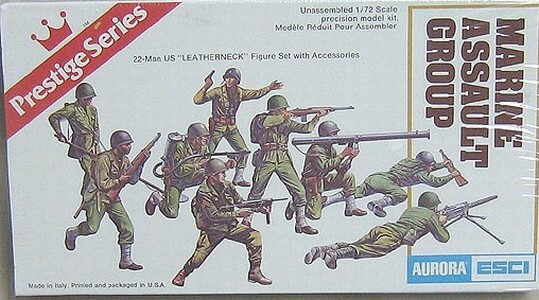 Mainly sold in north America/Canada. 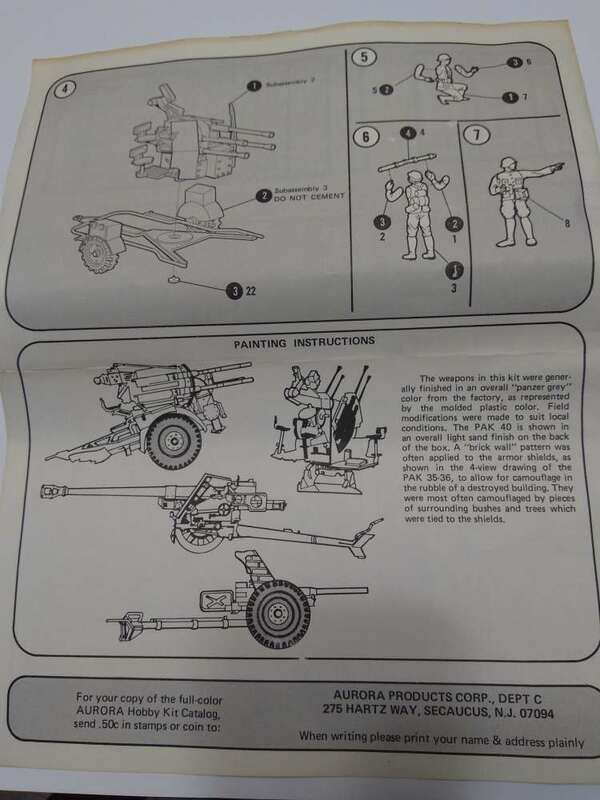 They have their own nice boxart and instruction leaflets. 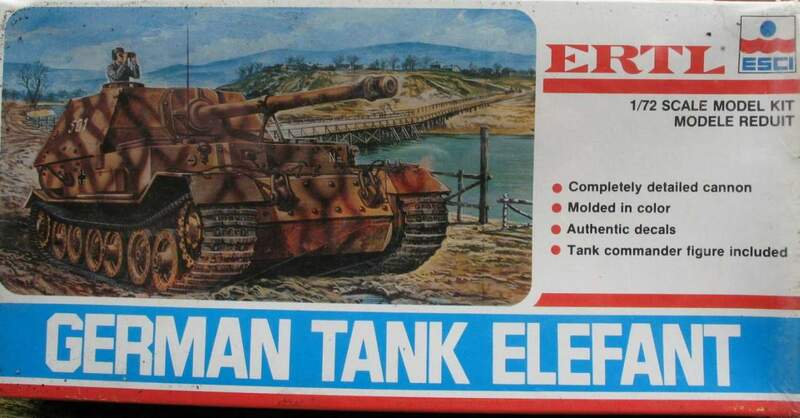 Decals are sometimes a little different from their mainstream Esci 8300 series counterparts. 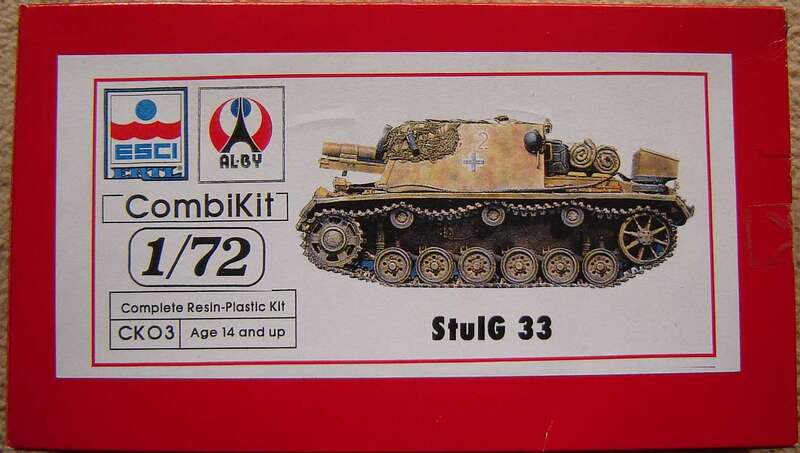 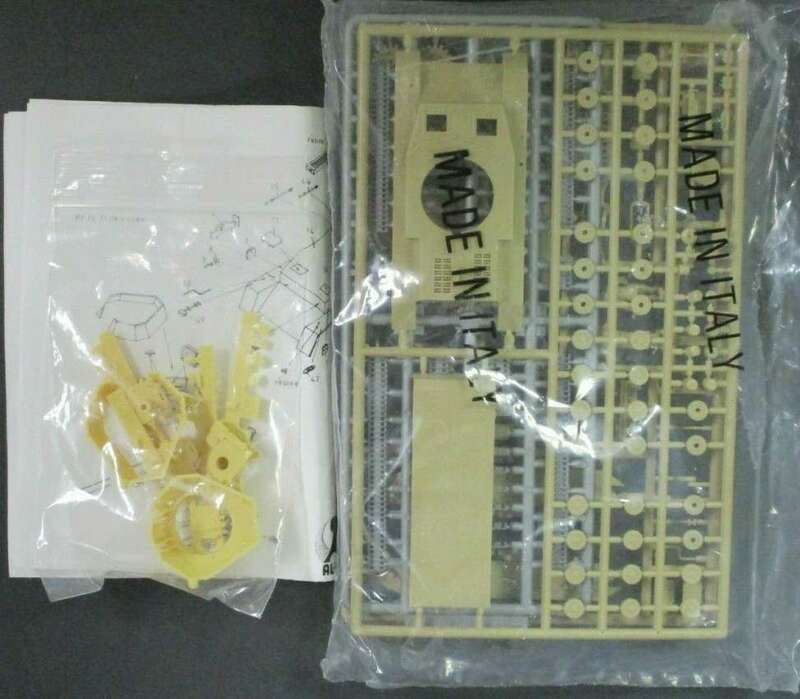 Some kits carry production dates and they have their own kitnumbers. 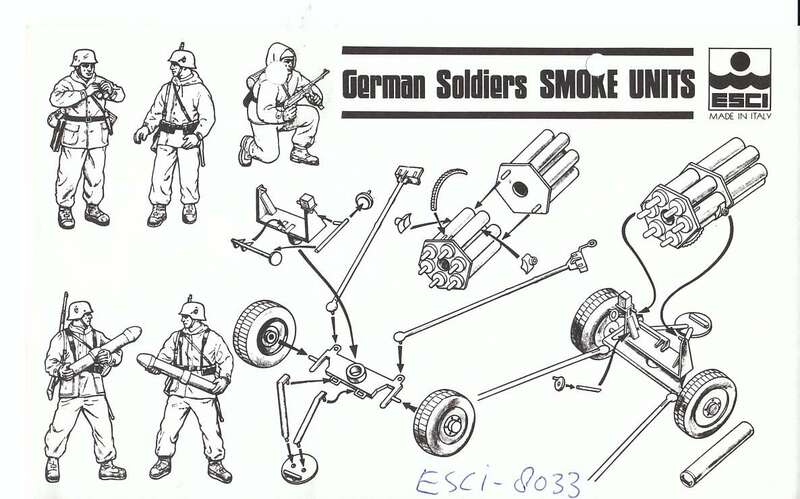 They are not rare but the combikits are not often seen. 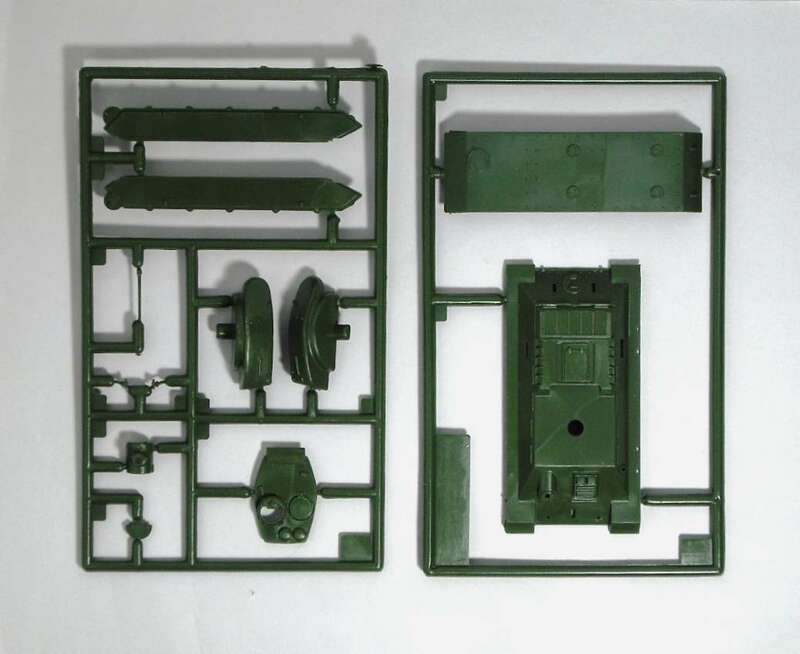 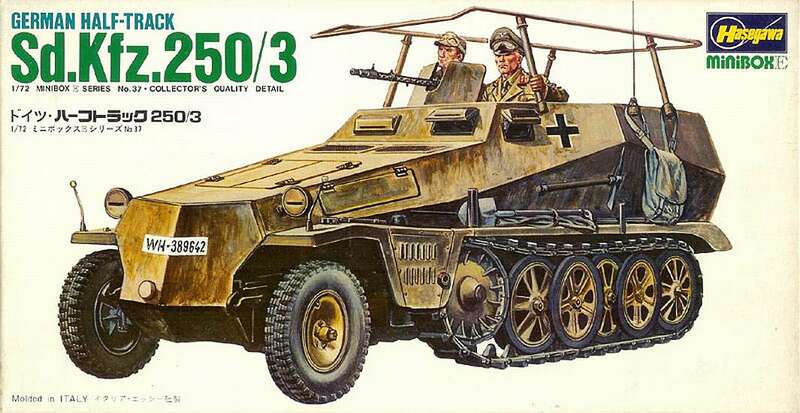 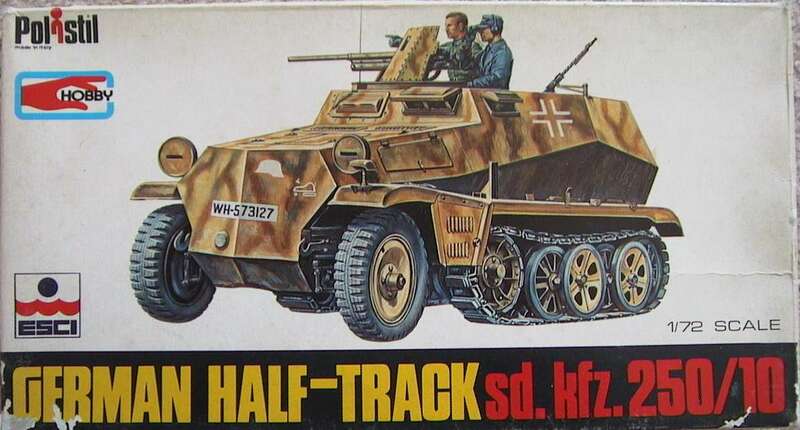 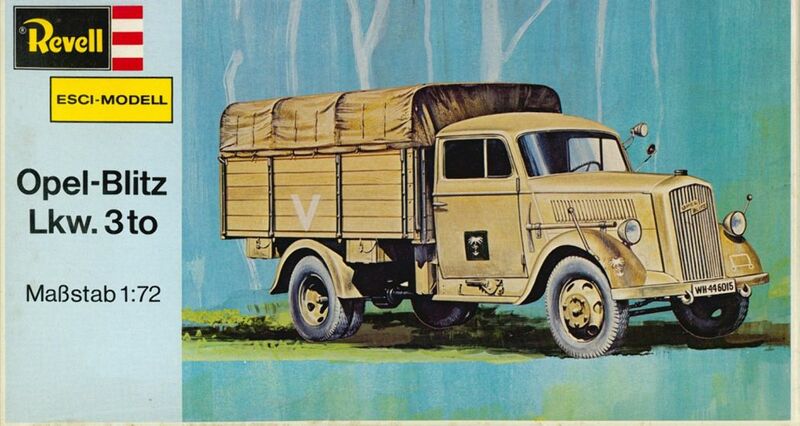 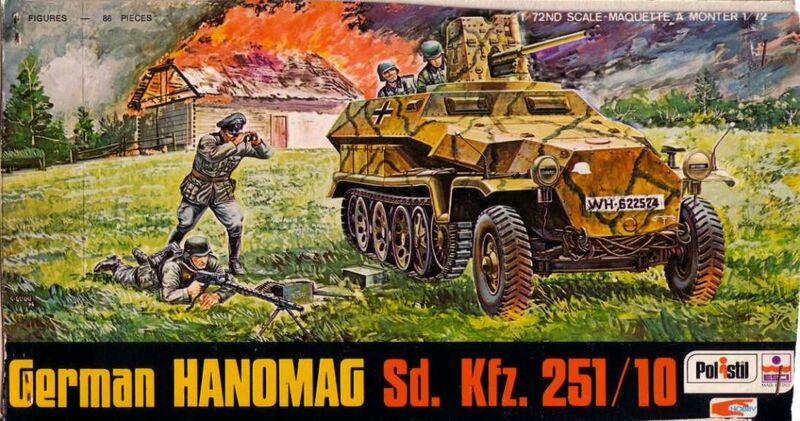 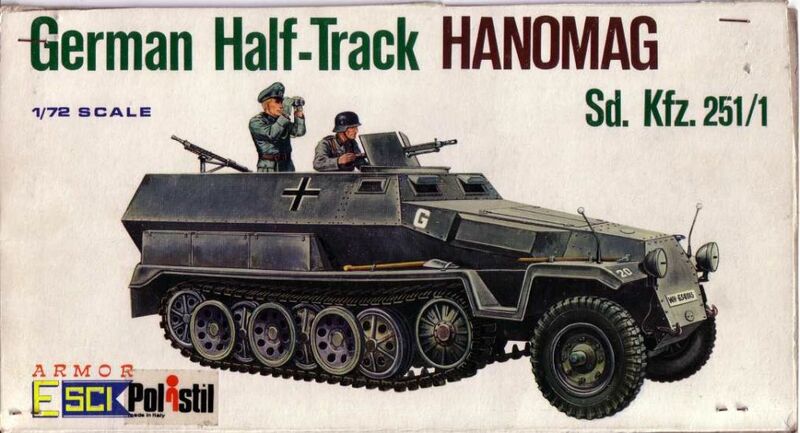 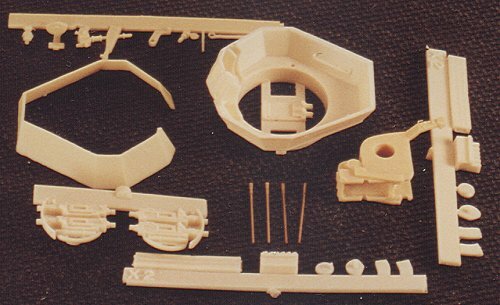 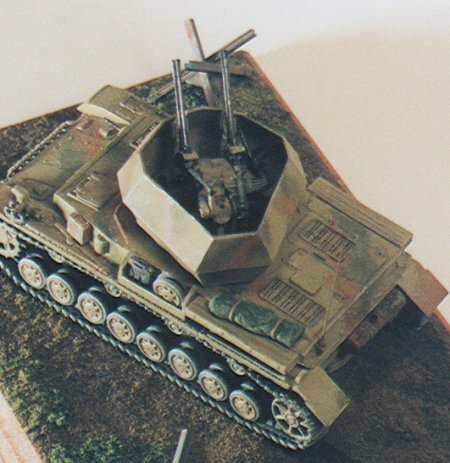 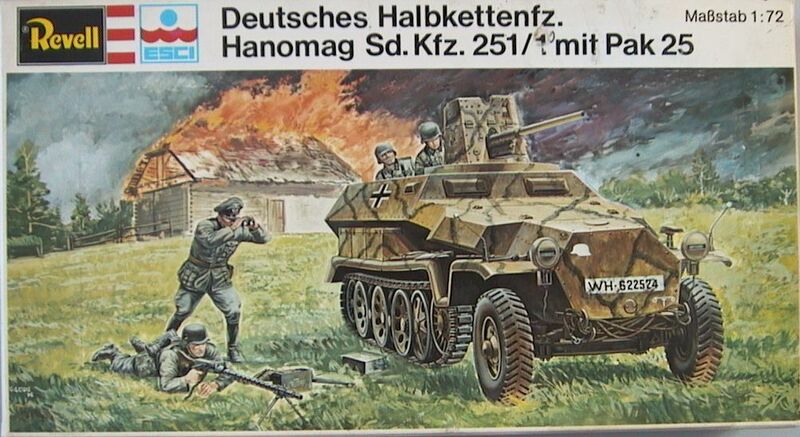 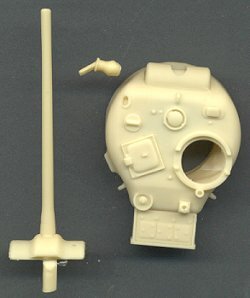 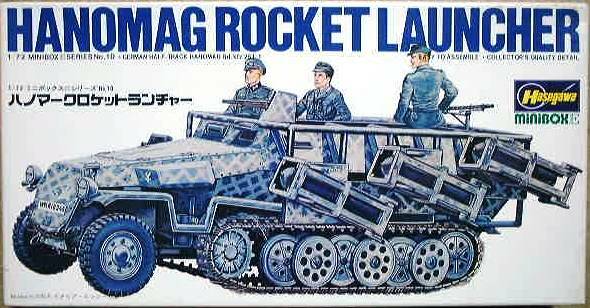 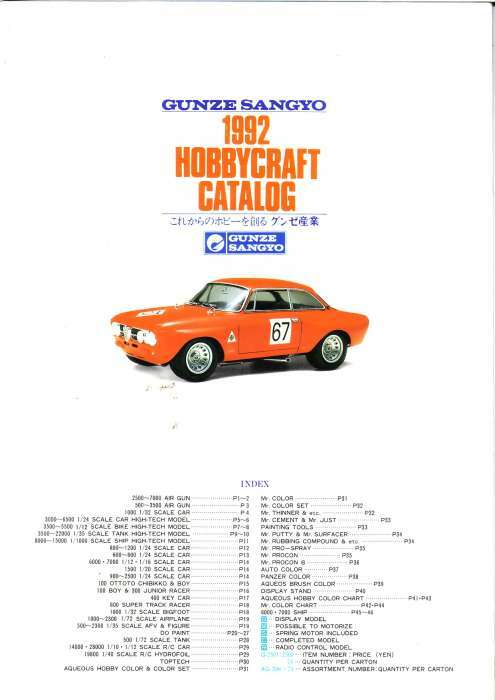 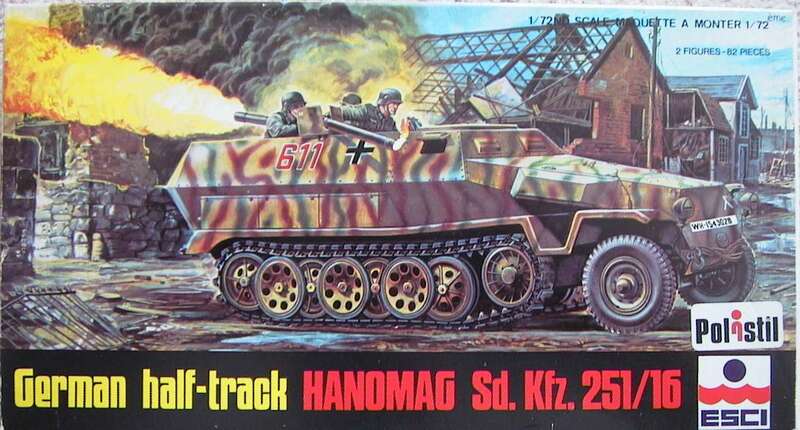 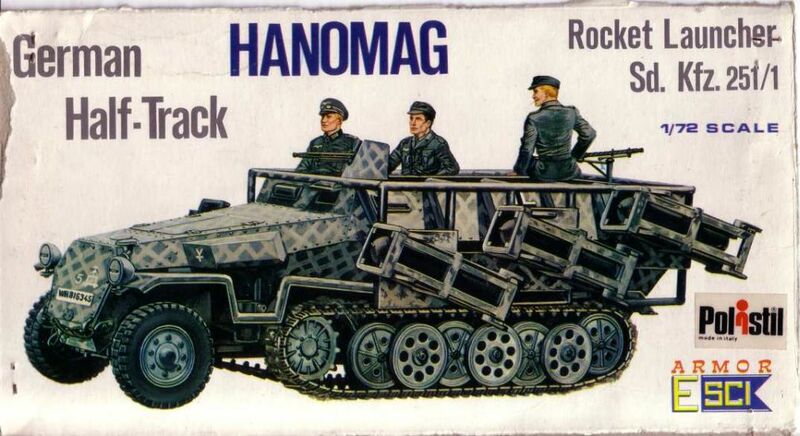 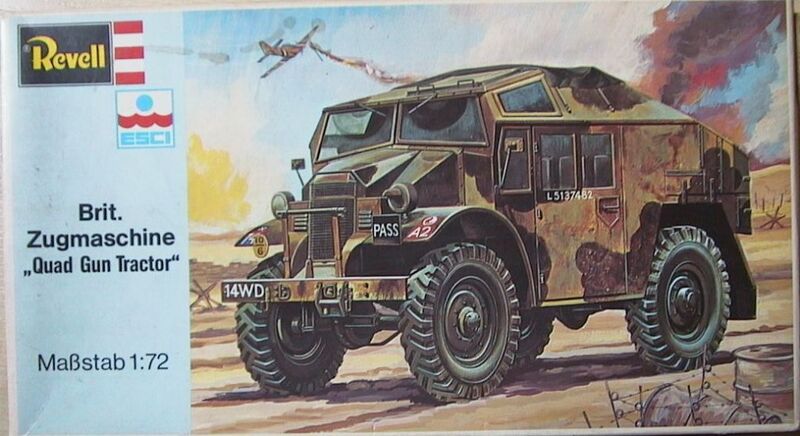 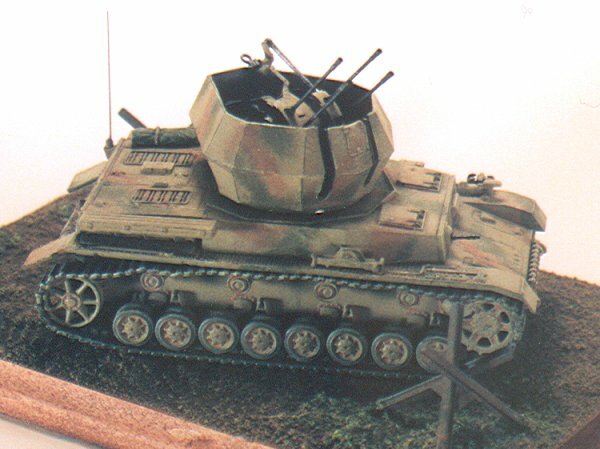 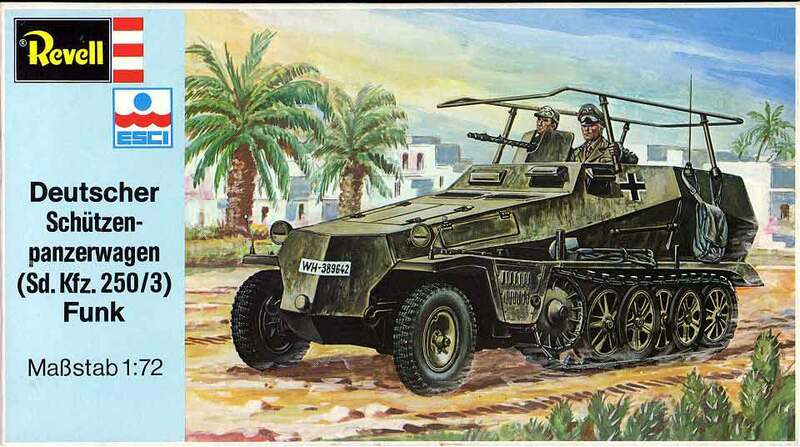 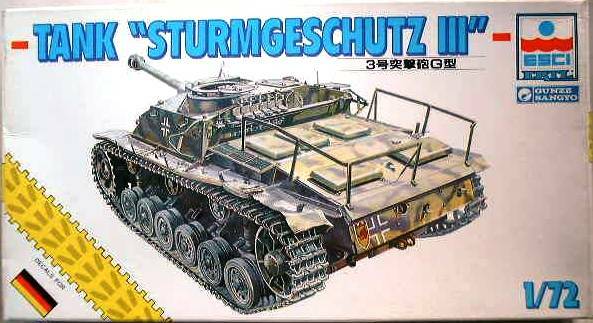 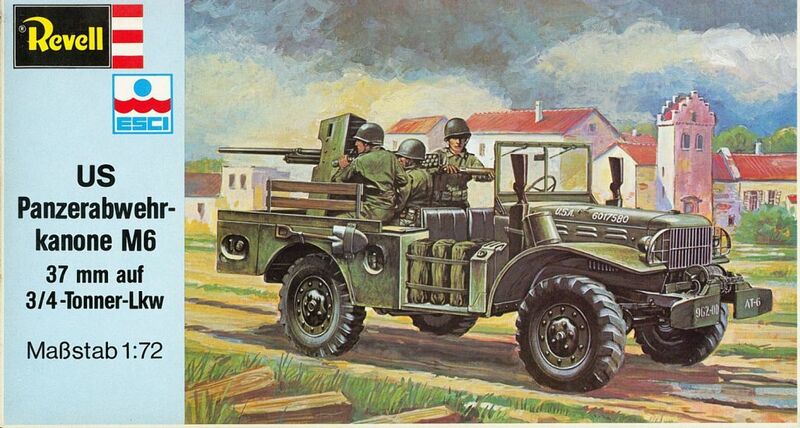 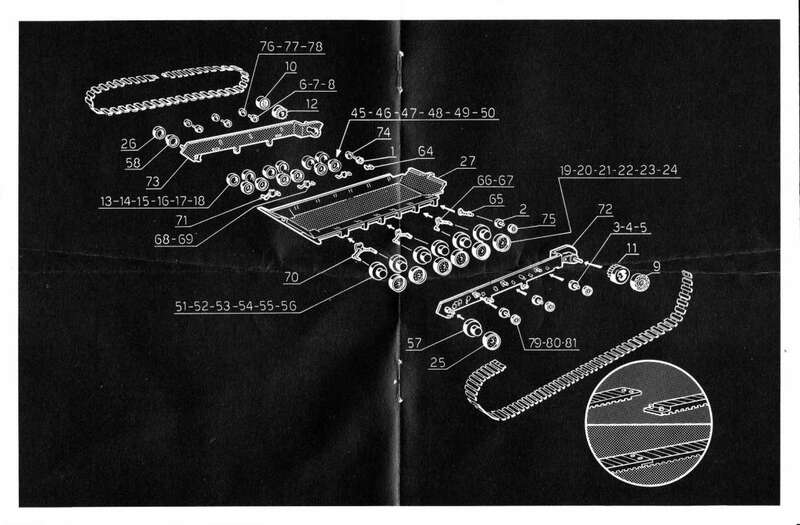 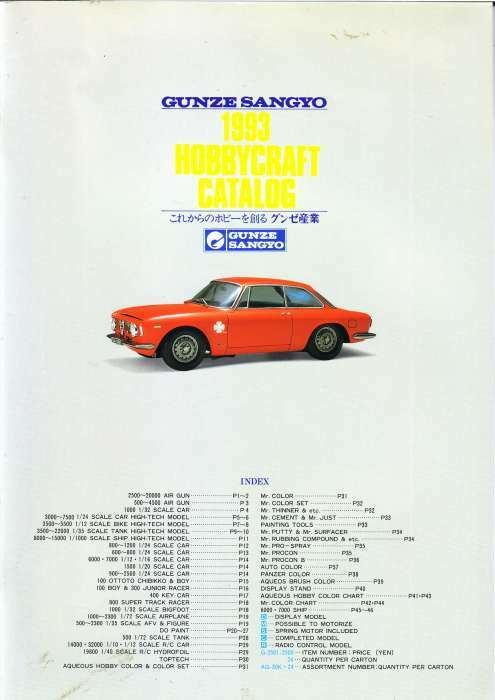 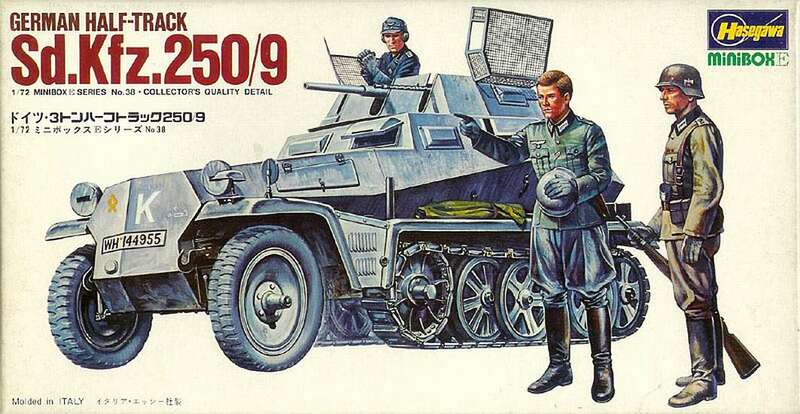 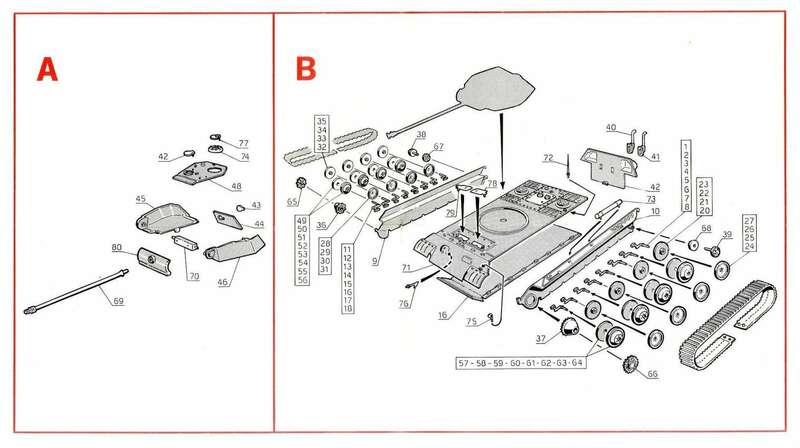 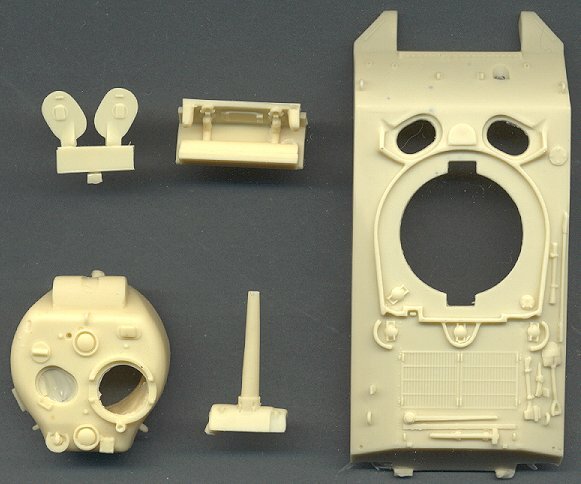 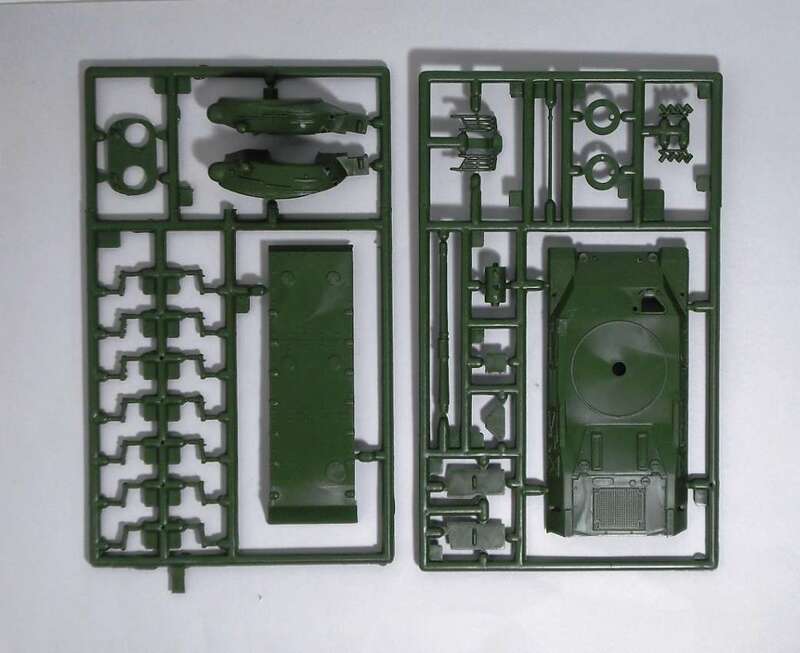 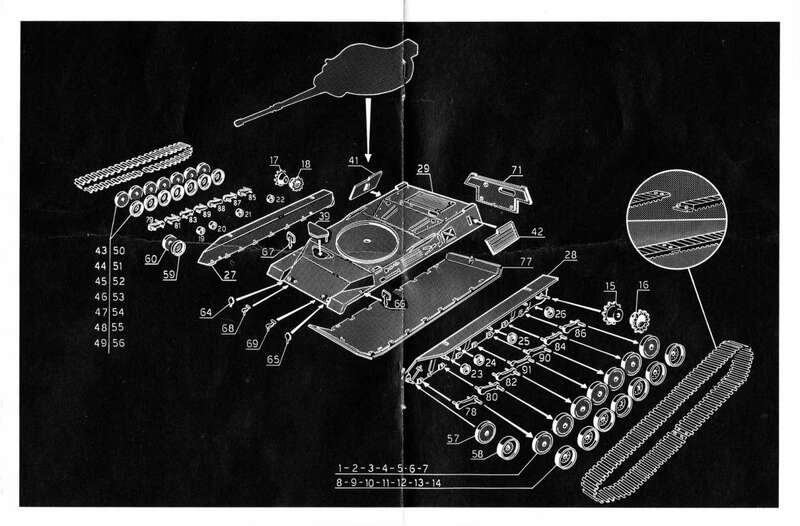 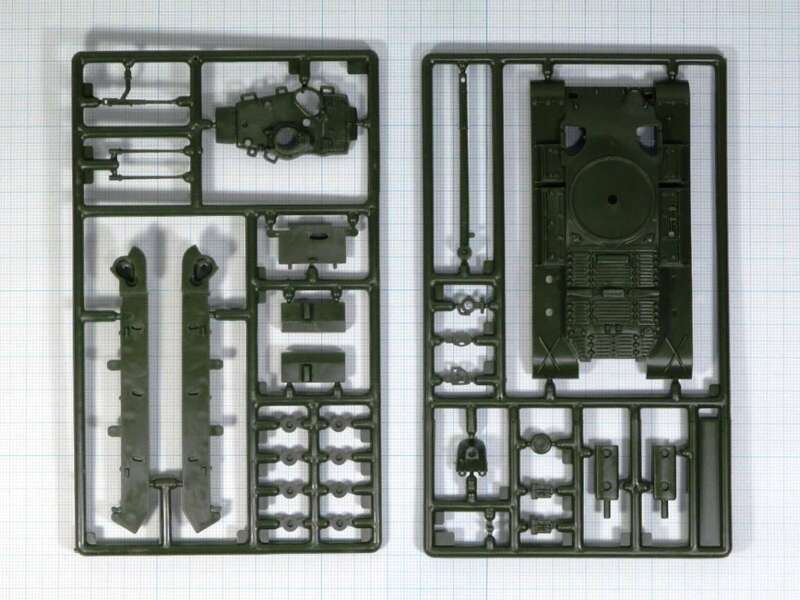 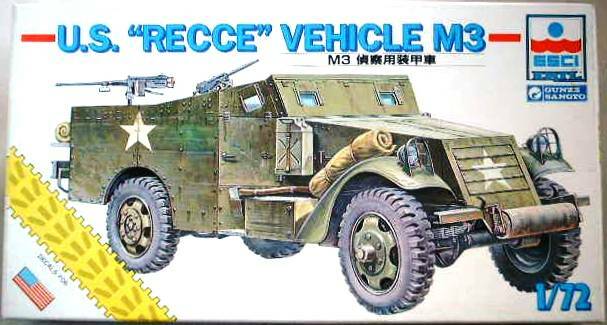 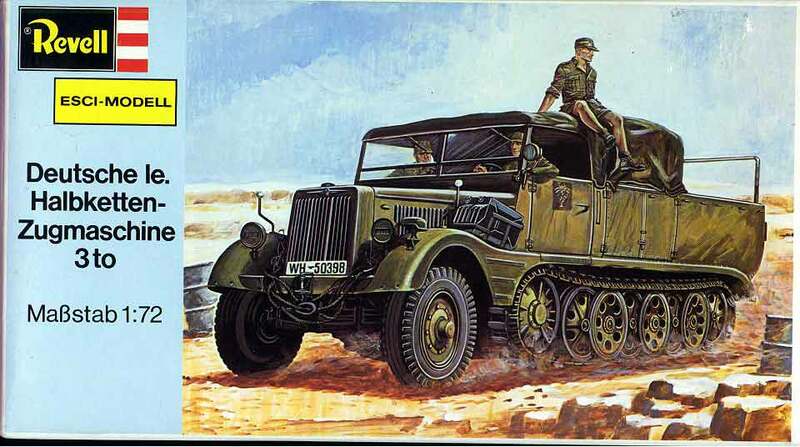 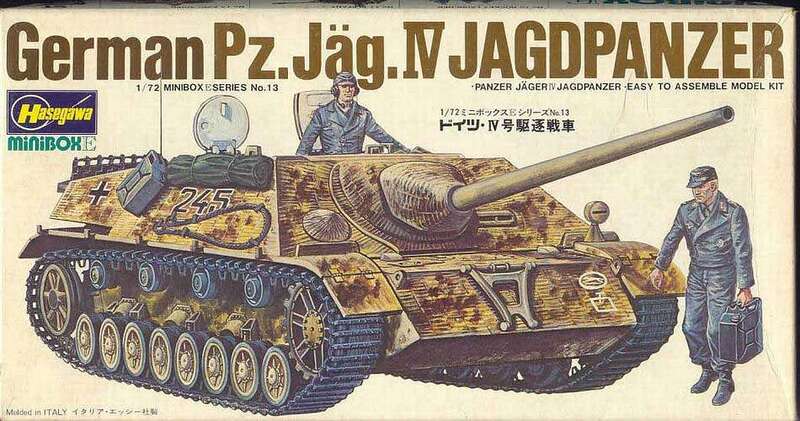 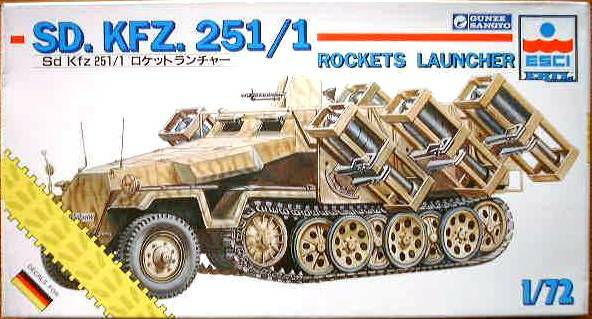 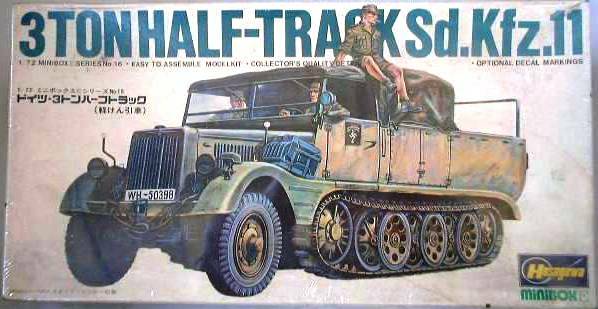 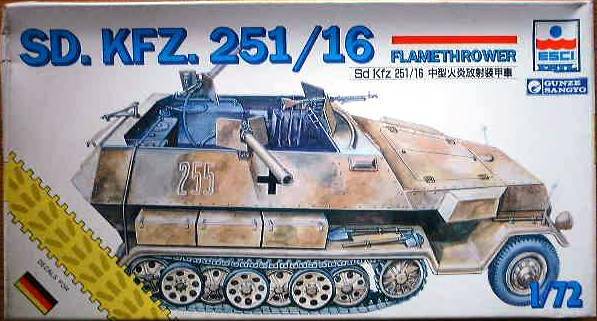 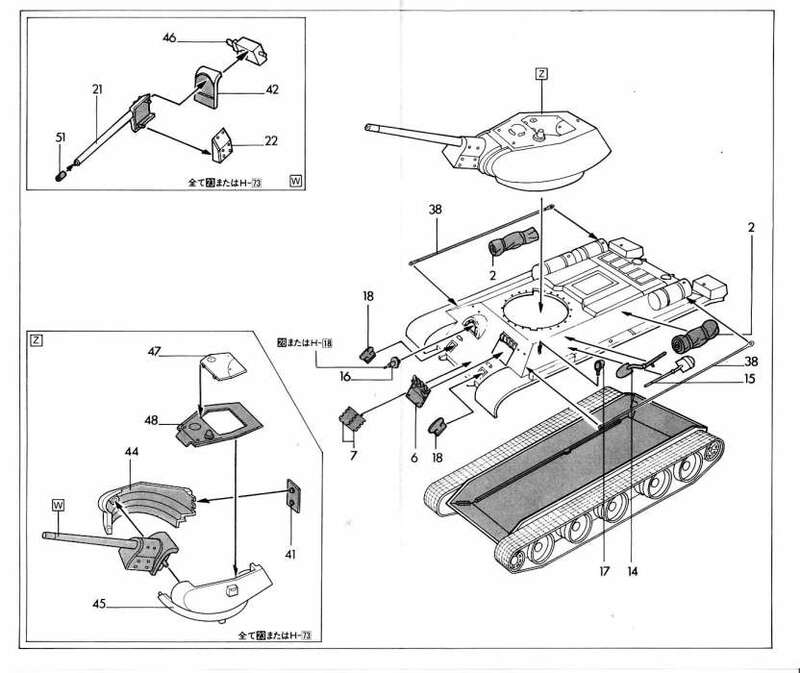 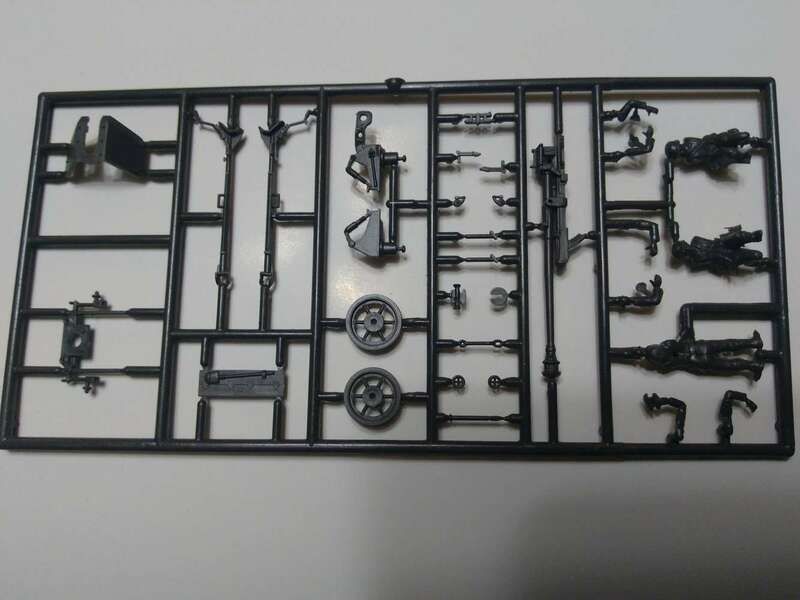 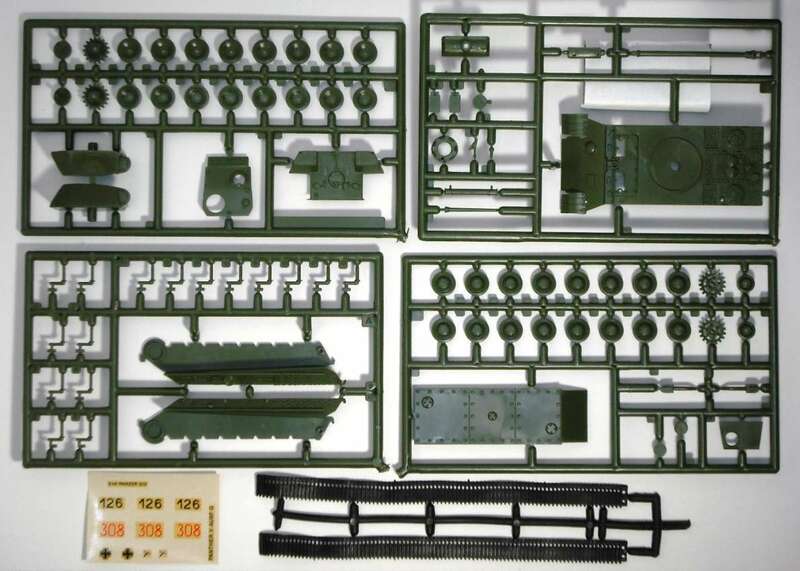 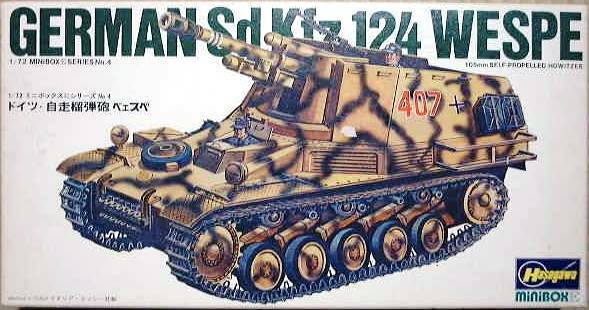 Hasegawa pruduced a large series of Esci kits in 1975 and 1976 with The SdKfz 250/10 as highest Esci number (8051). 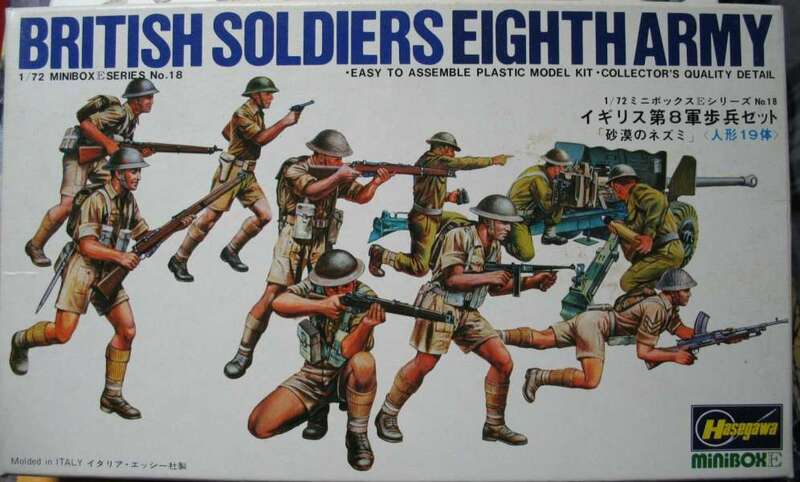 The kits with the soldiers have smaller flipopen boxes and their backsides show a combination picture with a Hasegawa kit. 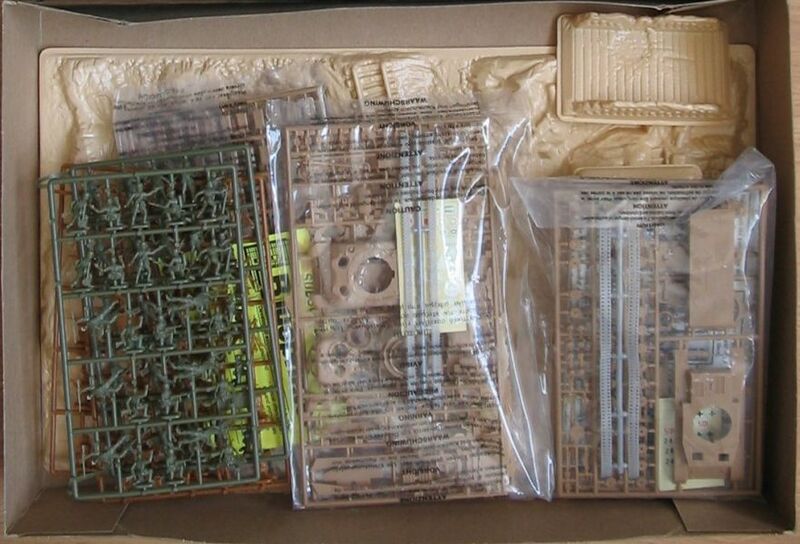 The Armor kits are the same size flipopen box as the Esci-Armor series and have the same color profiles at the backside. 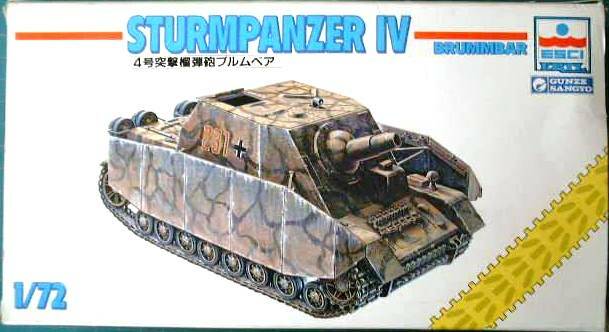 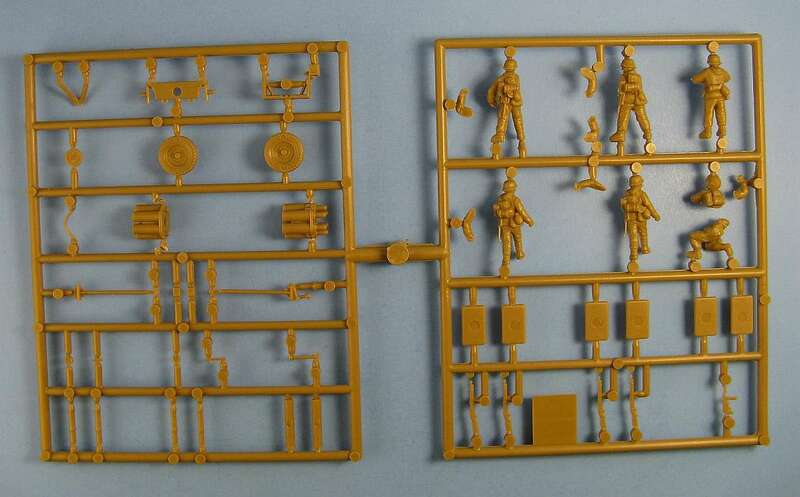 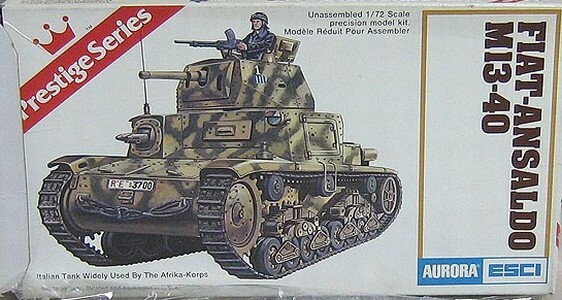 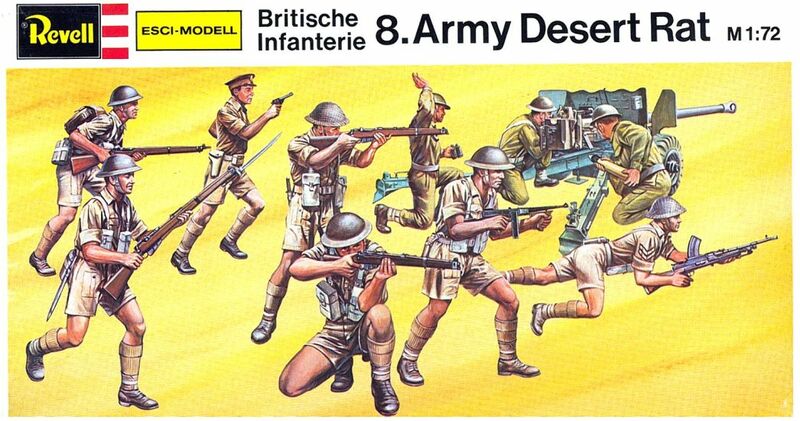 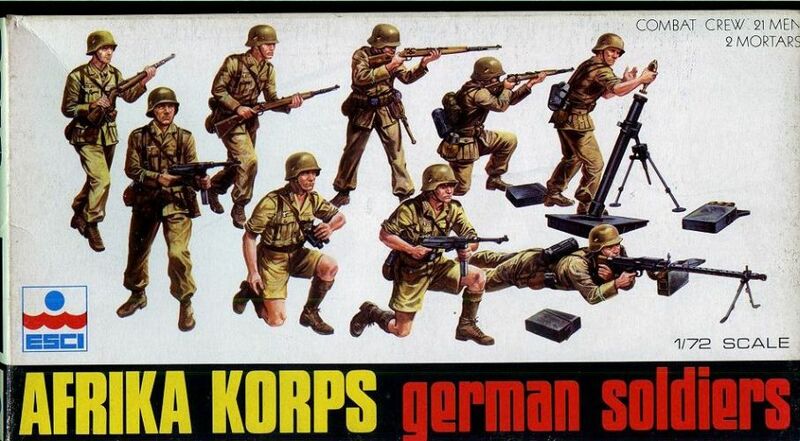 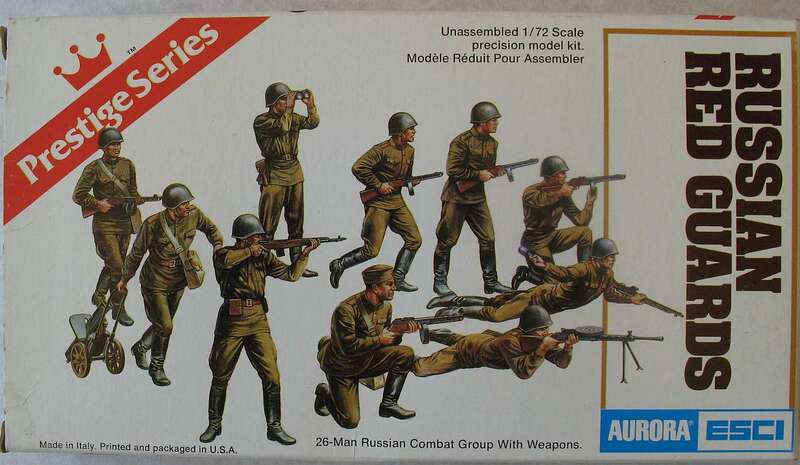 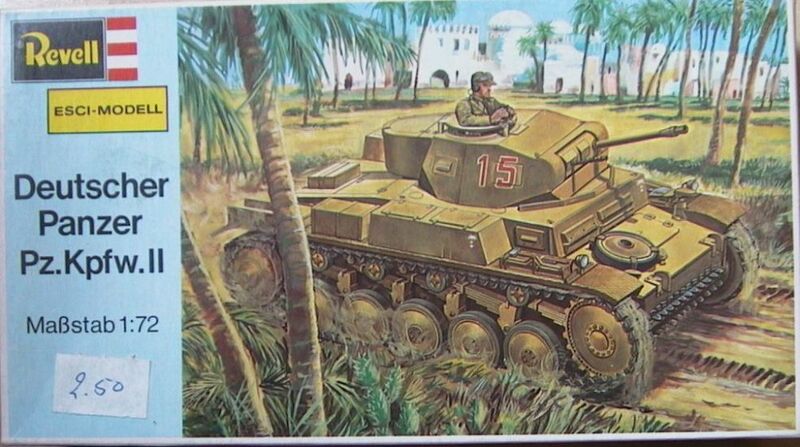 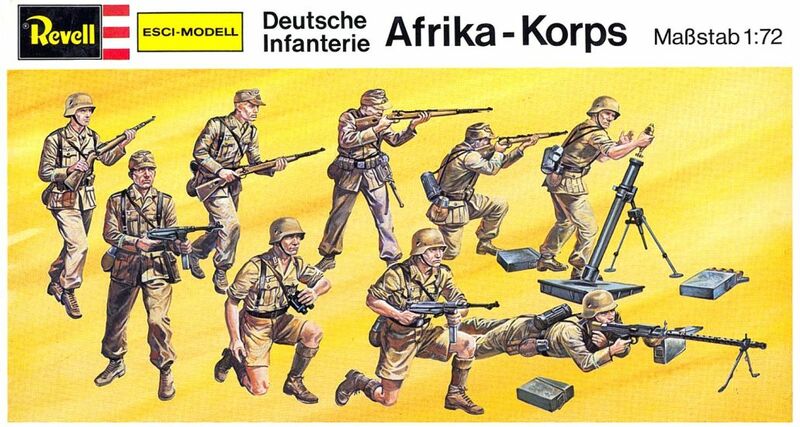 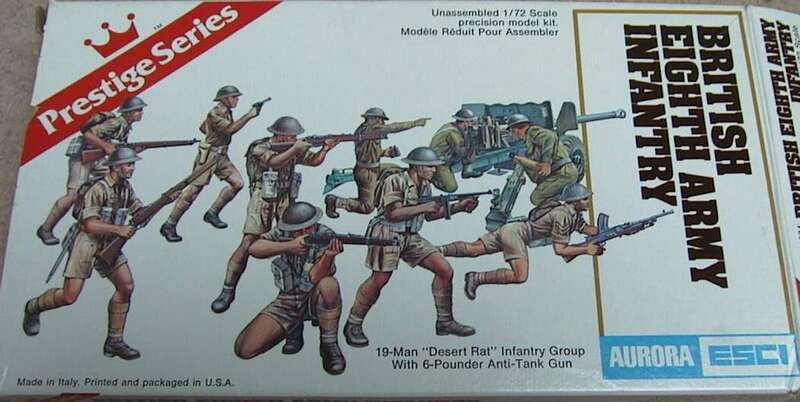 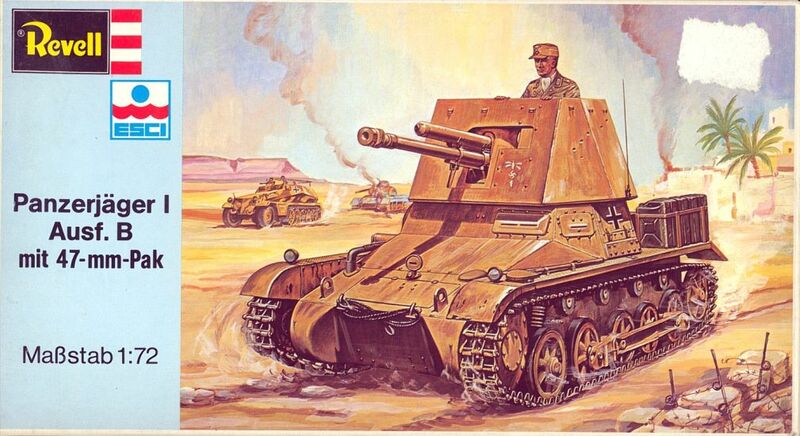 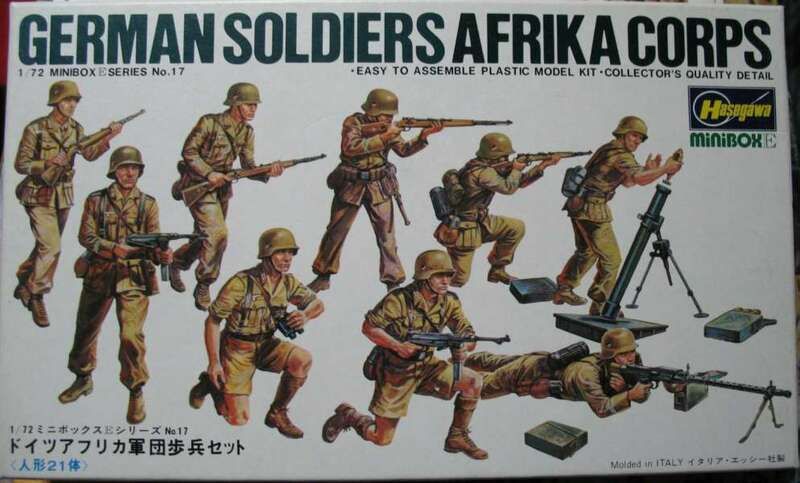 The numbering of the kits is typicly confusing Japanese style : kit Afrika Korps Soldiers front of box states : Minibox E series No. 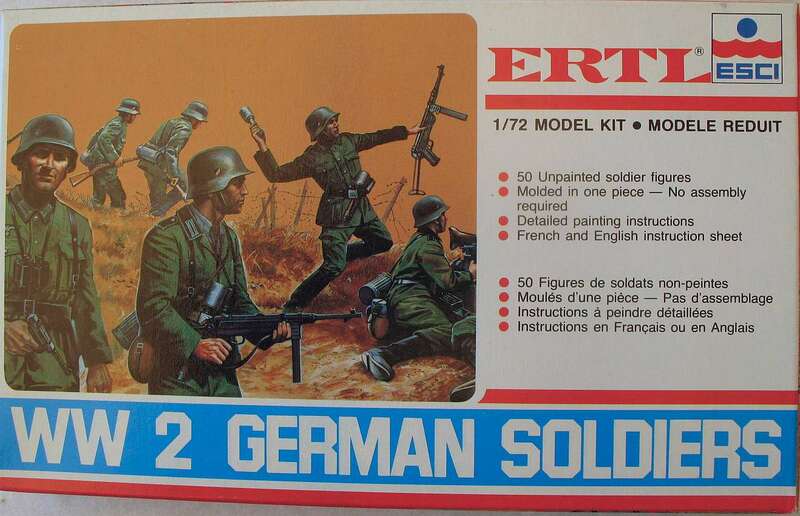 17 . on the side of the box is : Kit No. 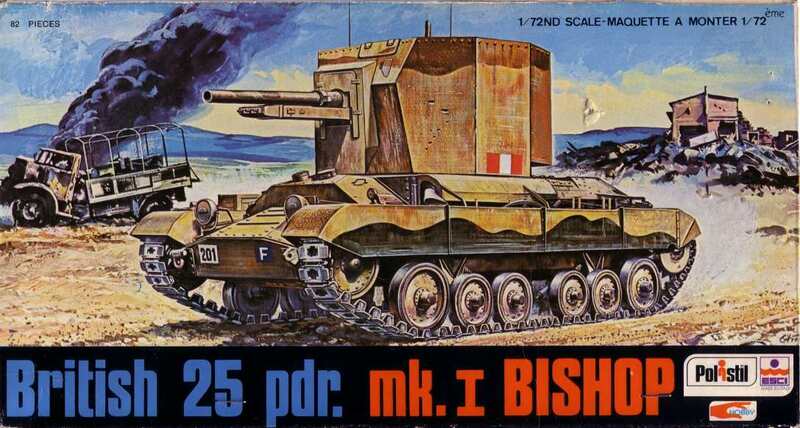 MB-117 : 250. 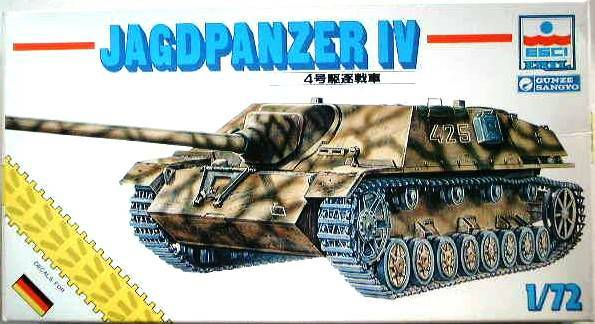 The last three numbers on Japanese kits is usually a production run series number (examples: 100, 150, 250, 300 etc). 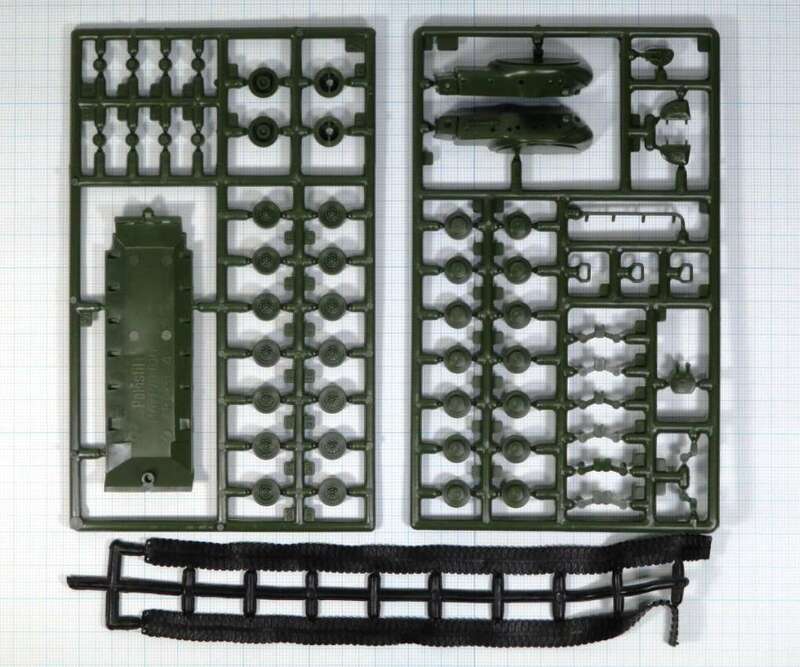 To confuse further on the side-edge is : Hasegawa E17. 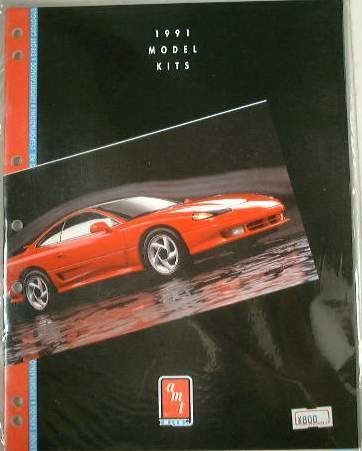 All these Esci-Alby kits are in a red flipopen box with a color picture glued on top. 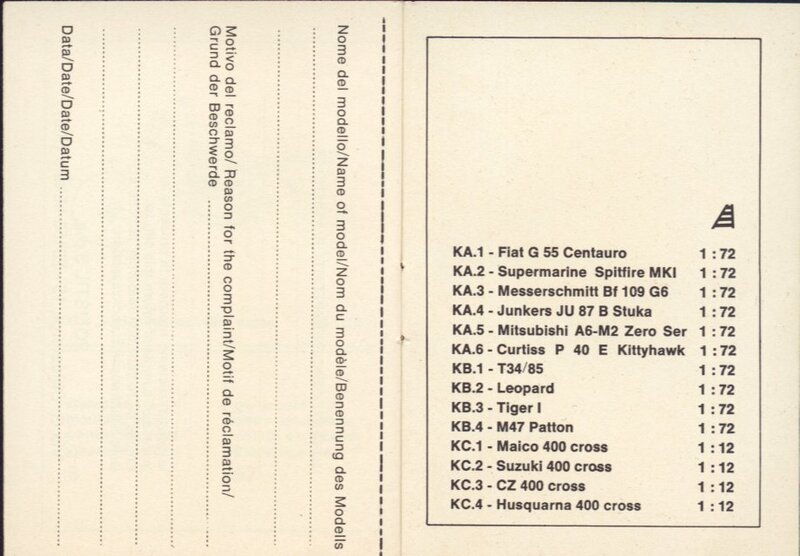 Out of production, rare and expensive ! 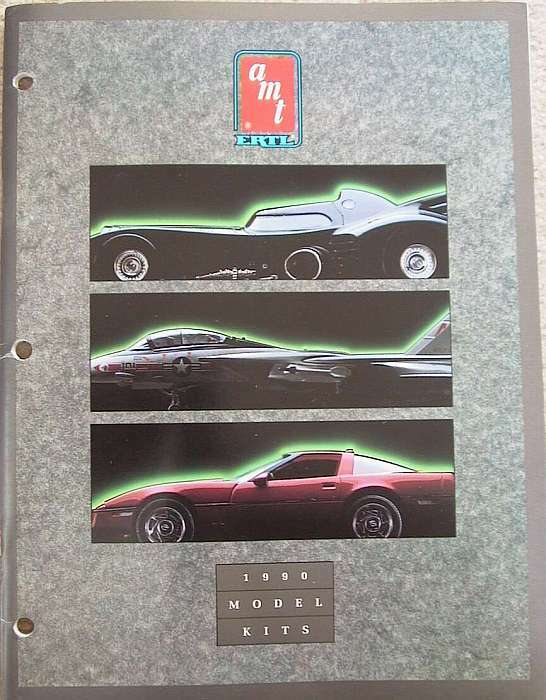 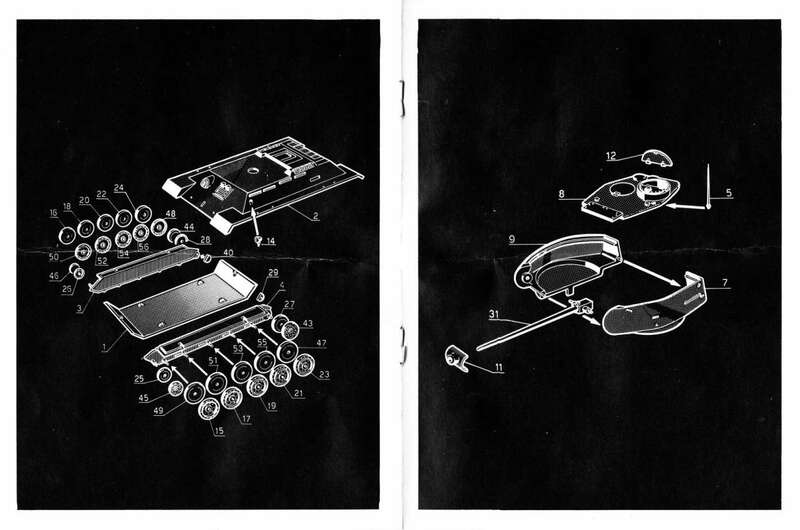 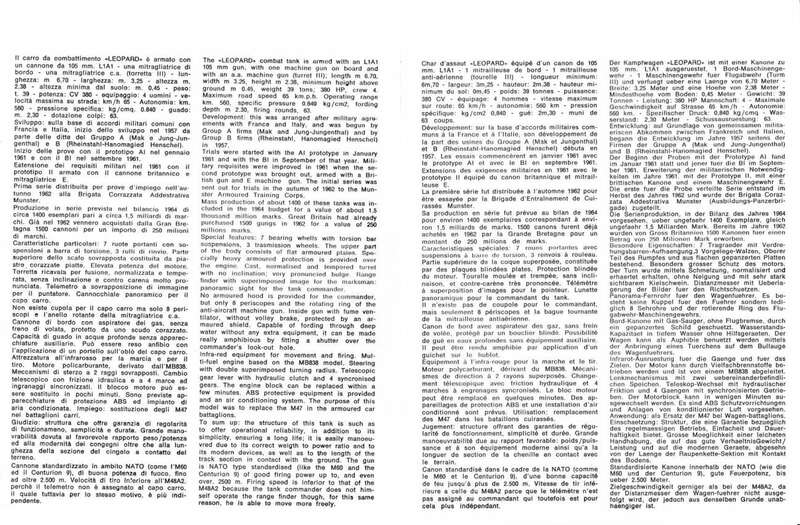 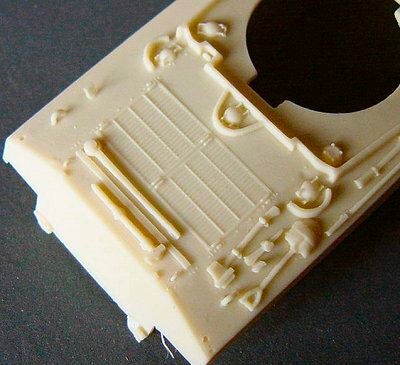 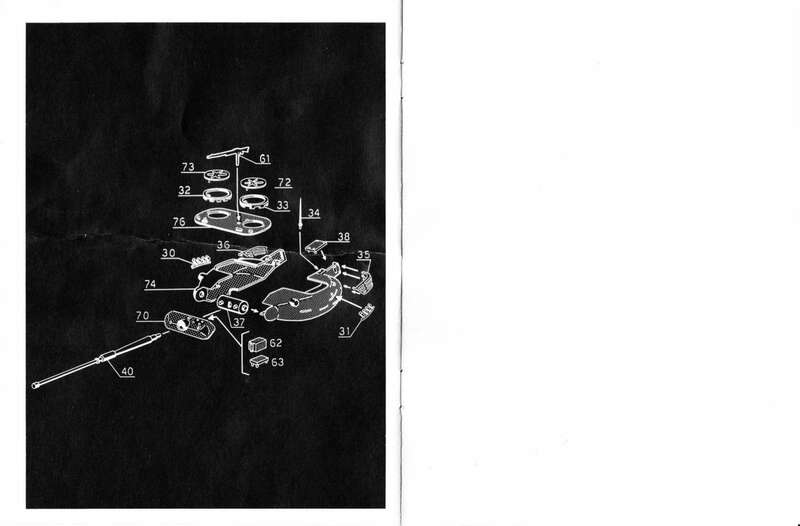 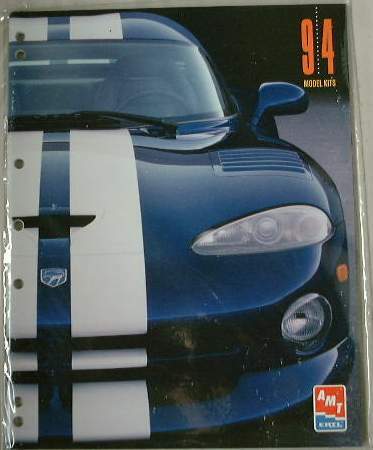 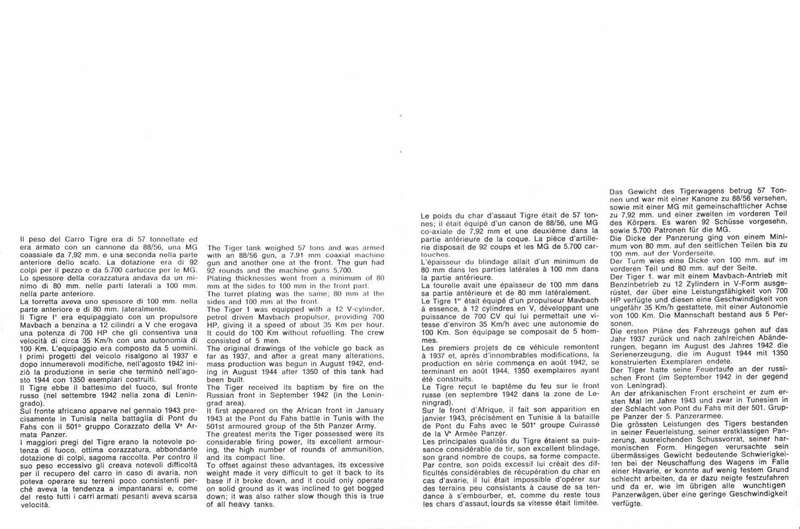 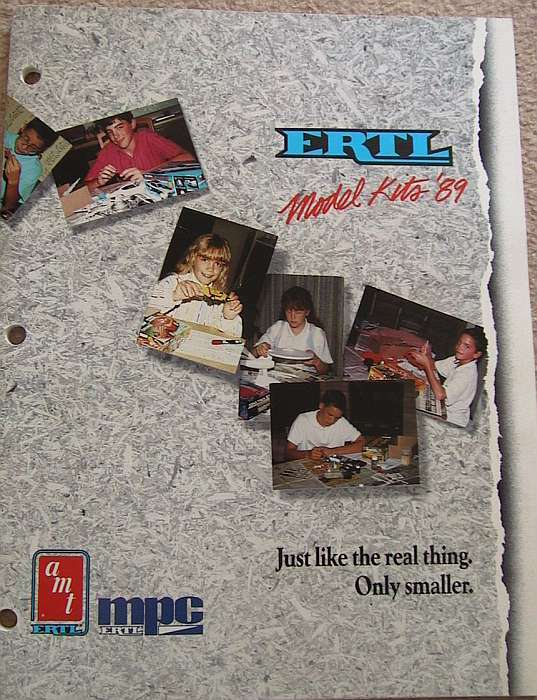 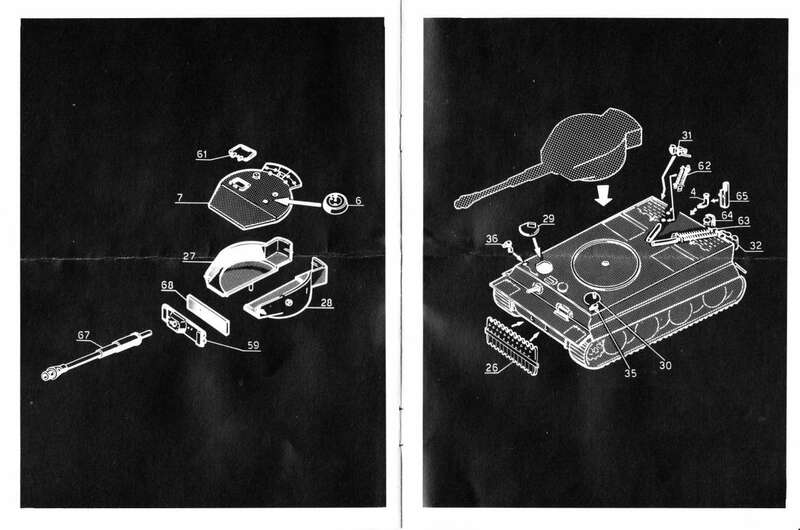 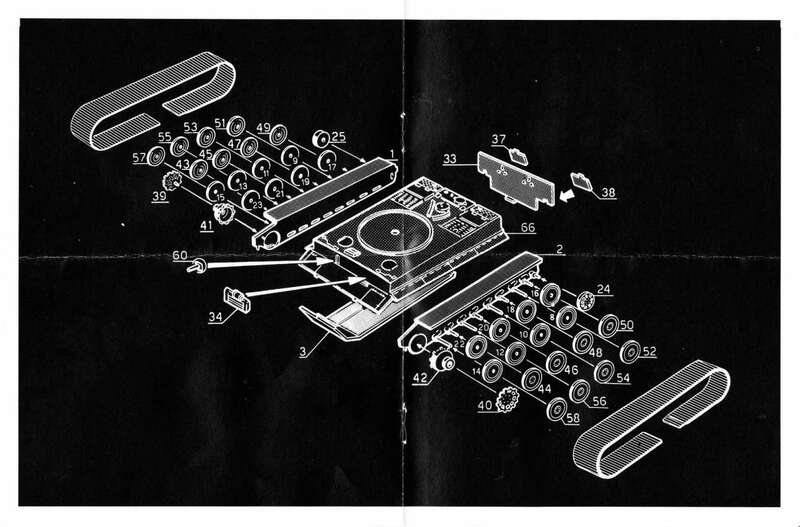 Who is so kindley to help me with 1:1 scans from the original Esci Box-tops?